Fifty six years ago, the World’s Brightest Star took her final breath and left millions of fans in a state of shock and disbelief. No one could understand why this young beautiful talented woman, loved by so many, could leave Earth in such a heartbreaking manner. An autopsy was performed and the official cause of death was ruled as, “probable suicide” noting how Marilyn had experienced, “severe fears and frequent depressions” throughout her lifetime. However, an extremely large number of people still to this day could not except this as fact, fueling an enormous amount of conspiracies from the incredulous to down right bizarre about this very special human. Marilyn by Bernard of Hollywood in 1946. Ultimately, the only person who knows what happened to Marilyn on the night of her death is the lady herself and many can speculate for hours and hours but will still not have the precise answer they’re looking for. 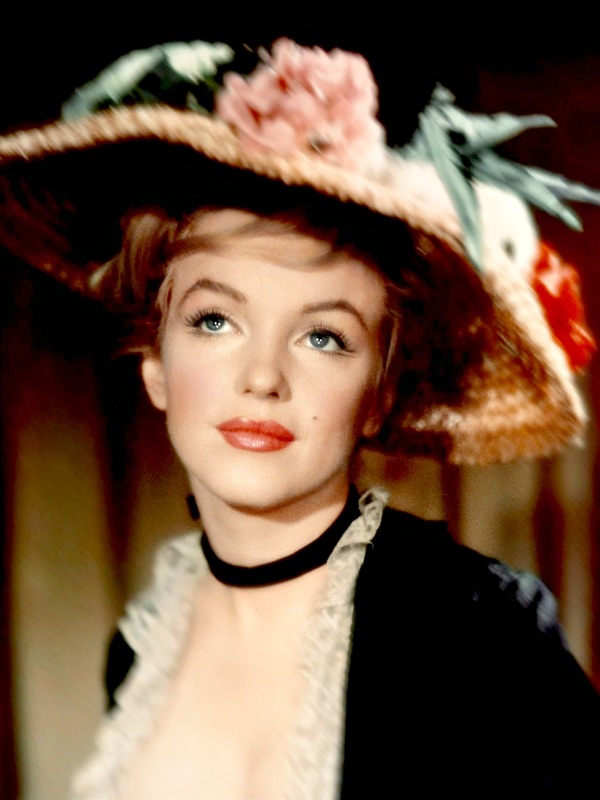 Marilyn’s tragic death should not and does not define her, she lived for 36 years and experienced and achieved more than many could wish for in a whole lifetime. She pursued her dreams fearlessly, constantly striving to reach her goals and become the best actress and person she could be – that should not be forgotten. 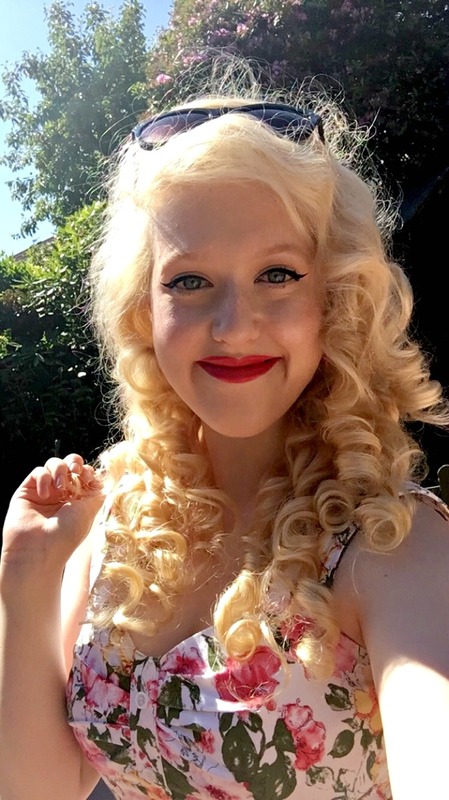 Personally, I believe her death was due to medical negligence, either accidental or possibly intentional – Marilyn did have a few attempts of suicide over the years, but her anxiety and depression could often change and I don’t think she wanted to leave the world forever, maybe just in that moment. 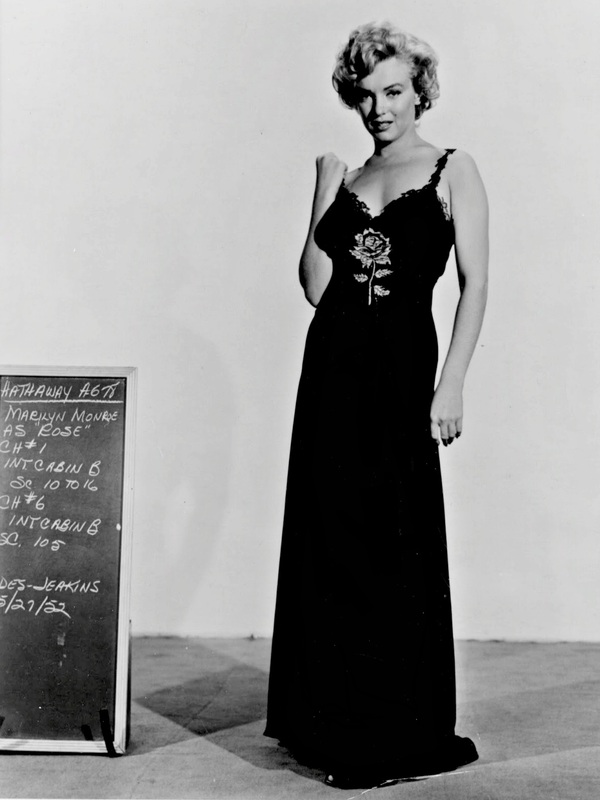 Marilyn makes her television debut on The Jack Benny Show by Frank Worth in September 1953. 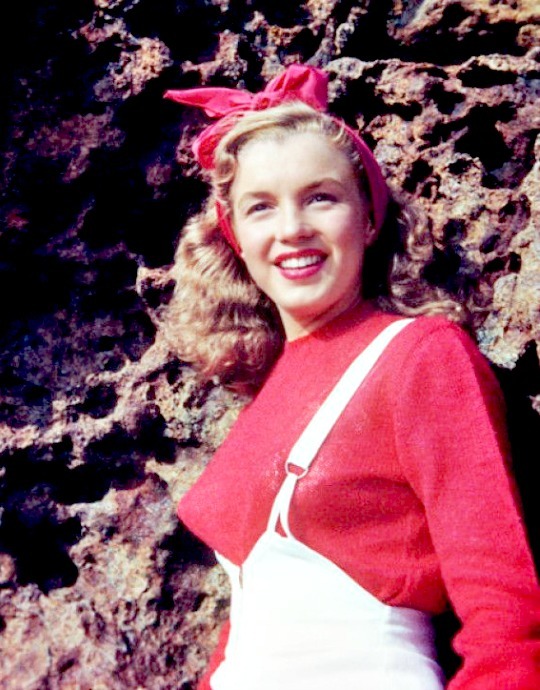 However, I don’t want to dwell on Marilyn’s final moments on Earth and I’m sure she wouldn’t want that either, the focus should be on the beautiful person she was and the unique life she had. When people pass young and unexpectedly, conspiracies and in some cases, morbid curiosities take over and in time this can dehumanize the person and make many forget about who they truly were. Furthermore, when someone has already obtained legend status in their lifetime, it can be further exaggerated and influenced when they are no longer here to speak for themselves. Marilyn by Milton Greene in September 1954. 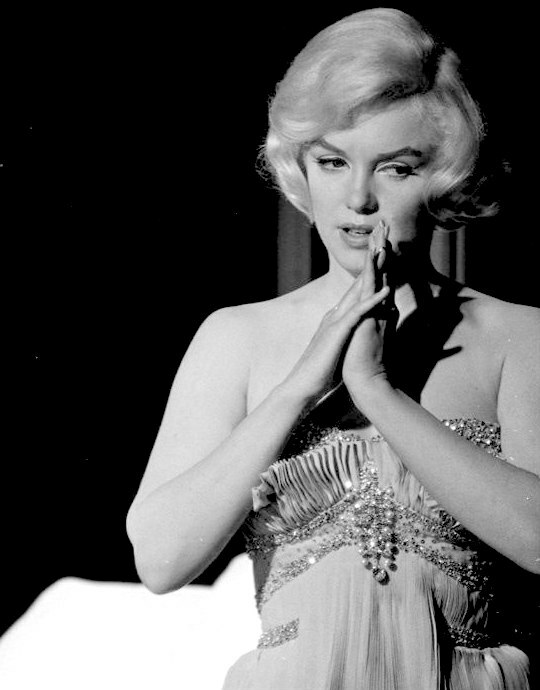 Just because Marilyn was and will always be Hollywood’s most brightest star, that doesn’t mean she wasn’t a real person – she deserves just as much respect and love as we would give to any other human. I understand how people can forget this, as it’s almost hard to accept that someone so legendary as Marilyn was ultimately, one of us mere mortals. As she left the world over half a century ago, people seem to dismiss her as a real person and think they can repeat morbid conspiracies and disrespectful myths. Everyone has their right to freedom of speech, but that doesn’t mean a beautiful person should be lost over hearsay and flat out lies. 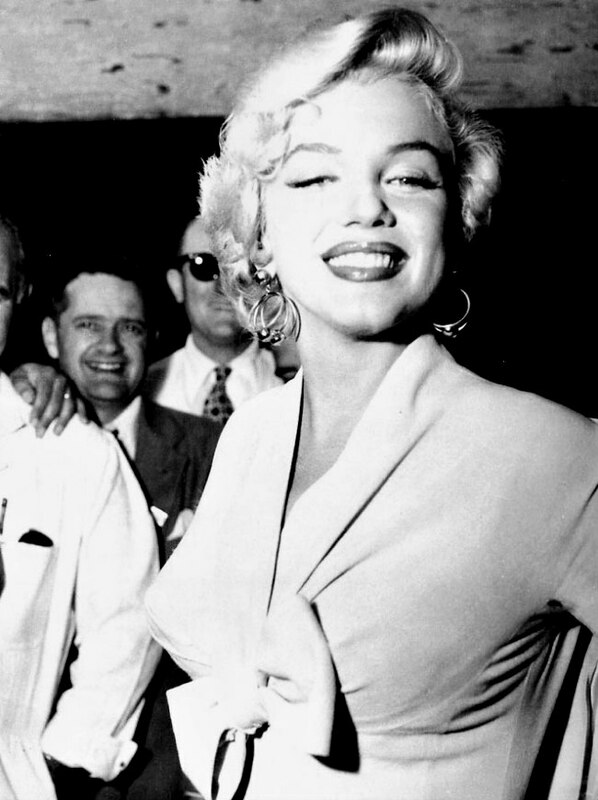 Marilyn arrives in New York to film The Seven Year Itch in September 1954. I always think to myself how lucky I am to have taken the time to learn about Marilyn and appreciate her for the amazing person she truly was. Sadly, so many people will miss out on this because they believe everything that’s posted on the internet and automatic judgement steers them away from any authentic research. If there’s anything I can do for Marilyn after all she’s done for me, is to spread the truth and facts about this wonderful lady who blessed us with her presence. 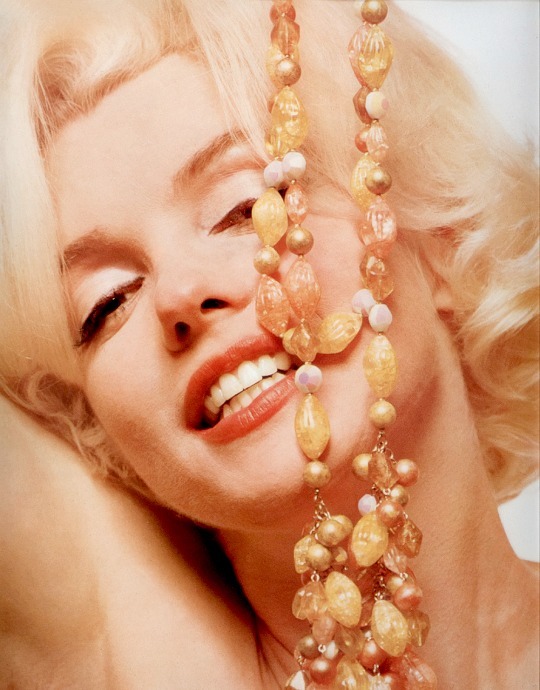 Marilyn by Bert Stern in June 1962. Marilyn was a woman always ahead of her time, she believed in equality, feminism, speaking out and most importantly, kindness and generosity, none of these should be forgotten. She used her platform to share her story and was continuously giving with both her time and money, never forgetting her fans throughout her ever growing stardom. 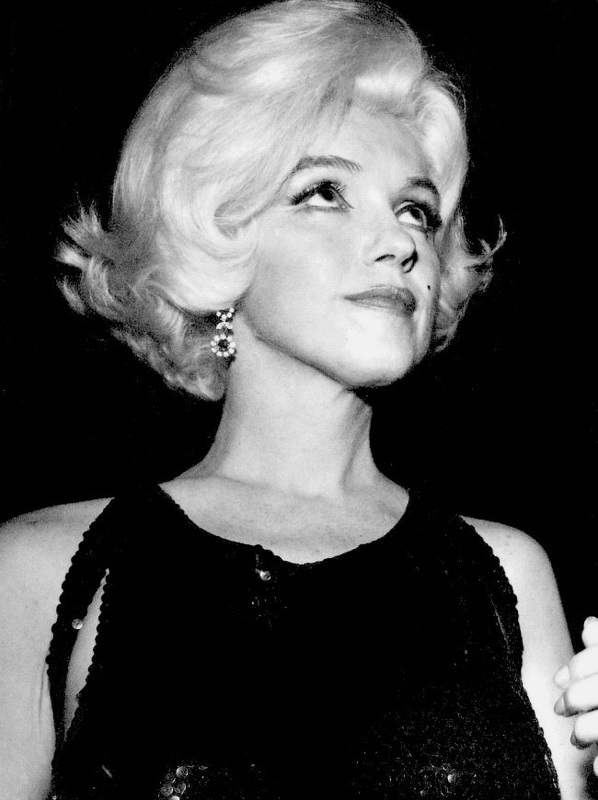 Marilyn attends The Golden Globe Awards in March 1962. On this day I will of course always feel sadness, that is simply impossible to ignore considering how much I adore Marilyn. However, I will focus on Marilyn herself and her incredible life, in all the years before and through all the years after, there will truly never be another one like her. So wherever you are beautiful Marilyn, I will always think of your wonderful words which remind me that no matter how hard life can be, there is always hope. 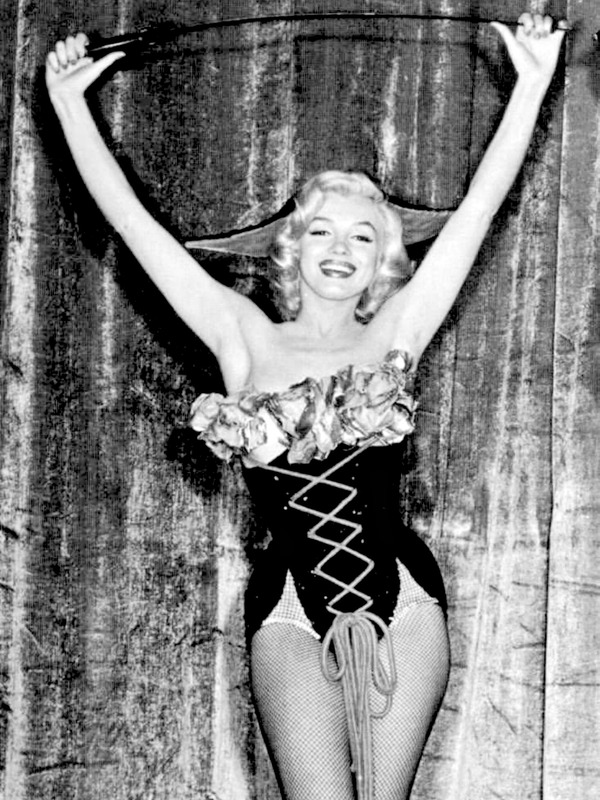 – Spoken by Marilyn to the cast and crew of The Misfits after filming had finished in November 1960. 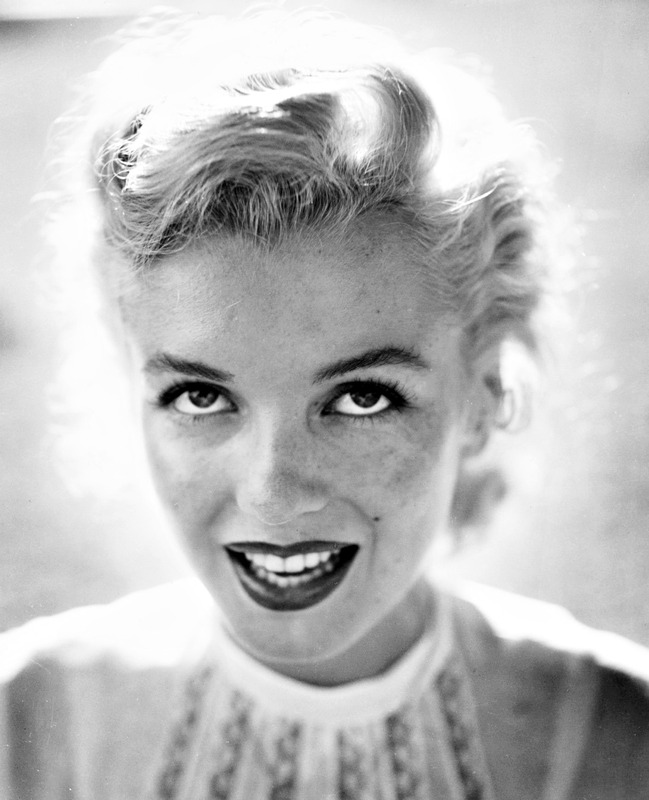 If Marilyn was alive today, it’s incredible to believe that she would be turning ninety two years old. In the seven and a half years I’ve known and loved her for, I still find it incomprehensible, due to Marilyn leaving the world at such a young age. I guess I almost have to remind myself that even the most famous woman in the world was just like us, she was human too. However, I’ll openly admit that I don’t know if that fact will ever sink in, not because I view Marilyn as an Icon, although she undoubtedly is, but because it’s amazing to think that she walked the earth we all live on. Marilyn by Andre de Dienes in July 1949. Although it’s been over fifty five years since Marilyn left us, in many ways it feels like she’s still here, almost like she never really left. What I mean by that is her spirit and presence is so prevalent in today, I bet there’s not one person in the world that doesn’t know her name or face. 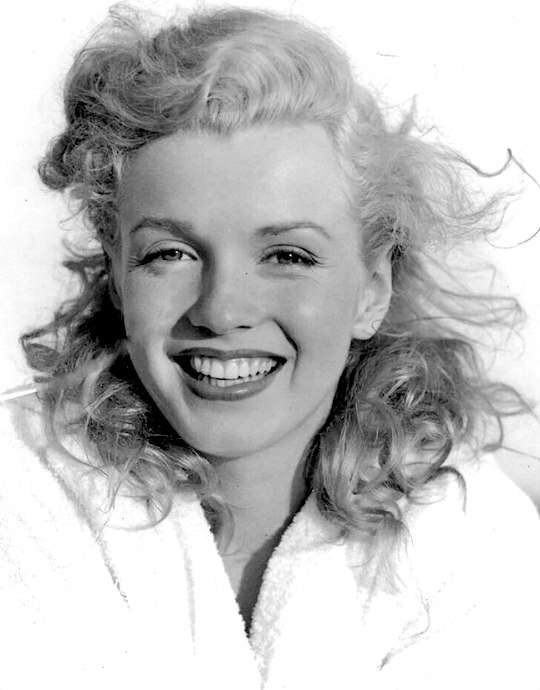 Of course, with such fame and status comes the dreaded myths and conspiracies, which myself and many strive to dispel, but, I do like to think that the majority of people smile and feel happiness when they see or watch Marilyn. She has such a unique warmth and kindness that truly lights up the screen when she appears and I’m sure it’s true that she lit up a room when she entered one over half a century ago. 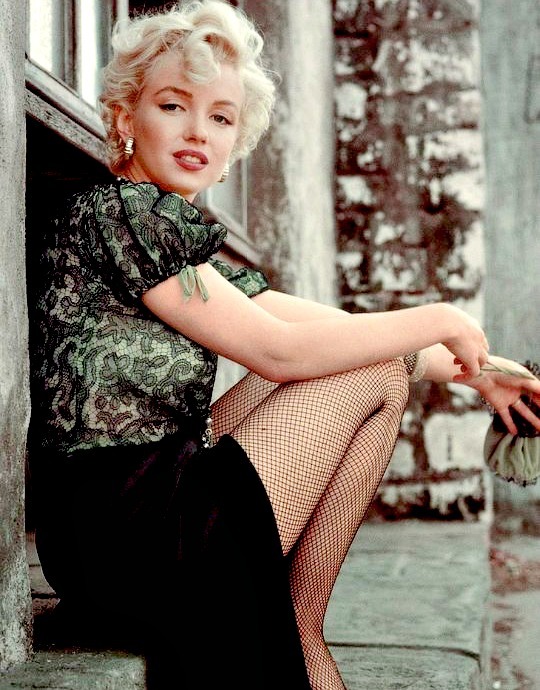 Marilyn by Milton Greene in October 1953. Every year Marilyn’s Birthday and Anniversary come around, I always wonder to myself what I should write and how do I go about not being repetitive. After all, there’s only so much that can be said on one particular person, however, to me it’s all about spreading love and enlightening others on the real Marilyn and if I can do that through writing a few words, I’ll definitely try. I’ve mentioned many times how inspiring I find Marilyn, how unbelievable her story is and how she achieved so much considering the odds against her were beyond enormous. I’ve also said how Marilyn was so much more than a beautiful Blonde Bombshell, she was a special soul who was always striving to perfect her talents and be the best person she could be. However, even as I reiterate previous statements, I can’t help but thinking about how true they are and how incredible Marilyn really was. 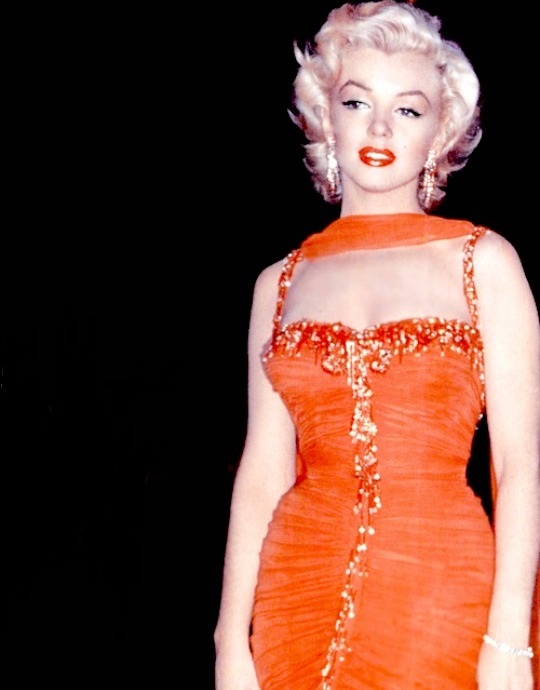 Marilyn attends the Premiere of Call Me Madam in March 1953. Of course I absolutely adore Marilyn and there’s no doubt that I truly cannot say many, if any bad things about her, some would say I’m extremely biased and I would to an extent admit to that. However, I pride myself in being honest and speaking the truth and everything I state about Marilyn’s life and achievements are historically proven. Therefore, this is the main reason why I’m so dumbfounded when people don’t like or respect Marilyn, I mean, how can you possibly not? Not everyone has to become a huge devoted fan like myself, but to be so judgmental, inaccurate and assuming is such a huge annoyance to me – we should all be supportive and admire anyone’s achievements and why should Marilyn be any different? Just because a person has their struggles doesn’t make them someone not to admire, to me it makes them even more inspirational in that they achieved so much when they were suffering. 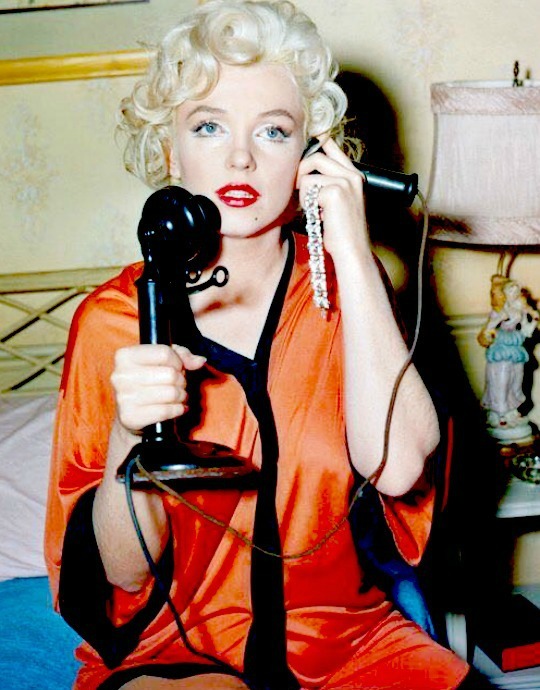 Marilyn by Milton Greene in March 1955. Ultimately, today is a very special day for myself, all of Marilyn’s fans and Hollywood, for without Marilyn the world would definitely have been a little duller. Not only did she accomplish so much and forever make her mark in Cinema, she was a kind person and just wanted to put a smile on people’s faces. I always love reading little anecdotes showing Marilyn as a person and not the star as they show her beautiful soul and caring nature. Things like her anonymously gifting money to crew members in need or bringing a cow inside because it was raining, just show how generous she was and how little material things actually meant to her. 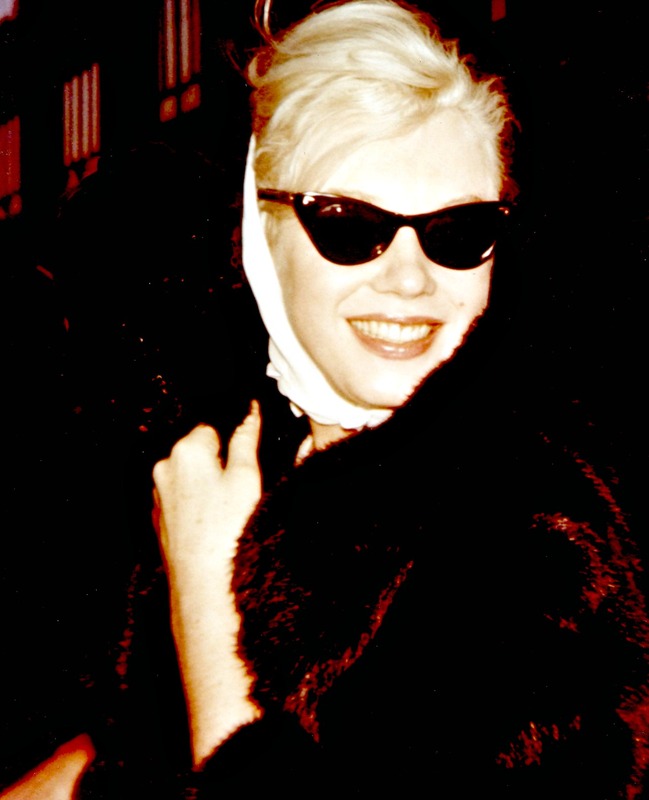 Marilyn during the filming of Let’s Make Love in 1960. 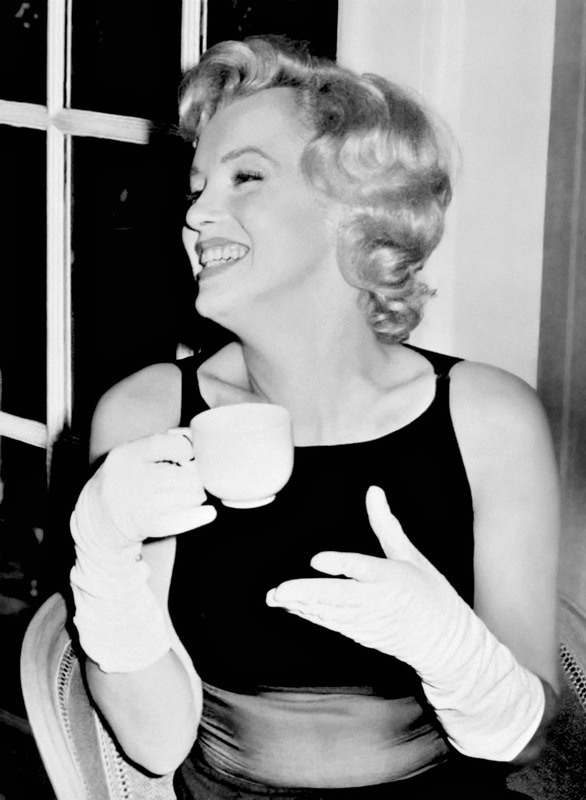 Wherever Marilyn may be I hope she knows how appreciated, loved and respected she is by so many. There may be a few ignorant and judgmental people still out there but she had that during her lifetime and I like to think it wouldn’t phase her all too much. Marilyn always knew that people didn’t expect much from her other than a pretty face and she never failed to prove them wrong. 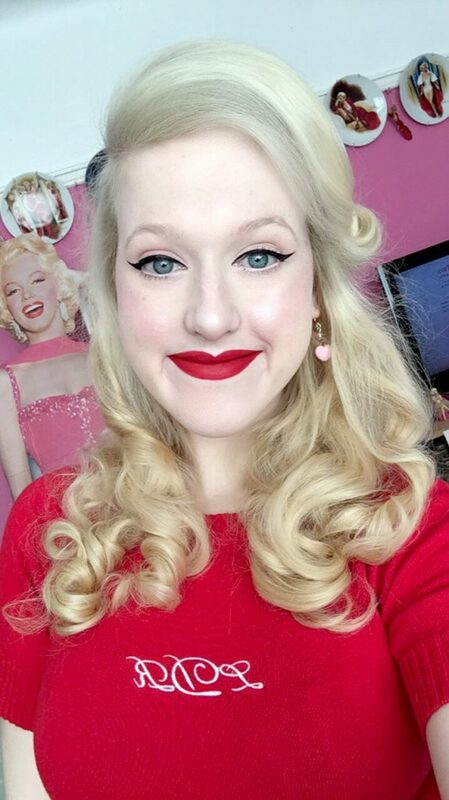 At 24 years old I think about Marilyn every day and have done since I first discovered her in late 2010, she fills my heart with love and joy and I will never not stick up for her. I like to think that however old we all get, Marilyn will continue to always be with us in spirit and never fail to place a smile on a sad face. It takes an incredibly special person to have the ability to make someone feel such love and emotion for someone they have never met and Marilyn is one of those rare people. I love you with all of my heart beautiful Marilyn and I undoubtedly always will. “I don’t understand why people aren’t a little more generous with each other. I don’t like to say this, but I’m afraid there is a lot of envy in this business. 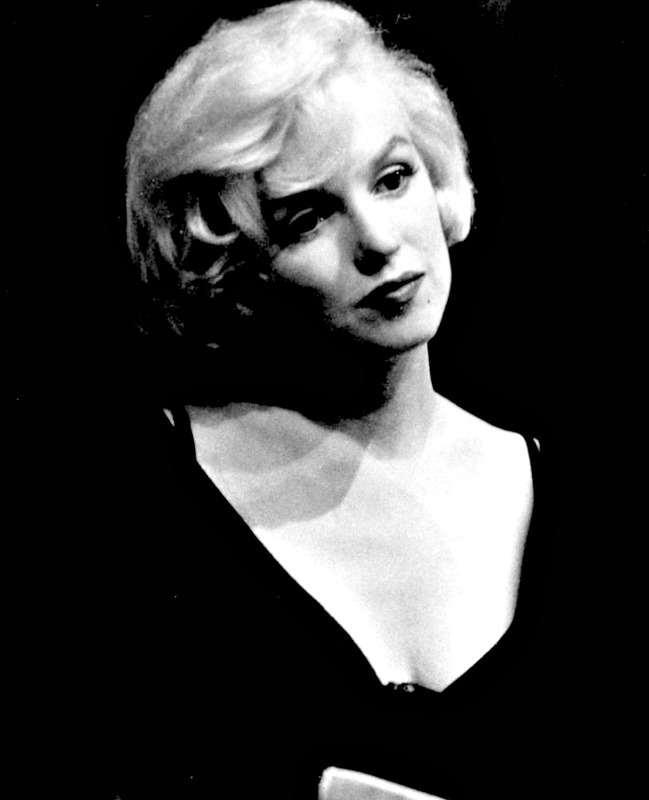 The only thing I can do is stop and think, “I’m all right but I’m not so sure about them!” – Marilyn to Richard Meryman in Life Magazine, August 1962. Although Marilyn is so prominent and recognized in the present day, It’s hard to comprehend that in reality, she tragically passed away fifty five years ago on the evening of August 4th, 1962. At just thirty six years old, her death was announced on the morning of August 5th and shocked the world and the millions of fans who mourned the loss of this very special woman. As someone who wasn’t even born until thirty plus years after Marilyn left the Earth, new readers may wonder why I’m writing about a celebrity I never actually knew. However, I’m assuming if you know anything about me, you’ll know that Marilyn is one of my absolute favourite people, I adore her with all of my heart and have done for coming up to seven years. Personally, I feel that you can still have a special connection and feeling towards someone you’ve never had the privilege to meet, whether this is due to them being a worldwide celebrity or being born quite a few decades after they’ve passed – or both! As I’ve said many times before, Marilyn entered my life in October 2010, pushing seven year ago and she’s never left, I think about her every day and she has changed my life for the better astronomically. I found inspiration and comfort from her during my darkest days and she honestly has never failed to not brighten my days. However, this post is not about me – this post is about celebrating the life of Marilyn and how fifty five years on, she’s still loved and adored by just as many, if not more fans who love and admire the amazing woman she was and the achievements she made. Sadly, as the night of Marilyn’s passing is a huge interest for conspiracy lovers, both her life and death are often filled with hundreds of rumours, theories and downright defaming myths. When a celebrity passes away young and unexpectedly, millions of people look for answers to the big question, why? Of course, this is completely natural and makes perfect sense, but ultimately, the only person who can confirm or deny how they died is no longer around to tell us. In reality, we have lost many celebrities to the tragedy of overdoses – Marilyn’s death was ruled as a, “probable suicide”, although I believe it was accidental. However, many people cannot comprehend or believe this and go down the root of following conspiracies, ultimately forgetting about the person and obsessing over theories that have no substance. Over the years, many people who have created life stories and careers on their “relationship” with Marilyn and how she supposedly died, earning thousands in the process and damaging Marilyn’s name. In reality, the real reason for Marilyn’s death was pretty simple – medical negligence and incredibly, her doctors were never accounted for this. Ultimately, I think it’s safe to say that Marilyn wouldn’t want her untimely death to be the main focus point of her life, she wouldn’t want us to be sad and spend countless hours trying to work out why she left. I like to think Marilyn would want us to celebrate her amazing achievements and ground breaking moments in such a short space of time. I know she would be overwhelmed that over fifty years after she passed, millions of people of all ages, still love and care for her all these years later. Hundreds and thousands of people are discovering this beautiful human every day and Marilyn continues to bring so much light and joy to people like myself, who were never fortunate enough to be able to meet her. Tonight, instead of focusing on the sad times, I will be thinking about my angel Marilyn for all the right reasons. I’ll be remembering her for the wonderful talent she possessed, the determination she had to succeed, her love of learning, plus, the kindness and generosity she showed to so many others. Thankfully, her legacy she has left behind is forever imprinted through thousands of images and thirty films she made during her short but incredibly special life. Whenever I feel upset and hurt with how unfair life was at times to Marilyn, there is one particular quote which comes to mind. Many people seem to think of Marilyn as a tragic victim and in doing this, they are unjustly underestimating her incredible strength. Through research and reading about Marilyn for quite a few years, I’ve noticed that although she suffered tremendously, she never lost hope and always tried to remain somewhat positive, even in her darkest times. Through 1960, Marilyn made her last completed film, The Misfits (1961) and during this time she suffered incredible pain through a nervous breakdown and split from her husband, Arthur Miller. The movie was made in Nevada during 40 degree heat and was incredibly strenuous for practically everyone involved. 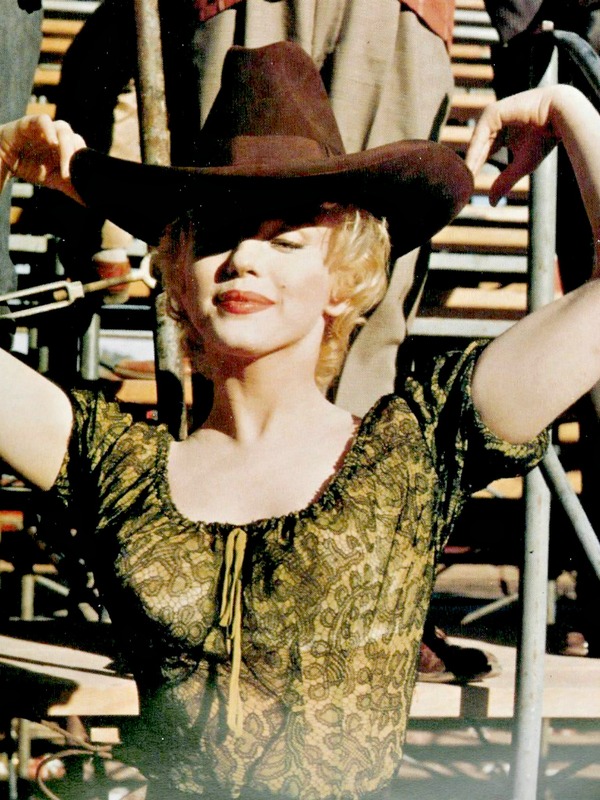 Although The Misfits (1961) is now hailed as one of Marilyn’s best acting performances, she came to hate the film and resent Arthur for her character, Roslyn – the film which was originally a Valentine’s present to her. Yet, despite going through arguably the toughest period in her life, she had this to say at the end of the filming. I for one, will be following this advice, from one of the strongest women who ever lived. Wherever you may be, beautiful Marilyn, I hope you know how loved and appreciated you are by so many people around the world. I know I say this quite often, but I like to believe that somehow, you see how much you have enriched millions of fans lives and gave them hope and strength. 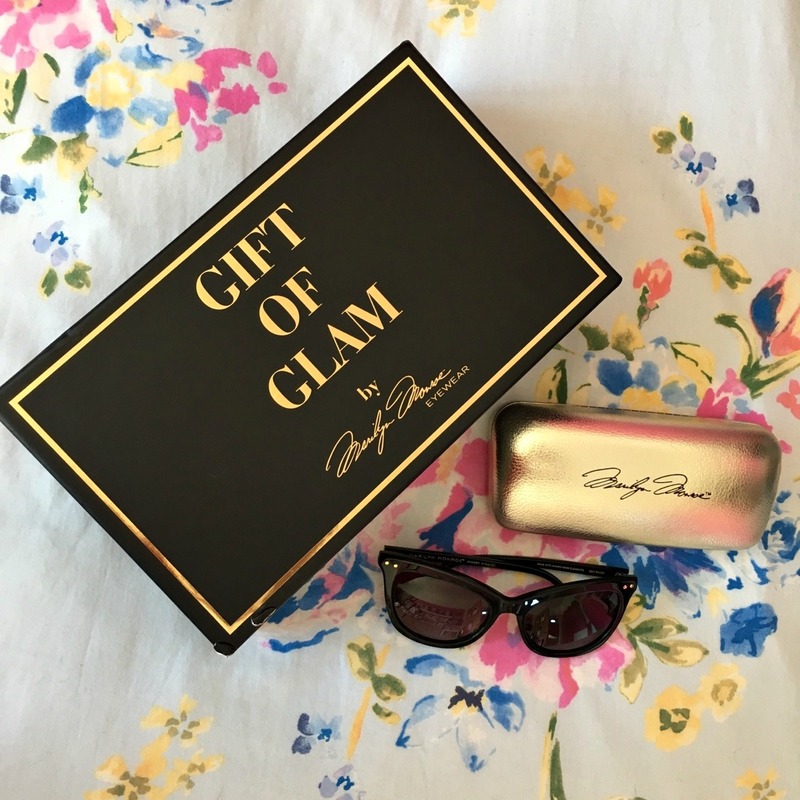 Gift of Glam by Marilyn Monroe Eyewear. If you’ve followed me on Social Media for the past 6+ years, then I’m 99% sure you know how much I love the beautiful soul, Marilyn Monroe. Ironically, it feels almost strange for me to type out her full name, as I like to think of Marilyn as almost an Guardian Angel to me, definitely not a stranger. Some will understand that and relate, others may judge – but Marilyn will always have a special place in my heart. 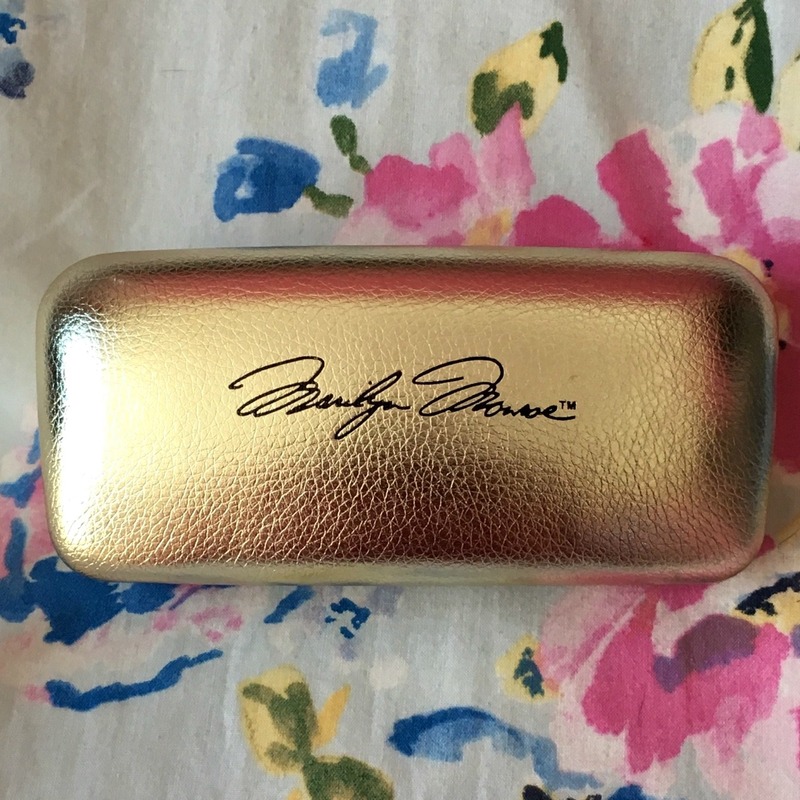 A few weeks ago, to celebrate Marilyn’s 91st Birthday, I wrote, as I do every year, a Tribute for my favourite lady and was pleasantly surprised when I noticed, Marilyn Monroe Eyewear like my post and follow me on Instagram. 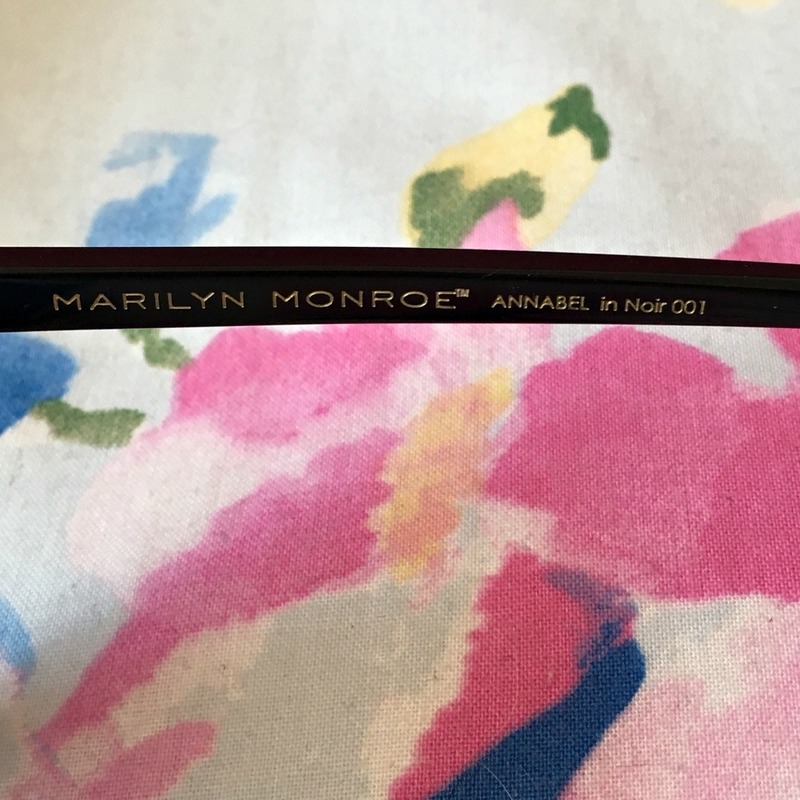 Marilyn Eyewear is Officially Licensed by The Estate of Marilyn Monroe and is one of the many Brands they have created which is all inspired and influenced by this very special woman. As my beautiful friend, Laura has previously worked with Marilyn Eyewear, I decided it would be worth a try contacting the Brand and thanking them for following my Instagram Account. I also proposed the possibility of a collaboration. Once again, I was surprised and very thankful to receive a reply agreeing to my suggestion about a collaboration! After just four days, my parcel from Marilyn Eyewear arrived, all the way from America! I can’t emphasize how appreciative I am of such a quick delivery, especially from so far away – I was already beyond impressed. However, little did I know that I was going to be completely blown away when I opened the parcel. 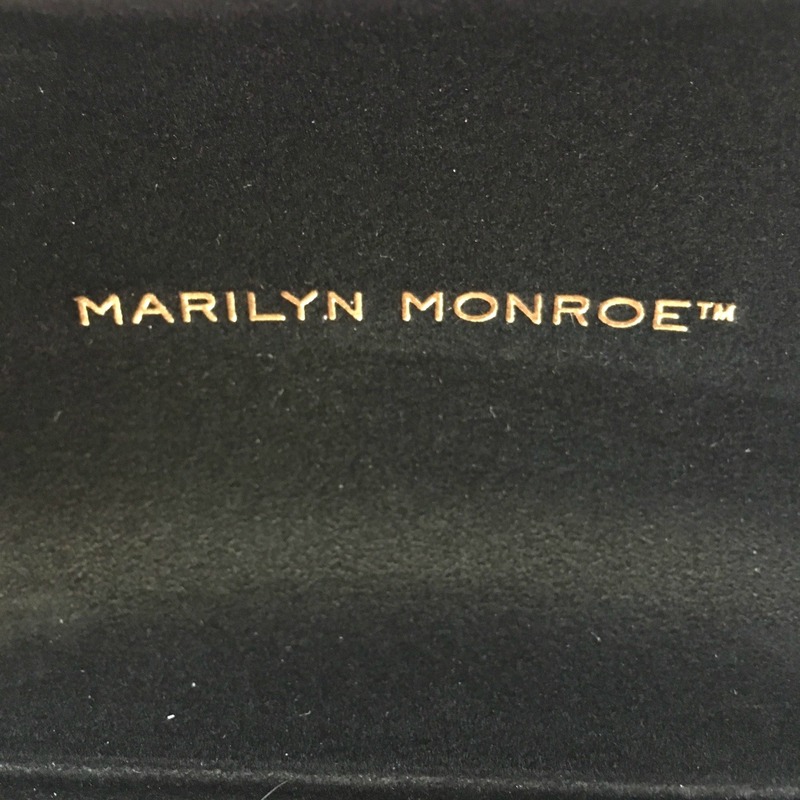 Not only was I gifted a pair of beautiful Sunglasses, there were also three beauty products from Marilyn Monroe Spas! 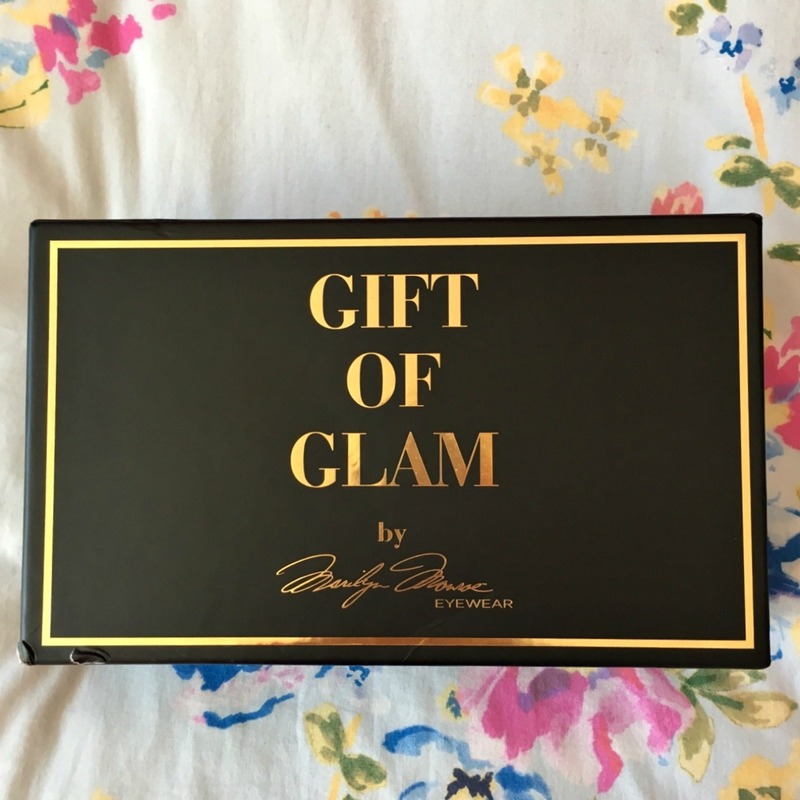 It wasn’t until I looked on their website, that I realized I had been sent the, Limited Edition Gift of Glam! Thank you so much Marilyn Monroe Eyewear and Marilyn Monroe Spas! 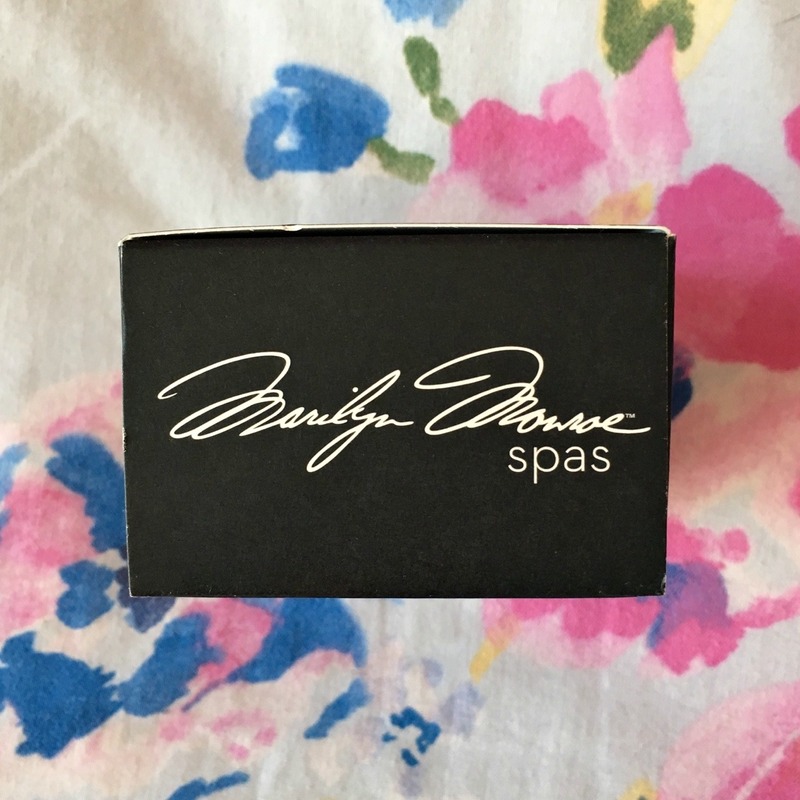 The packaging is a classic chic black matte box, finished with gorgeous gold writing and Marilyn’s iconic signature – what could be better!? 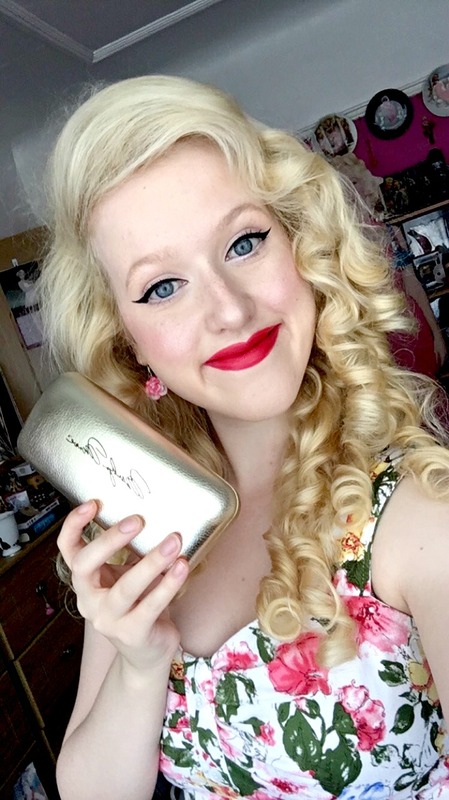 As soon as you open it, you’re greeted by dazzling red tissue paper and inside are the iconic products all inspired by my favourite girl – Marilyn! Nail Polish in Marilyn Red, a red Beauty Blender, a Lipstick in Marilyn Red 03 and if that wasn’t enough, a pair of Marilyn Eyewear Sunglasses in Annabel Noir 001! 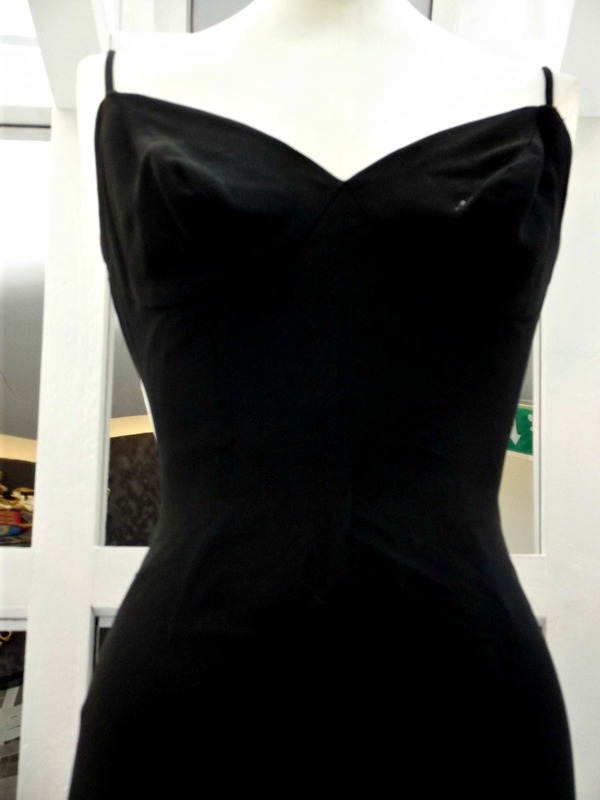 If you’re a Marilyn lover or simply adore the Vintage look, then this is without doubt a must have – it’s simply timeless! 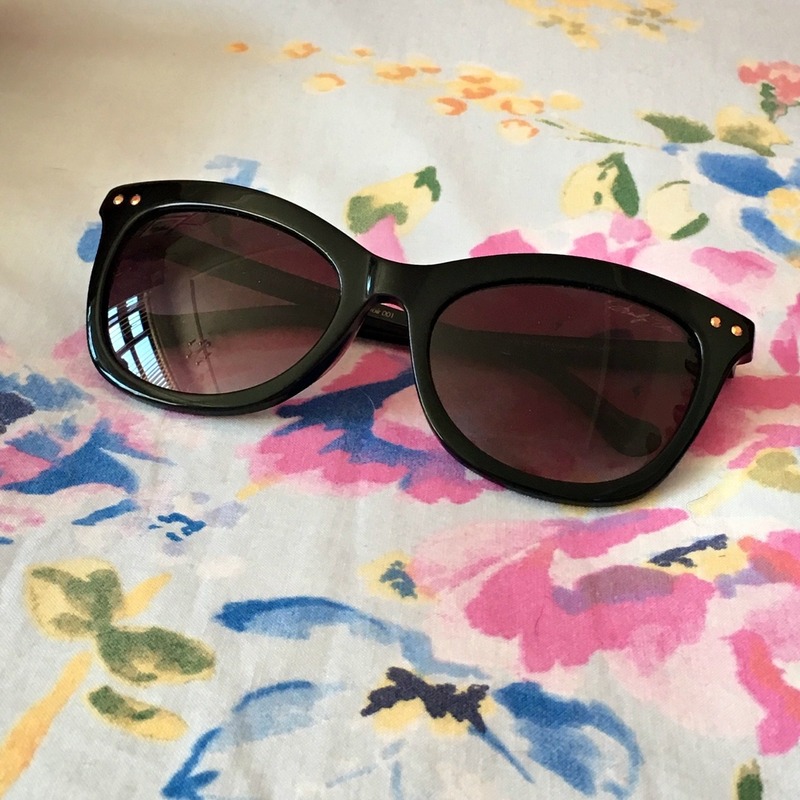 If you’re after an everyday, classic retro look than Annabel are the must have Sunglasses for you, but fear not, there are three other shades available if you’re after something different. 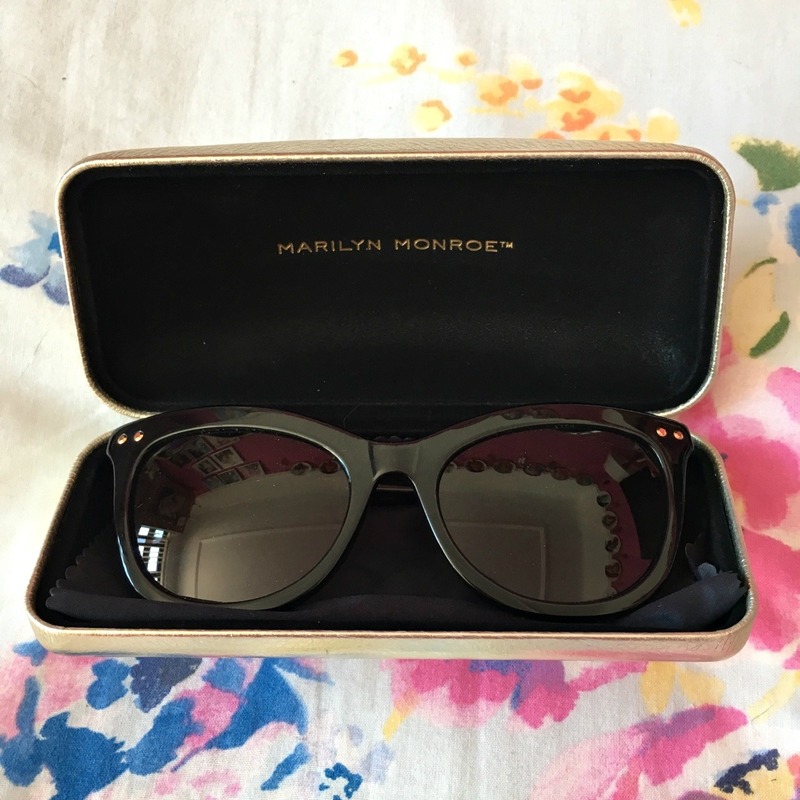 Out of all the amazing vintage style Sunglasses on Marilyn Eyewear, if I had to choose my favourites it would be either, The Marilyn, Elsie, Iris or Rose and yes, that is my attempt at trying to narrow my choices down! All come in different colours and styles, so there are more choices to choose from and they feature Marilyn’s iconic signature – so much beauty! 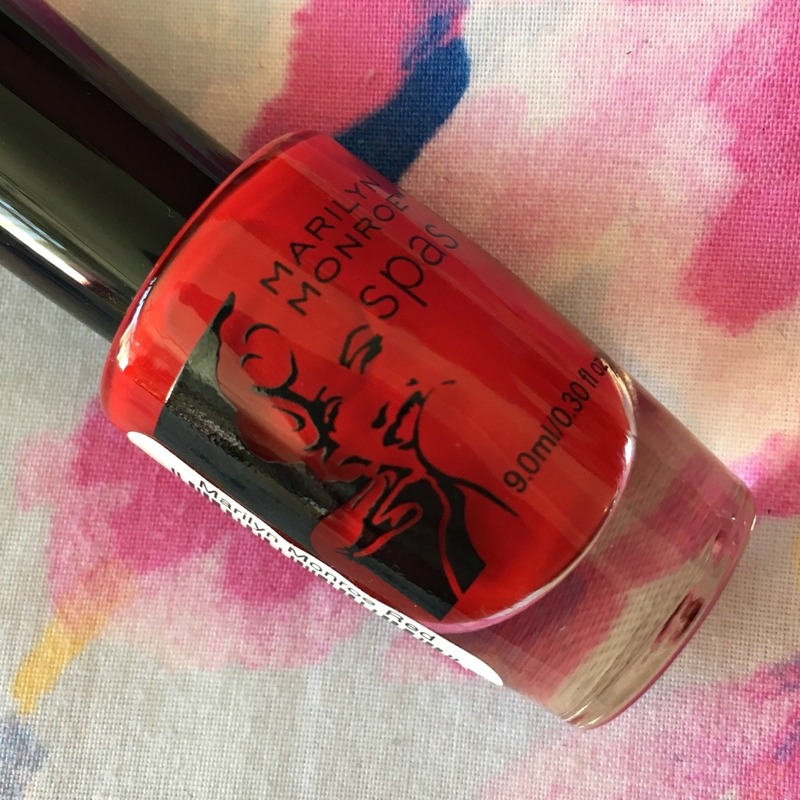 The Marilyn Monroe Spas Beauty Products all have one thing in common, they are all – you guessed it, red! 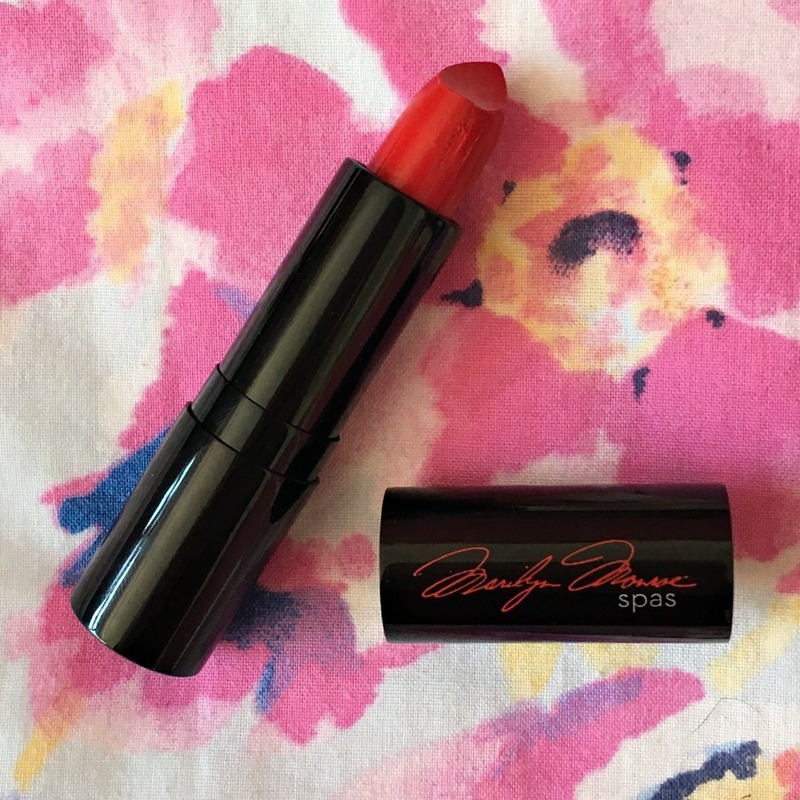 Anyone who knows anything about Marilyn will associate this bold colour with her, as it was without doubt her signature lipstick shade to wear. 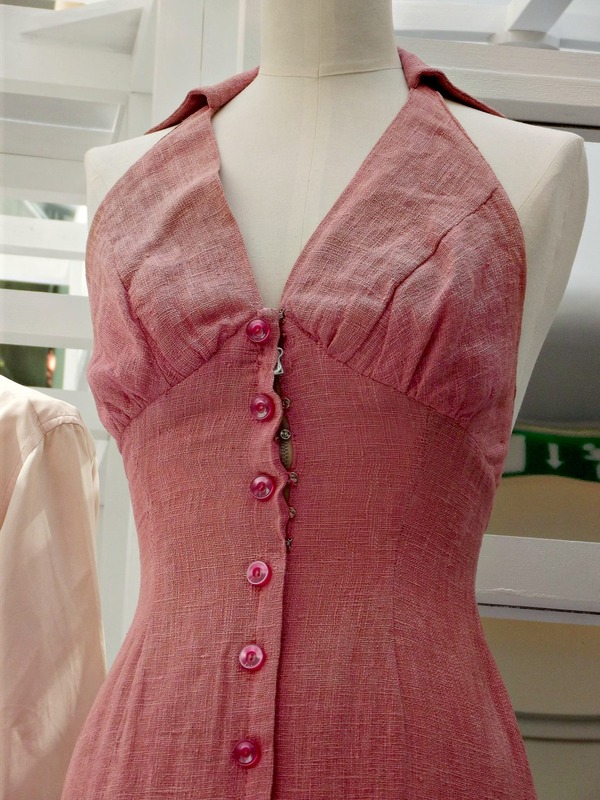 As someone who adores the Vintage Look, this was such a wonderful surprise and even better that each item is based on the signature Marilyn look. 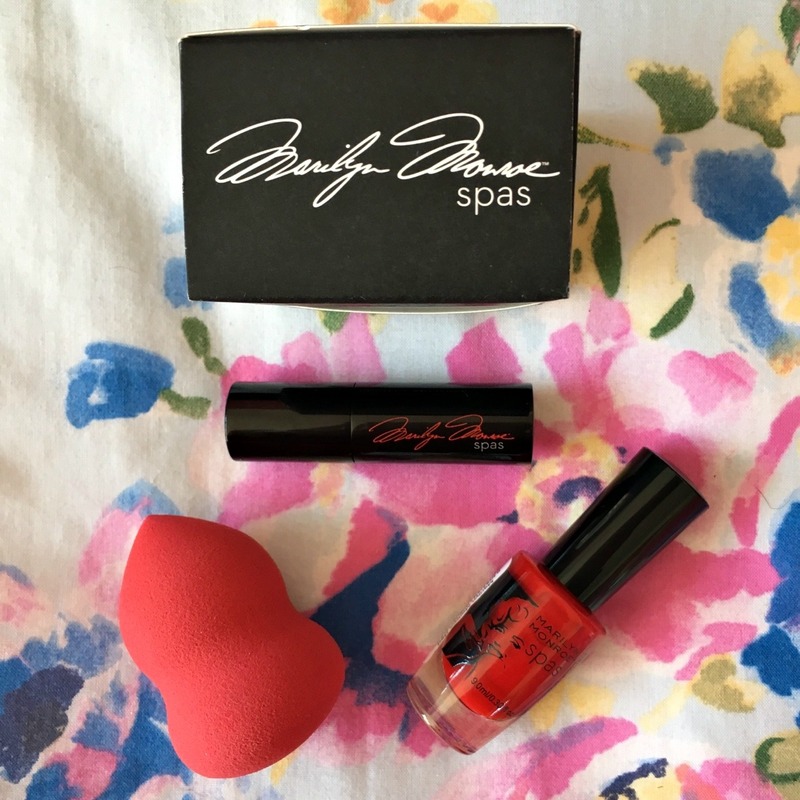 The Beauty Blender is a must have in my every day makeup bag and ironically enough, I was just thinking a few days ago that I needed a new one! 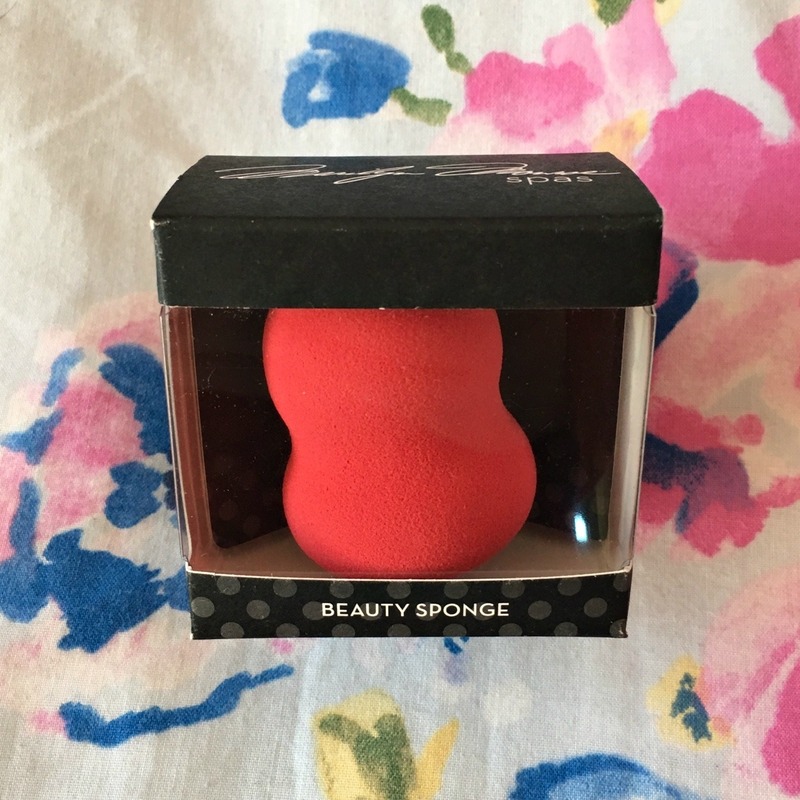 Plus, I’ve not seen many sponges that are this unique shade, so it will definitely stand out in my collection. Furthermore, the packaging has Marilyn’s beautiful signature on, so yes, I will be keeping the box! 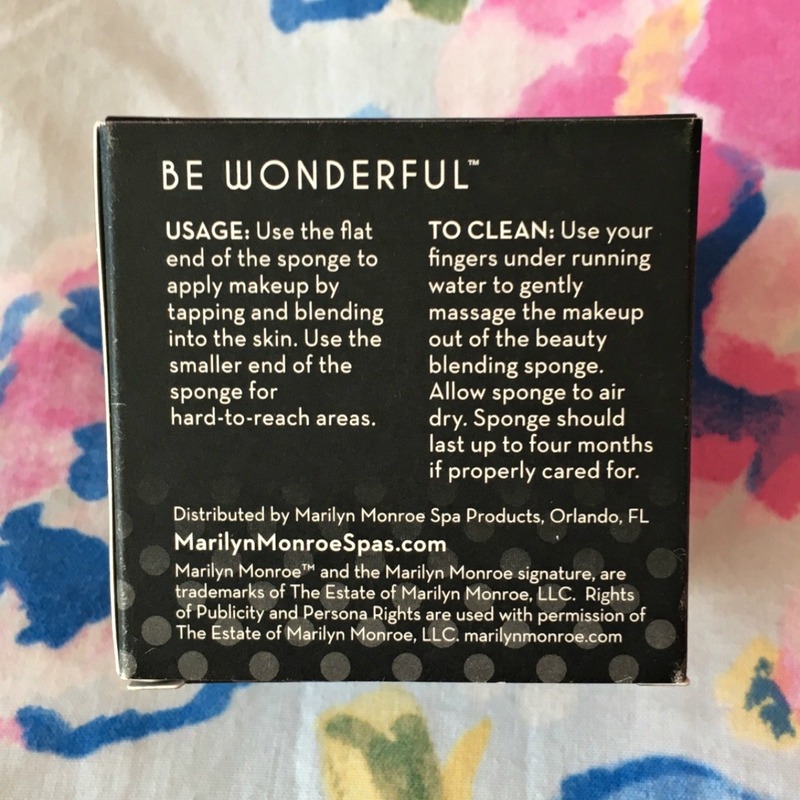 I also love how on the back of the packaging it says, “Be Wonderful” which I’m assuming is inspired by one of my favourite, genuine Marilyn quotes. 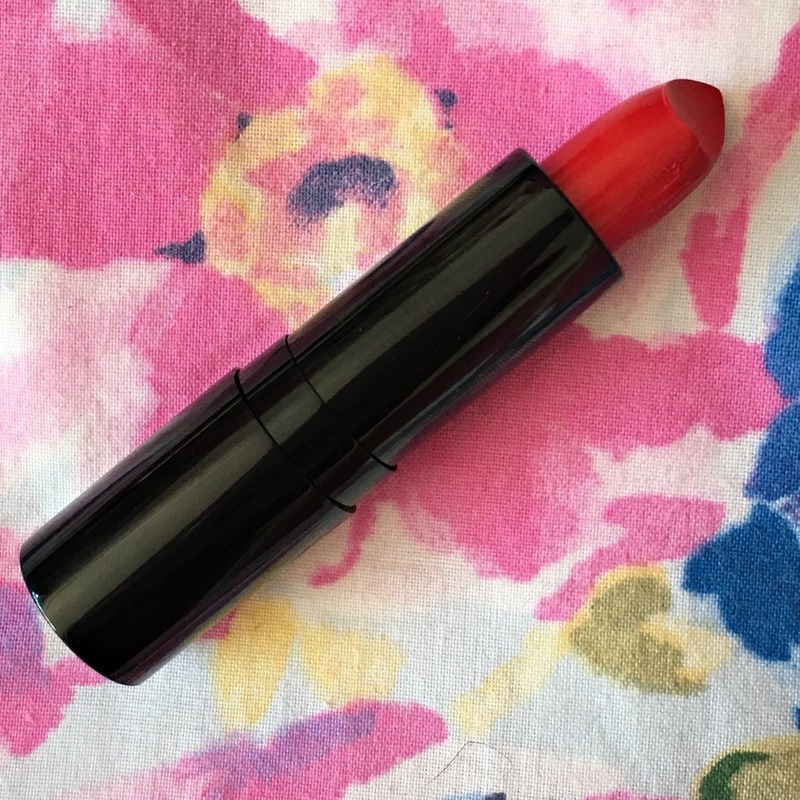 Also within the Glam Kit is the stunning, True Red 03 Lipstick. 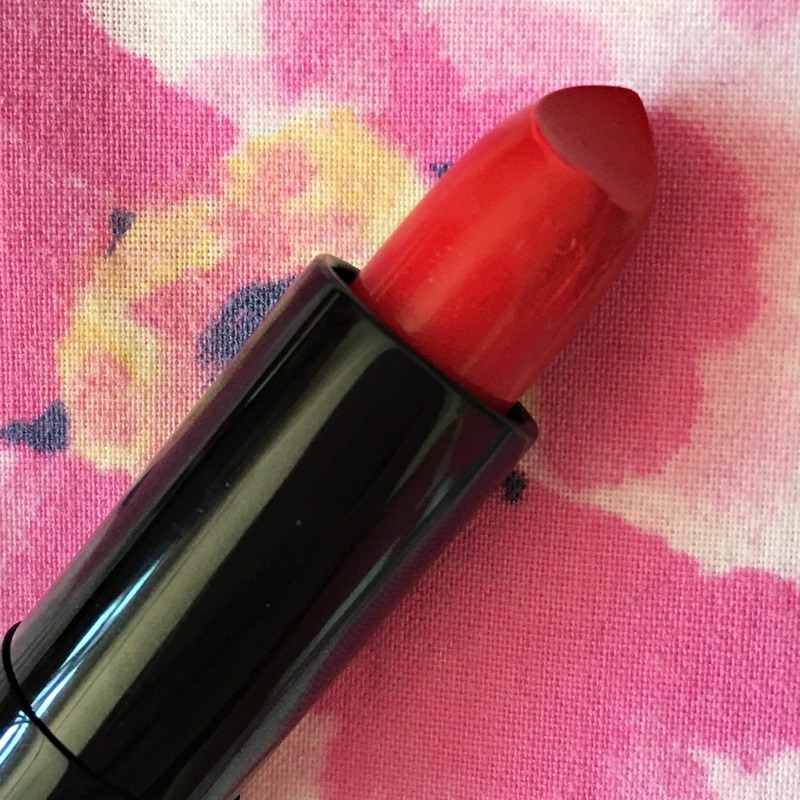 Red is the ultimate retro colour and my absolute favourite to wear pretty much every single day and I can confirm, True Red 03 definitely has my approval. 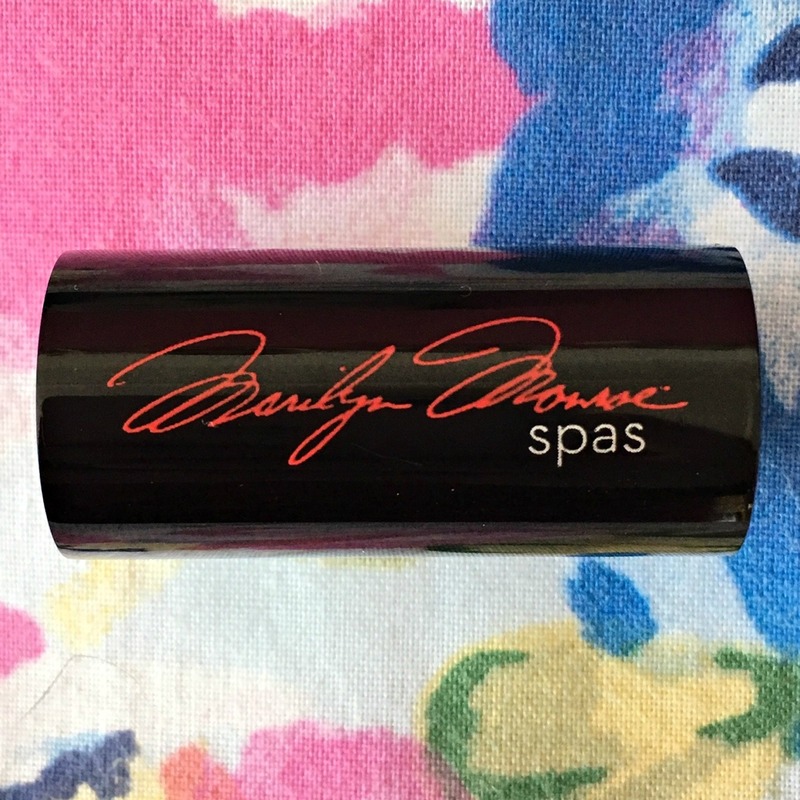 The product features Marilyn’s signature in a stunning red and a gorgeous kiss print, which contrasts dramatically with the bold black packaging. 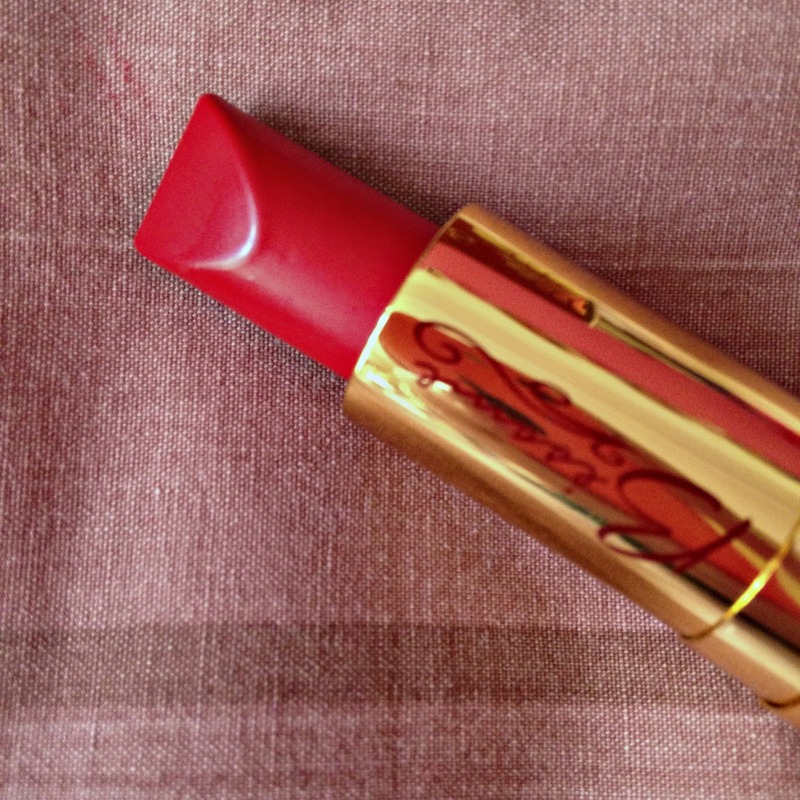 I also love the shape of the lipstick as it’s perfect for creating that beautiful full pout. 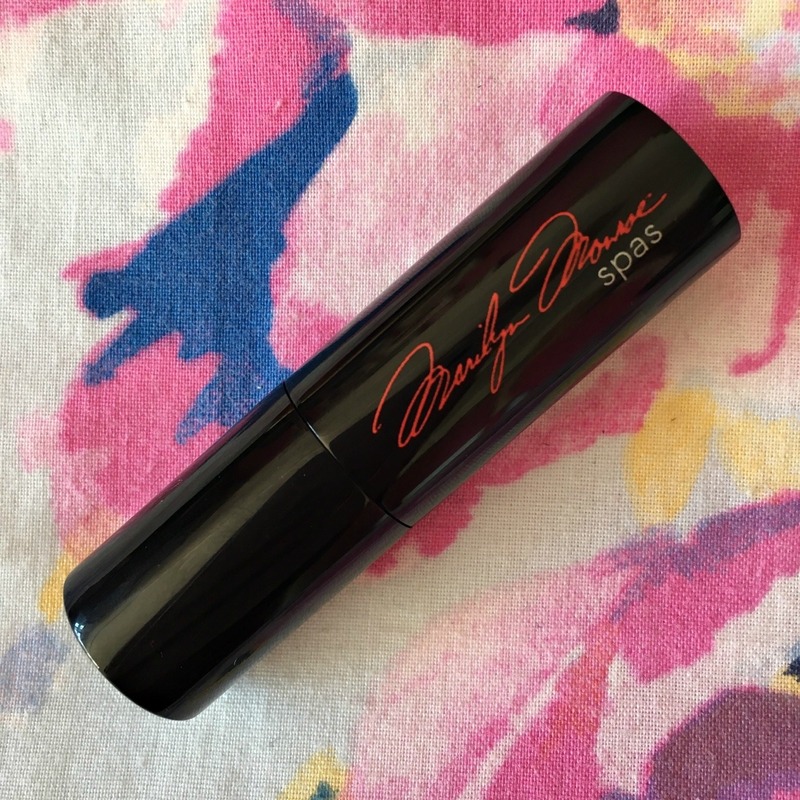 There are so many amazing beauty buys available on Marilyn Monroe Spas, I could honestly spend hours browsing through all the variety of shades! 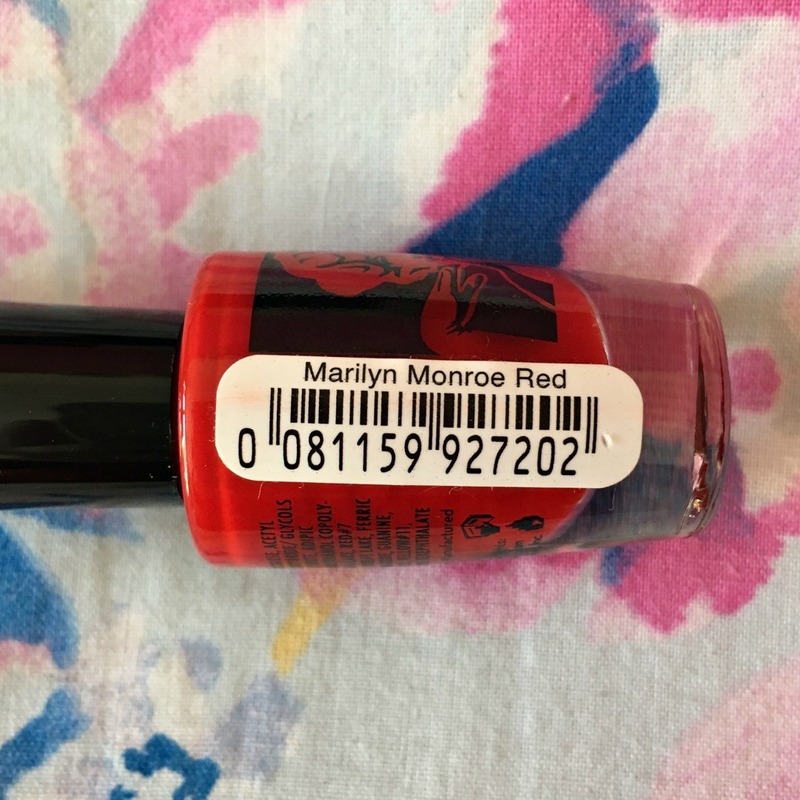 The final product in the Marilyn Eyewear Gift of Glam is the Marilyn Monroe Red Nail Polish, which features a gorgeous portrait of Marilyn herself – so unique! 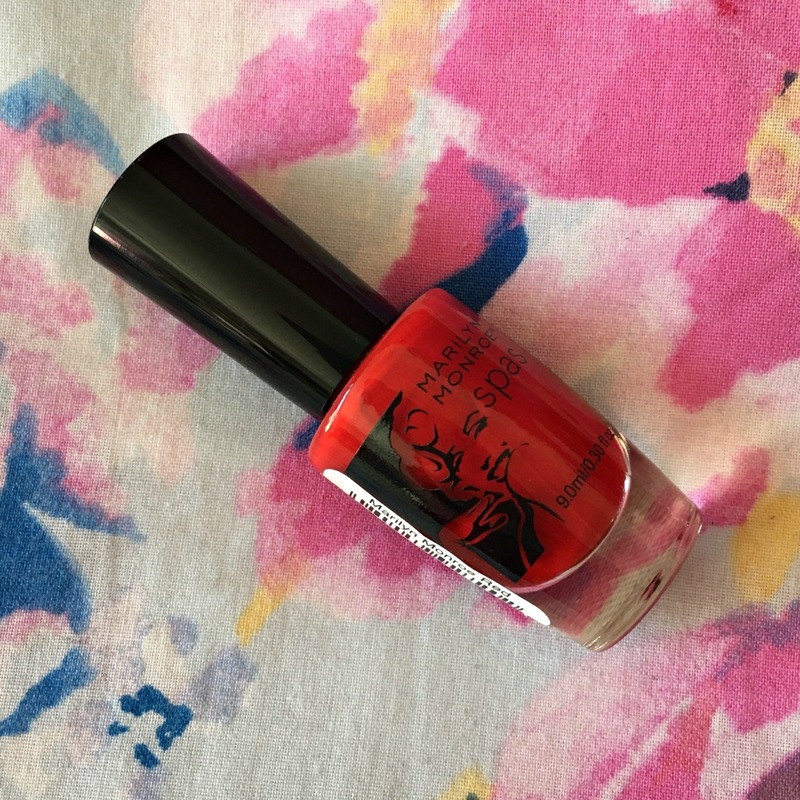 The shade is eye catching and will definitely make your nails be the centre of attention! Plus, even if you’re not a red lover like myself, it’s worth having just for the stunning packaging with our beautiful blonde bombshell! Please note, I pride myself in making sure I write honest reviews and although I was fortunate enough to be gifted these items, I was not told to say any of the following statements I have made. 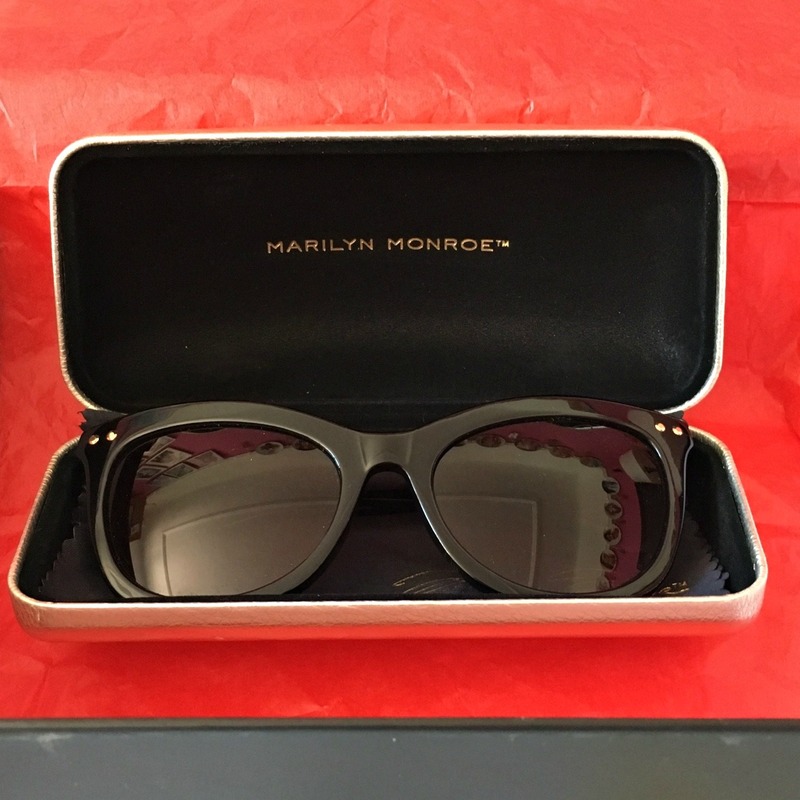 Lastly, I simply must say a huge thank you so much to Marilyn Monroe Eyewear for gifting me these beautiful products, which I will truly cherish. Today marks the Birth Date of probably my favourite human who ever blessed the Earth with their presence, the beautiful soul that was Marilyn Monroe. As she left it at such a young age, it’s almost incomprehensible to believe that she would be ninety one years old if she was still alive. Each year I like to pay tribute to my angel by writing about the incredible person she was, the unique life she lived and all of her accomplishments in such a short space of time. I feel as a devoted fan of Marilyn’s that it is my duty to help spread the truth about this beautiful soul, by aiming to let society learn about the real woman she was and to not be influenced by the unsubstantiated conspiracies and myths. 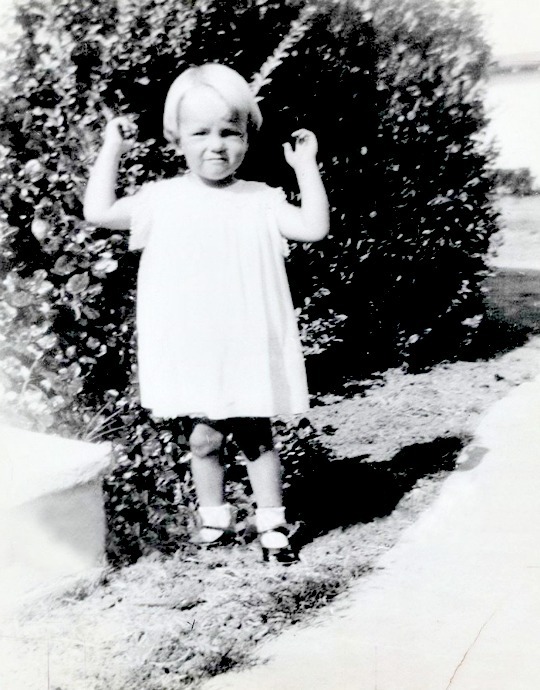 Norma Jeane Baker in 1928. 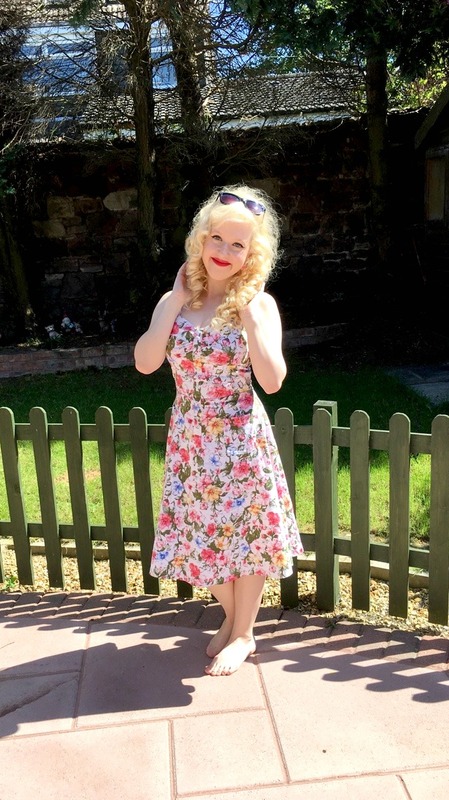 Therefore, instead of writing my usual styled posts on my favourite girl, I have decided to be slightly more creative and this time share a number of anecdotes that you may or may not know about Marilyn. In doing this, I hope that it will give you an insight into the kindhearted soul she was and hopefully you will take a moment to think about her on this very special day. When Marilyn was a little girl and occasionally spent time with her mother, Gladys, she noticed a photo of a dark haired man with a mustache displayed in her home. The man bared a similar resemblance to one of her favourite Movie Stars; Clark Gable and Norma Jeane Baker liked to think of him as her father. She had loved going to the cinema ever since she was a child and must have seen Clark on the big screen many times. In reality, this man was Marilyn’s actual father – Charles Stanley Gifford, who had been seeing Gladys before she became pregnant. 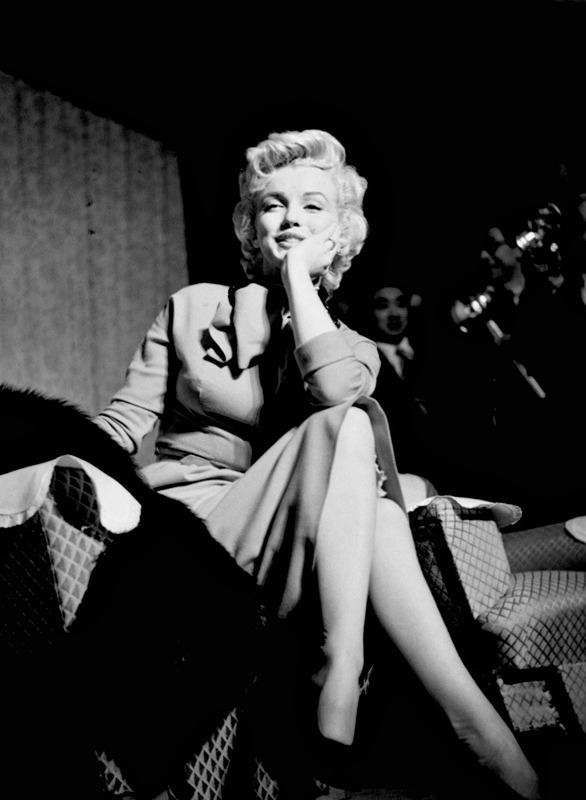 Ultimately, he never acknowledged Marilyn as his own and they never had any relationship. Norma Jeane poses with her animal friends in 1933. On a happier note, many years later in November 1954, Marilyn would finally fulfill her childhood dream of meeting Gable at Romanoff’s, where The Seven Year Itch Wrap Party was being held in her honour. They danced with one another and shared how they would both love to work together, with Gable telling Marilyn, “You have the magic.” This wish would eventually happen in 1960, with The Misfits generally being cited as one of their best performances. Norma Jeane by William Carroll in 1945. 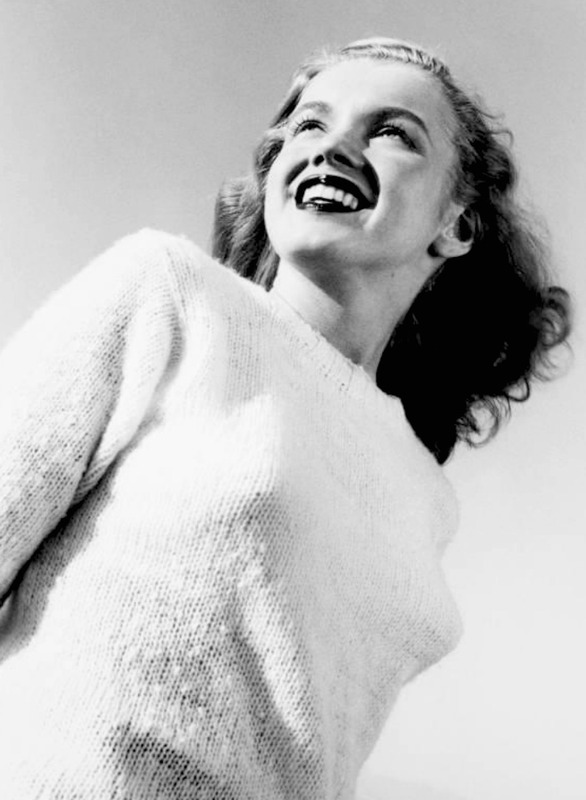 Marilyn by Andre de Dienes in 1949. 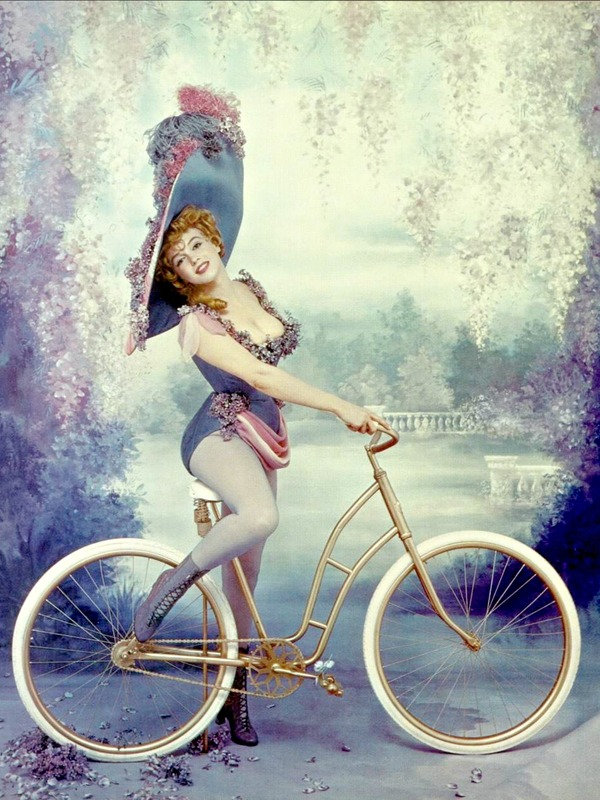 On 1st June 1952, Marilyn turned 26 years old and celebrated by finding out she had landed the coveted role of Lorelei Lee in Gentlemen Prefer Blondes, beating out the previous Top Blonde at 20th Century Fox – Betty Grable. She was to be starring opposite Jane Russell, who would be receiving $100,000 dollars compared to Marilyn’s contract salary of $500 per week – shocking, I know. 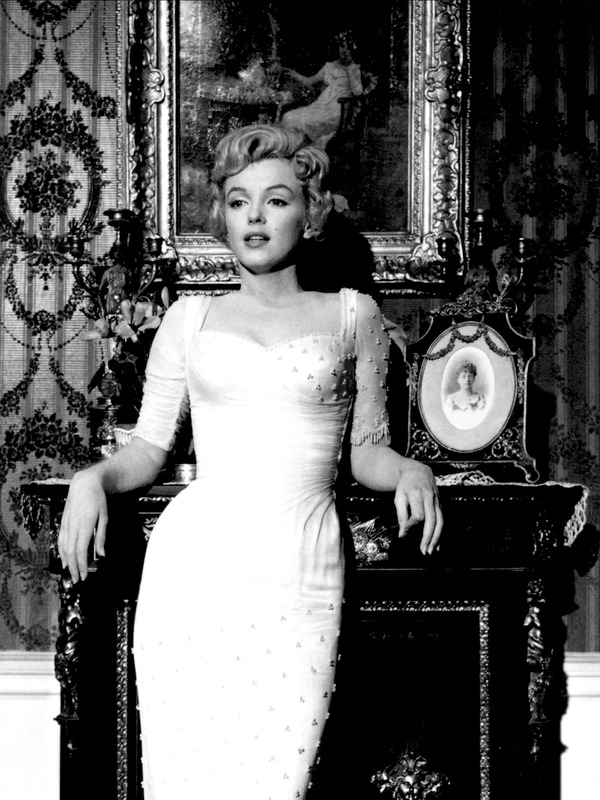 Still, Marilyn didn’t complain and put her heart and soul into making one of her most iconic movies. 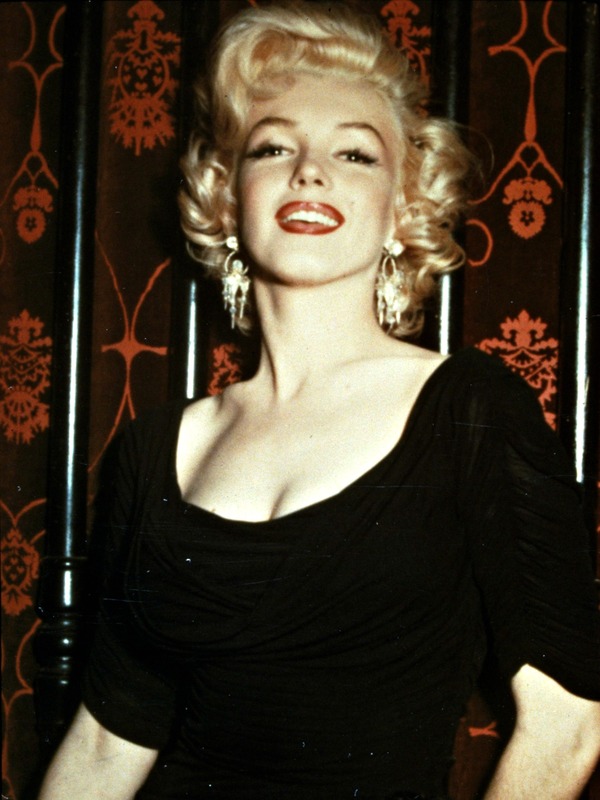 However, when Marilyn found out she didn’t even have her own dressing room, despite being the star of the film, she finally spoke out and recalled this story to Journalist Richard Meryman for LIFE Magazine, which was released two days before her death in August 1962. Marilyn by Milton Greene in 1956. Marilyn was a huge lover of animals and during her life owned quite a few pets, from dogs, to cats and even two parakeets called Butch and Bobo. During her time in New York she adopted a cat and to Marilyn’s delight, she became pregnant. She was so happy and looked after the beloved pet dearly, reading up on how to care for her during the pregnancy, repeatedly ringing her maid to check on how she was doing and spoiling her with treats. 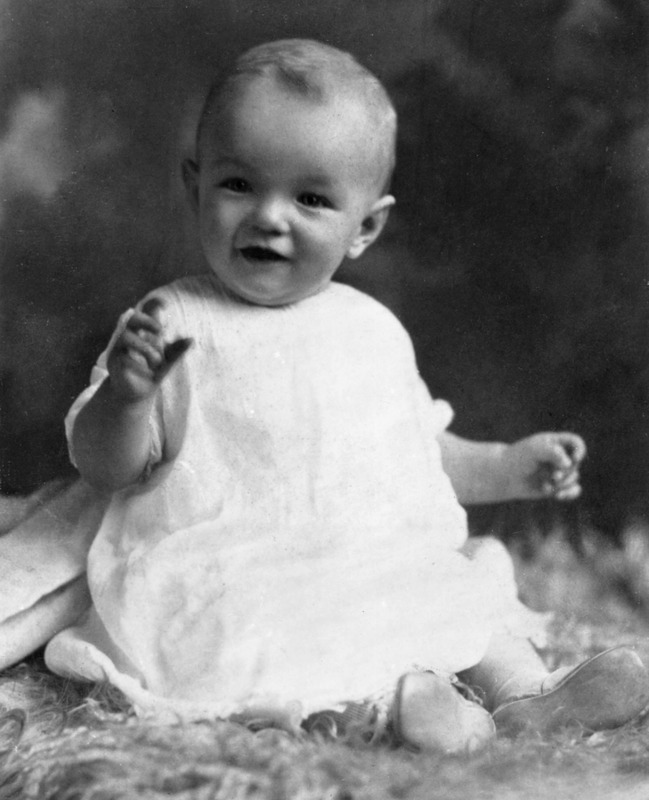 When the labour finally came during the middle of the night, Marilyn rang her good friend Norman Rosten, asking him to come over and help to which he politely declined and went back to sleep. Marilyn was known to be extremely generous, even saying in her last interview, “I don’t understand why people aren’t a little more generous with another.” and it’s most definitely fair to say she followed what she believed in. Her giving nature didn’t just involve her friends, even acquaintances received this kind treatment as retold by Author Donald Spoto. Marilyn by Ernst Haas during the filming of The Misfits in 1960. Marilyn famously said, “I only know I want to be wonderful.” and I think it’s definitely fair to say, although she may not have achieved true happiness, she the utmost worthy of being called wonderful. 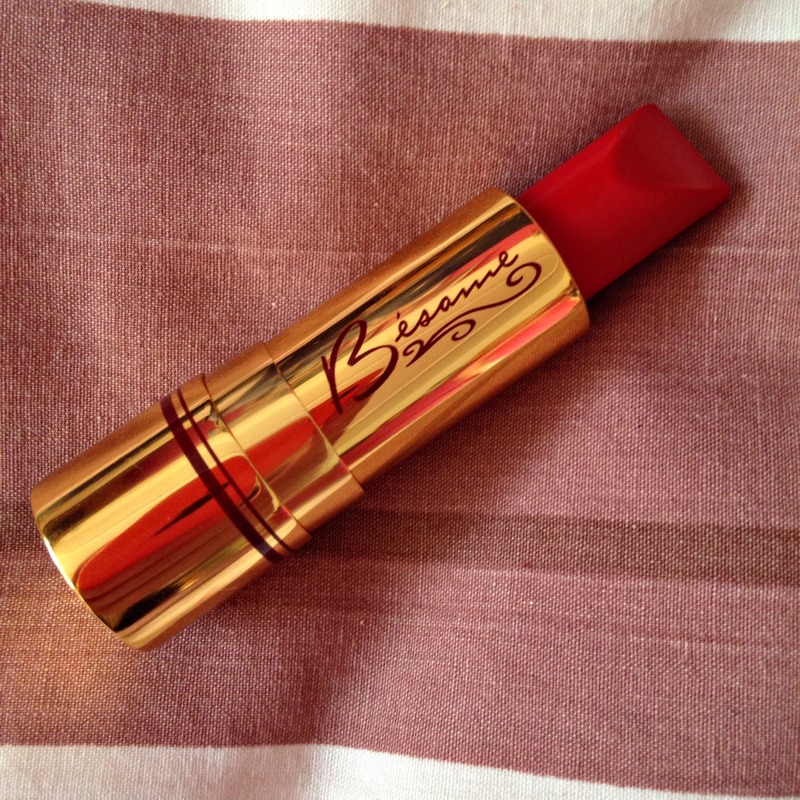 Bésame Cosmetics Classic Colour Lipstick in Red Hot Red. 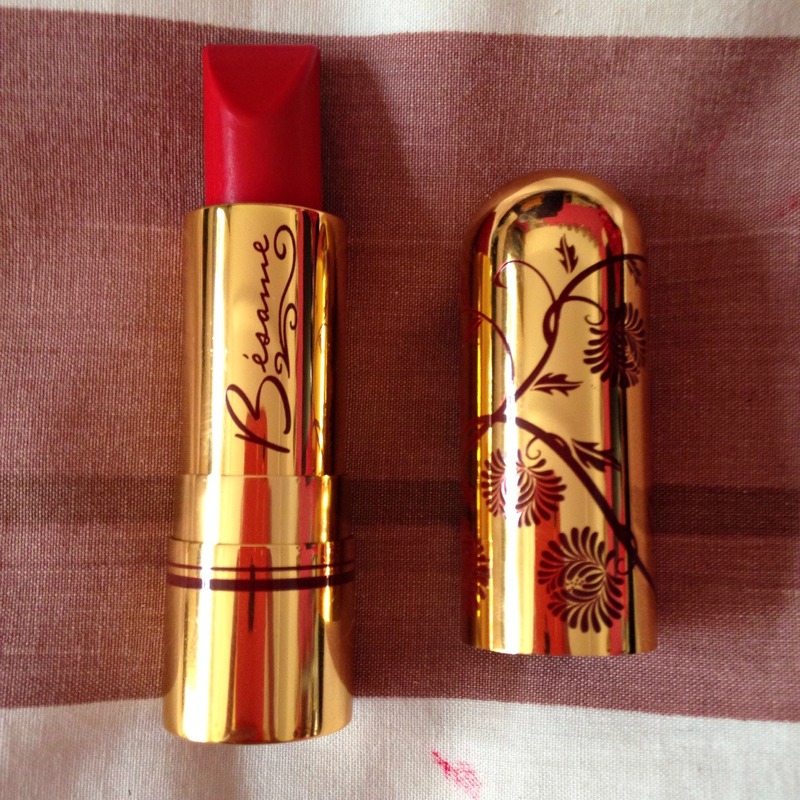 As soon as I discovered Bésame Cosmetics, I realized my dream Brand had been created and if you’re a vintage lover like myself – then I’m sure you’ll feel the same too. 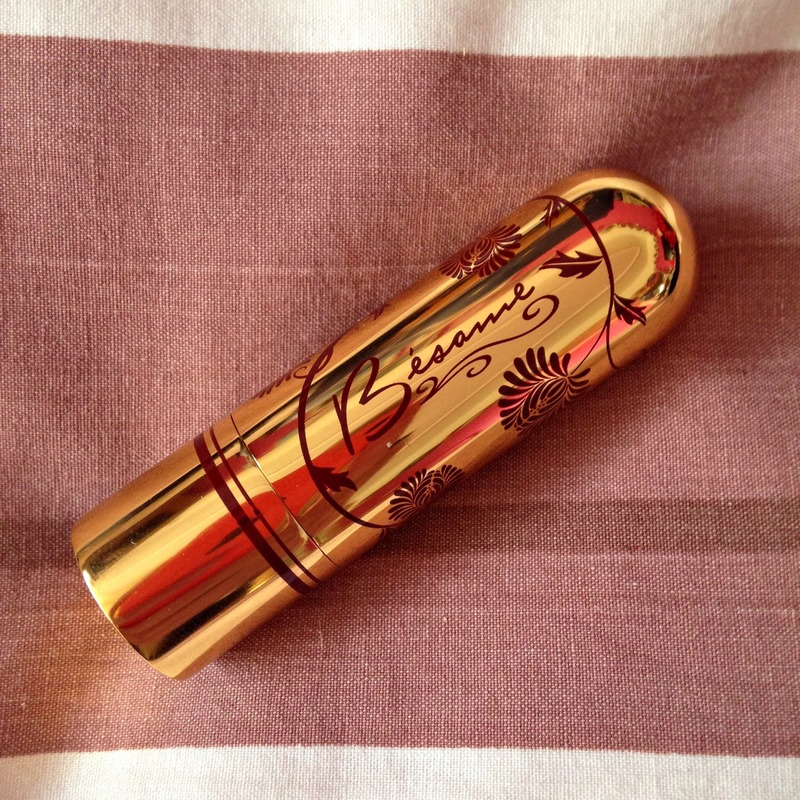 Bésame’s products are all inspired from actual vintage makeup which existed in the 1920s up to the 1960s and the packaging is also replicated to perfection. 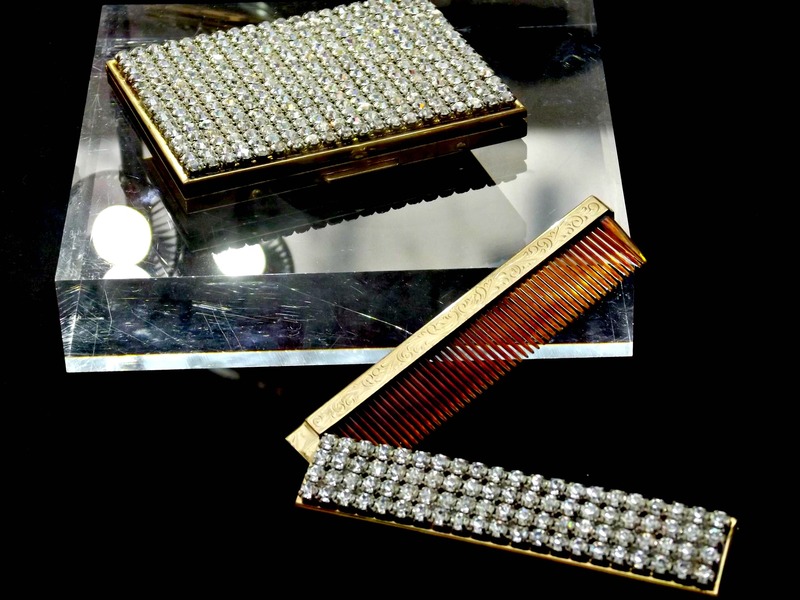 The historical research and dedication that has been used in creating all of the products is absolutely astounding and from lipstick to face powder they are each a work of art. Not only that, the brand is also cruelty free, which is just wonderful. 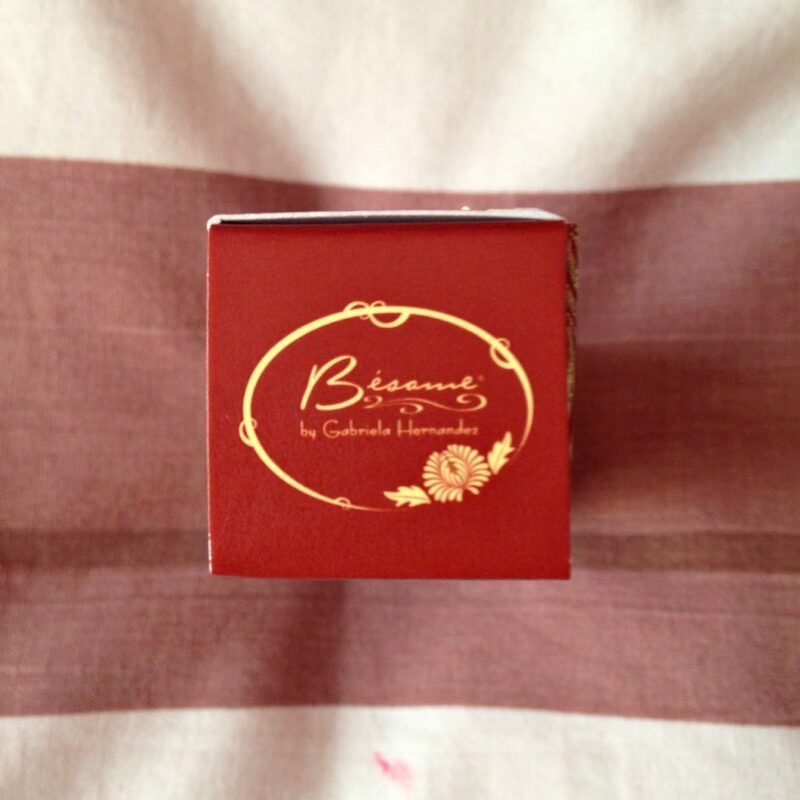 Therefore, when I discovered that Bésame was now being stocked on the UK website, cultbeauty, I knew that I had to add this amazing brand to my ever growing makeup collection. When I was looking through their lipsticks, I noticed each shade was named after a year, inspired by the shades released around that time, something so unique and such a wonderful idea. 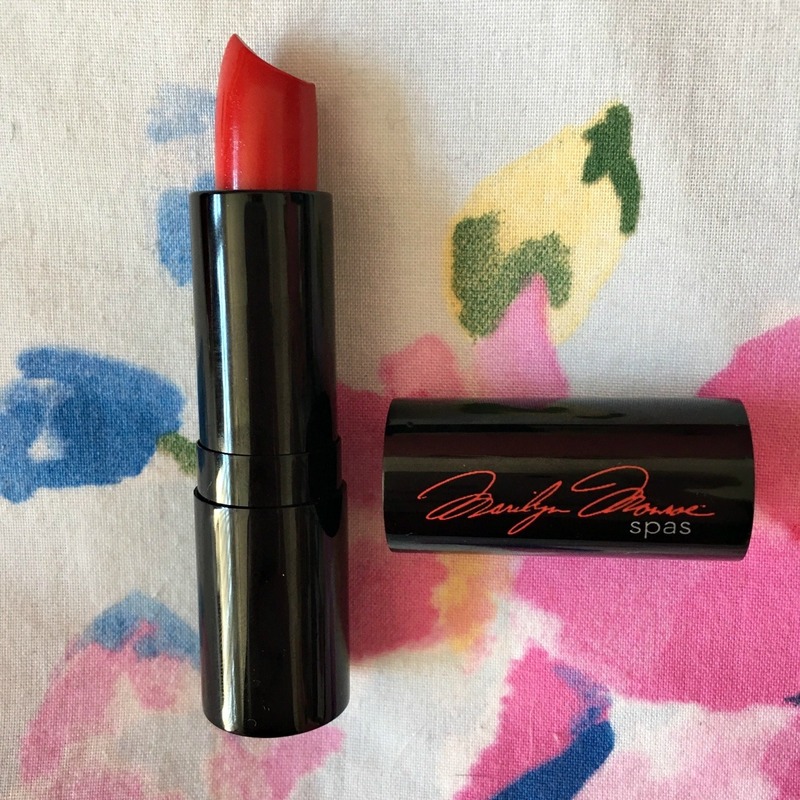 I was instantly drawn to, “1959 Red Hot Red” a lipstick which just so happened to be inspired by my absolute favourite – Marilyn! This shade is described online as a, “bold, brazen warm red” and I would definitely agree with that statement. 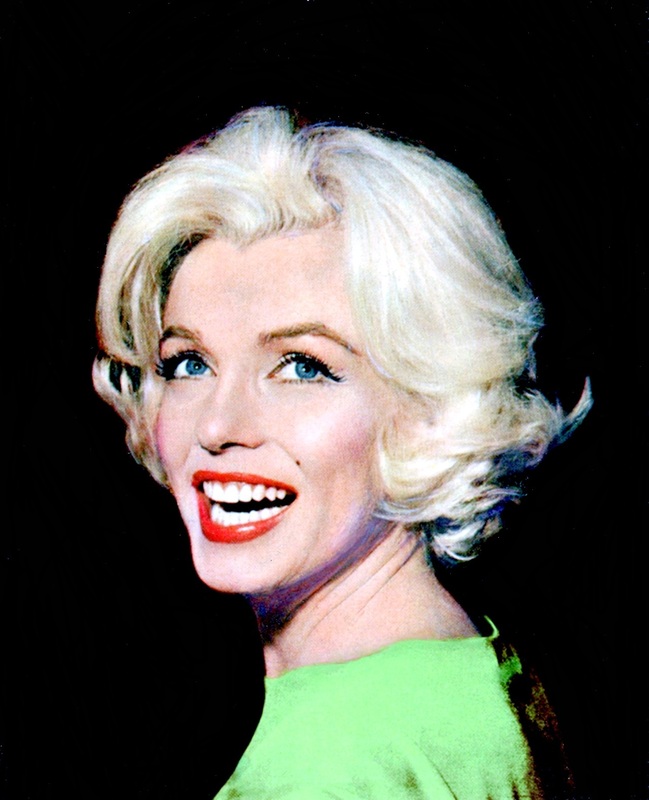 However, looking through the inspiration for this shade – photos of Marilyn in Some Like It Hot (1959) – I noticed that she continued to wear her cold blue tone reds which complimented her fair skin. Although, on some pictures the shade did look slightly warmer and as the film is in black and white, I’m only basing my opinion colour photos. 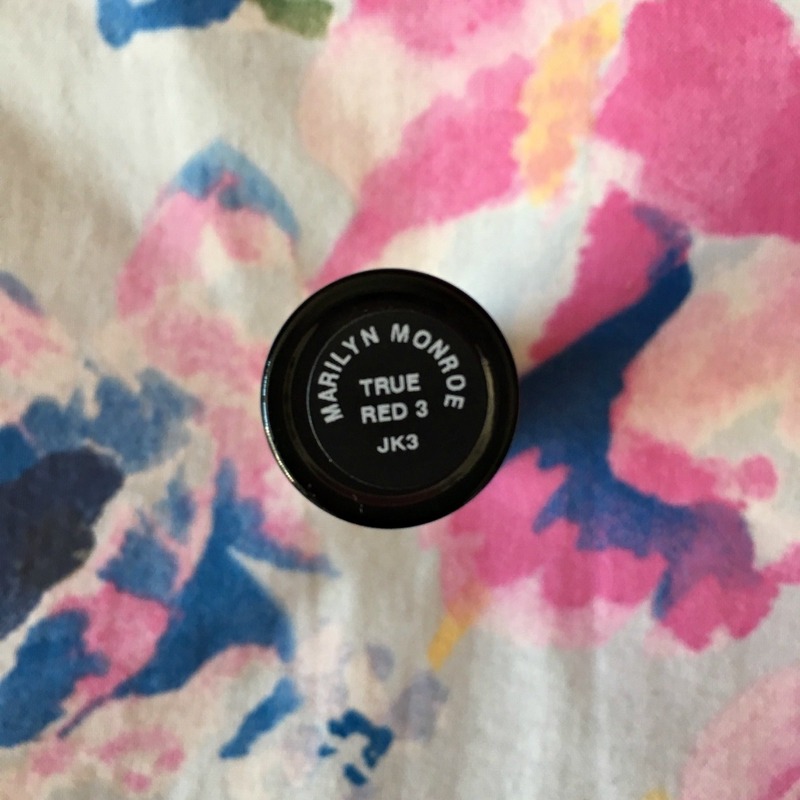 Ultimately, I’m very happy to have this shade in my collection as it is the only Marilyn, “inspired” lipstick so far, but I feel it doesn’t suit me as well as cooler toned reds. However, I still absolutely love the colour, you really can’t go wrong with a bold red. 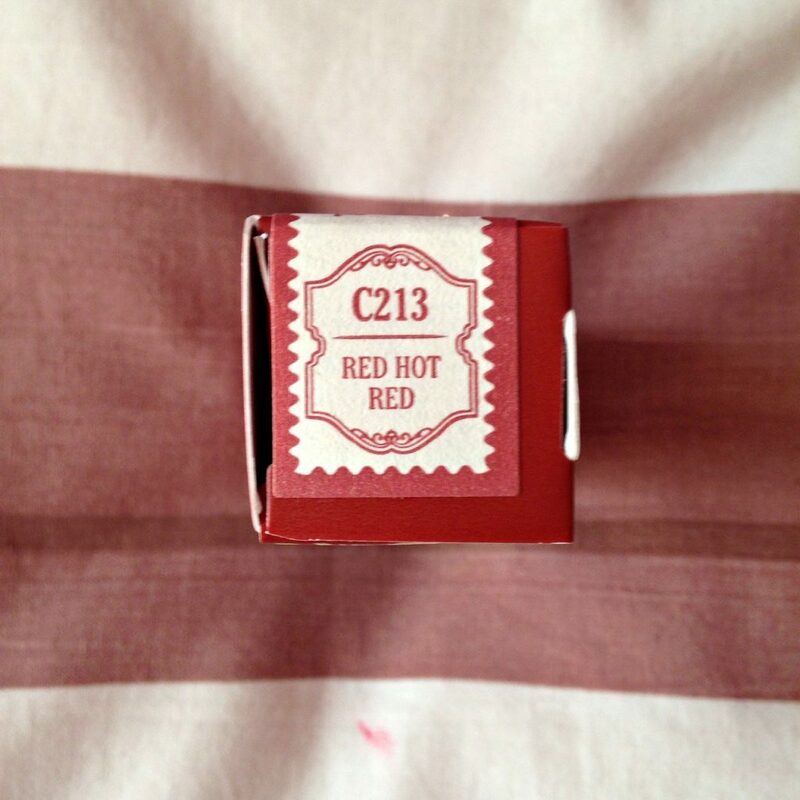 I think if I could choose another shade to buy it would definitely be, “1945 American Beauty” which is described as a, “cool berry red” although the shade looks slightly darker on the swatch photo. 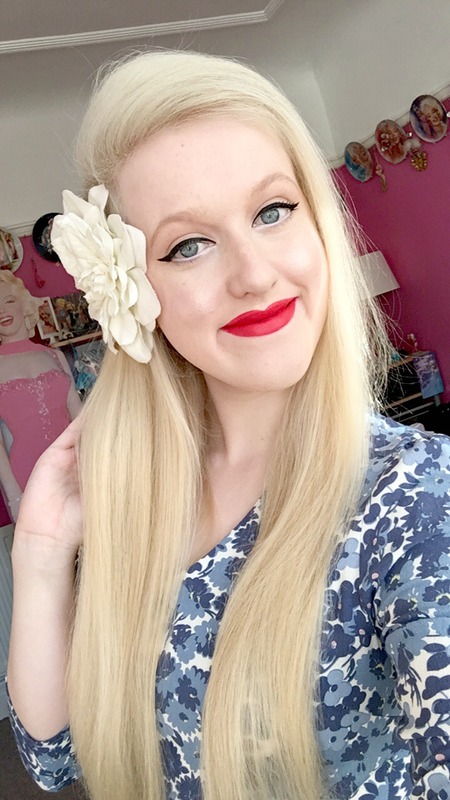 However, I’ve seen the lipstick on Pin Up Blogger Ashlyn Coco and it looks so beautiful on her, so it most definitely has my approval and is on my to buy list! 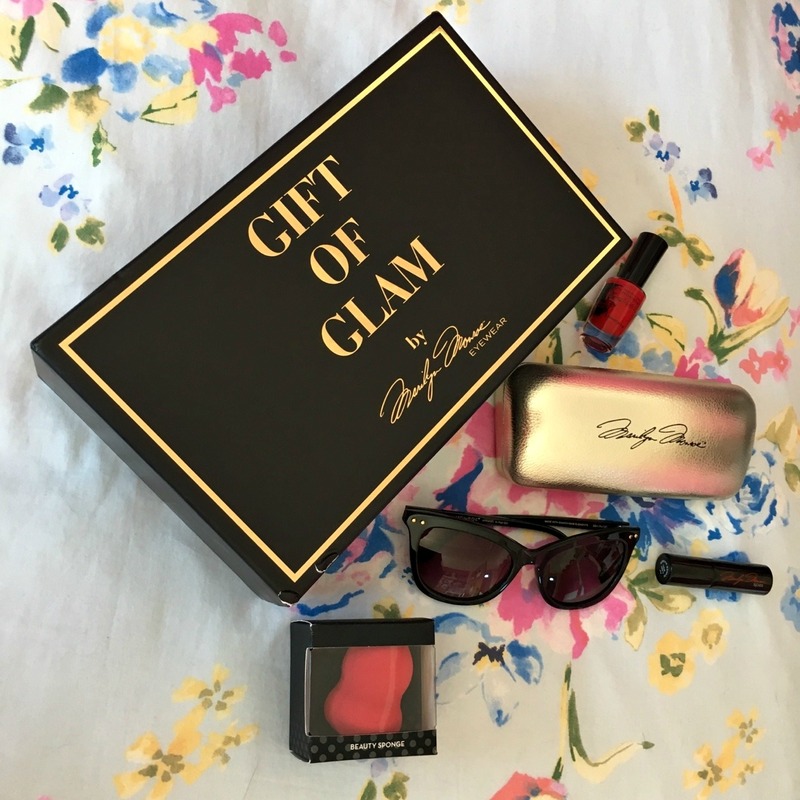 As I previously mentioned, the packaging for each lipstick is simply beyond beautiful, it’s chic, timeless and effortlessly glamorous. 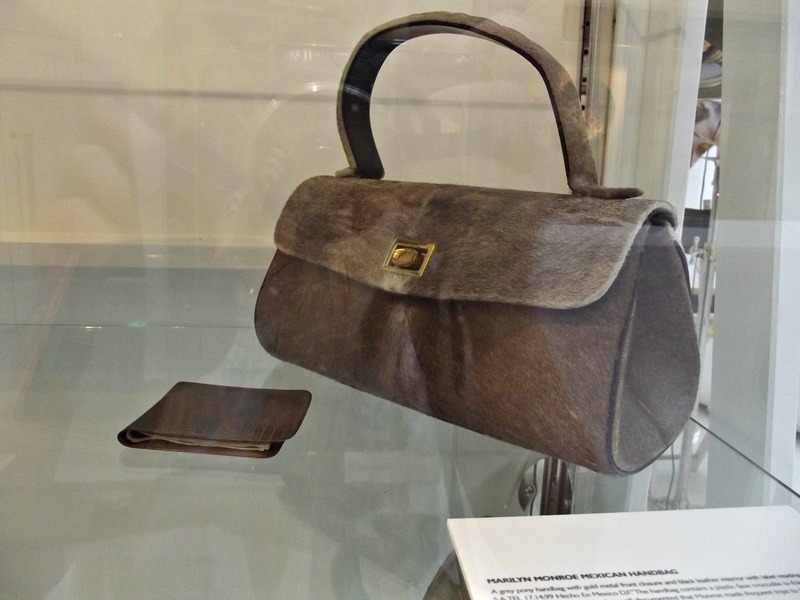 Their products are without doubt some of the most aesthetically pleasing available and so unique and committed to continuing the vintage style. 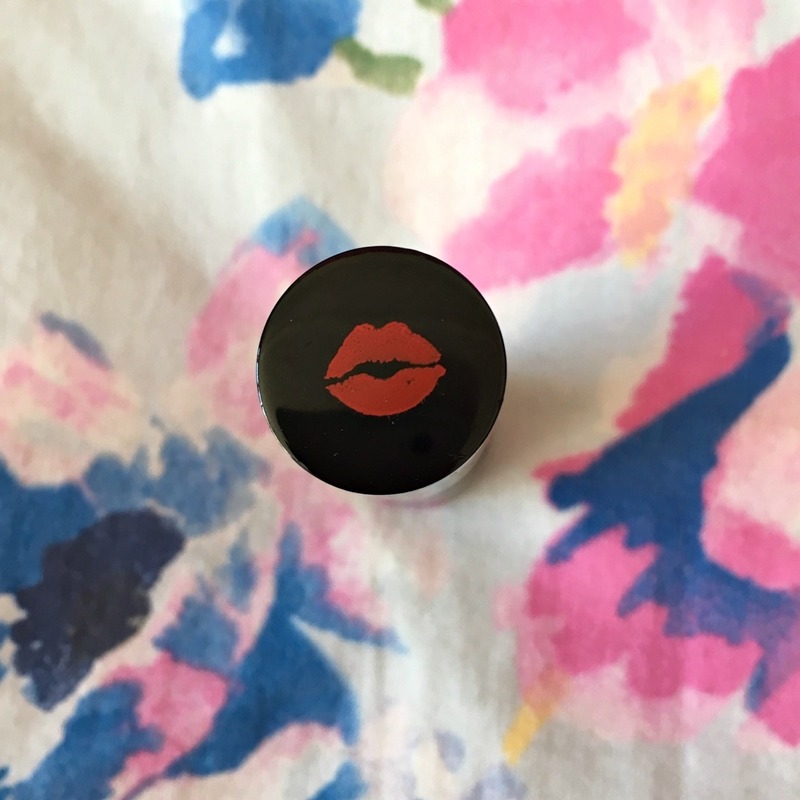 Furthermore, the lipsticks are even created like the classic products from the Golden Age of Hollywood and the tip is perfect for applying the perfect cupids bow shaped lip. Not only is the lipstick an absolute dream for your eyes, just as much precision and design has gone into the making of the box. 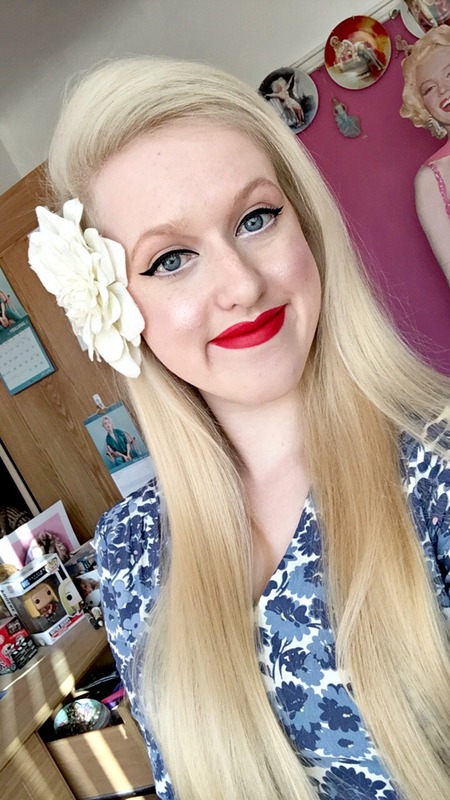 It truly feels like I own an authentic vintage lipstick and for a retro girl at heart – it’s absolutely wonderful! The matte finish is long lasting and very pigmented so not a lot of product is needed to created your perfect pout. 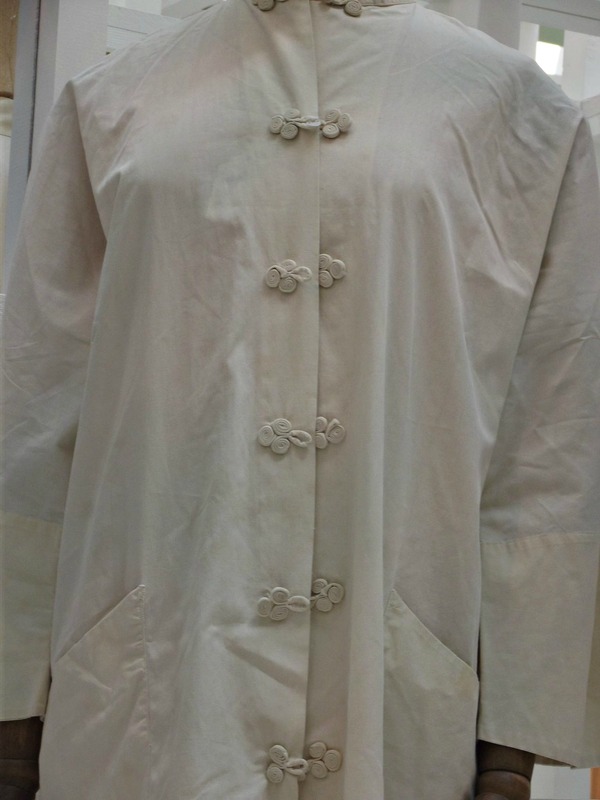 However, what harm can an extra layer do, right? After all, you can never have enough lipstick! Also, as red was the most popular shade in the vintage era, the majority of the lipsticks in the collection are different shades of, you guessed it -red! 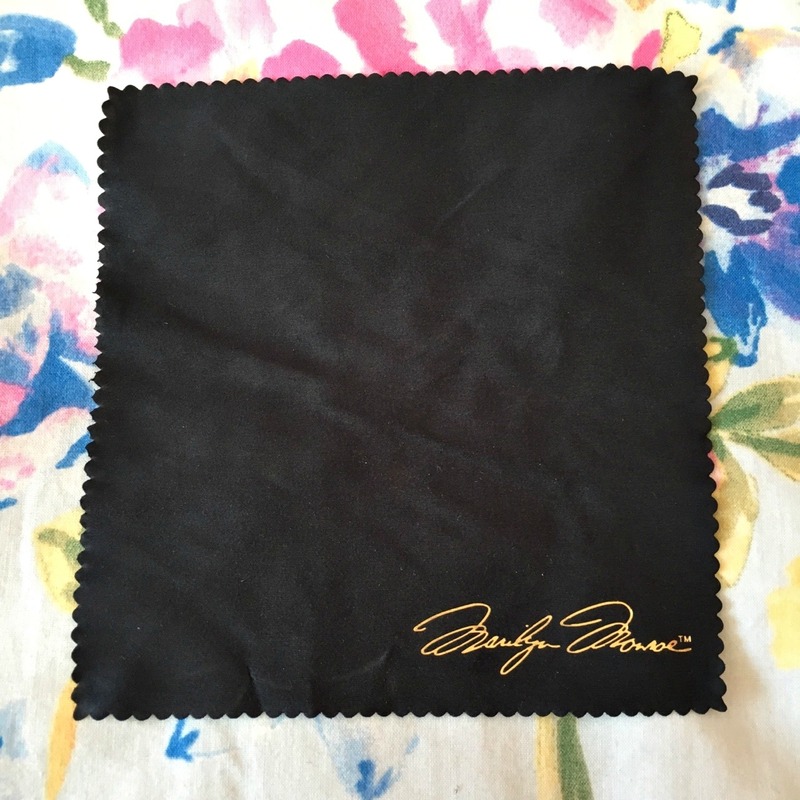 As a modern day vintage lover, Bésame is definitely the brand for me! Not to worry though, there are a few pink, plum and darker shades available – but ultimately not a huge variety of colours, apart from red. Therefore, if you’re after wild stand out neon shades, then these probably aren’t the lipsticks for you. At £18 each, these lipsticks are in the mid to high end brand range, so if you’re not as passionate about vintage and makeup like I am, then you can probably live without buying one as there are lots of amazing red lipsticks for much more affordable prices. However, if you’re after a quality, long lasting, incredibly aesthetically pleasing lipstick – then Bésame is a must add to the collection! I look forward to trying all of their other products at some point and I must say, it’s so refreshing how quite a few brands are being inspired by the vintage look! Soap and Glory, Benefit, The Balm – I could go on! It just goes to show how timeless and iconic Classic Hollywood is and if it’s not broke – don’t fix it. It’s hard to believe that on the night of August 4th, Marilyn passed away and would no longer bless us with her presence on Earth. 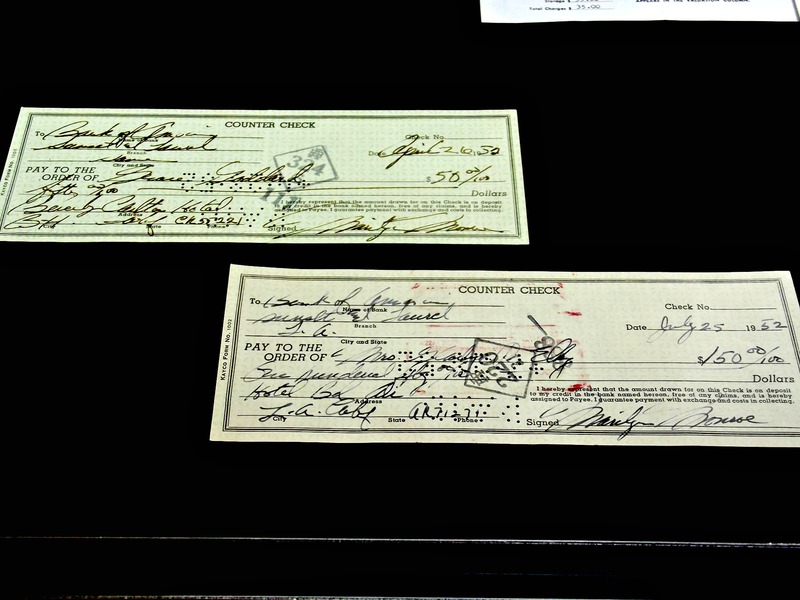 It’s even more amazing that this didn’t happen last year, but fifty four years ago today. 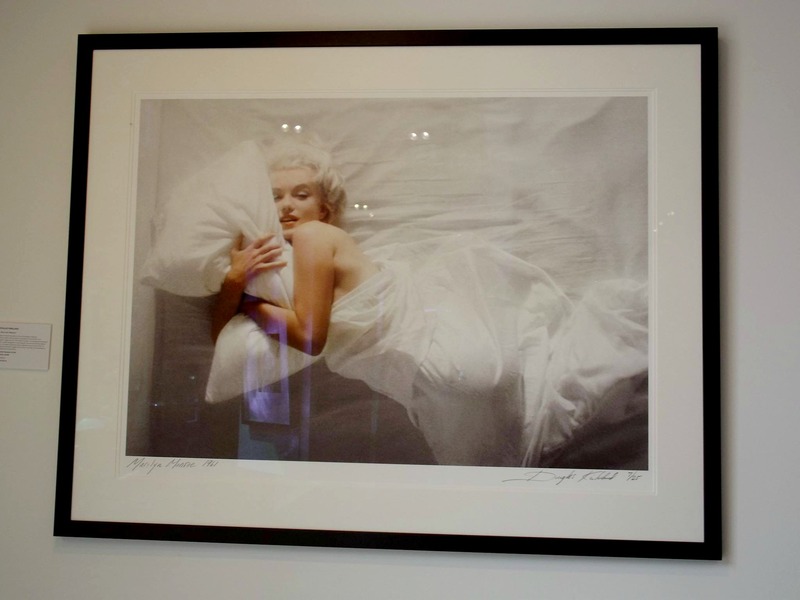 Marilyn was found on the early hours of the morning on August 5th and thus her death was announced as that day, however, rigor mortis had already set in which shows she actually passed sometime late the night before. When I think about this day I’m filled with sadness, as the world didn’t just lose a huge star, more importantly, we lost a beautiful person which a kind soul and sensitive nature. I often wonder if Marilyn can see the world now and knows the huge legacy she has left over half a century on. Would she believe she was capable of this? Sadly I don’t think so, she never gave herself much credit for her special qualities. However, I’m sure she would be filled with happiness and feel loved, something she strove to find her whole life. 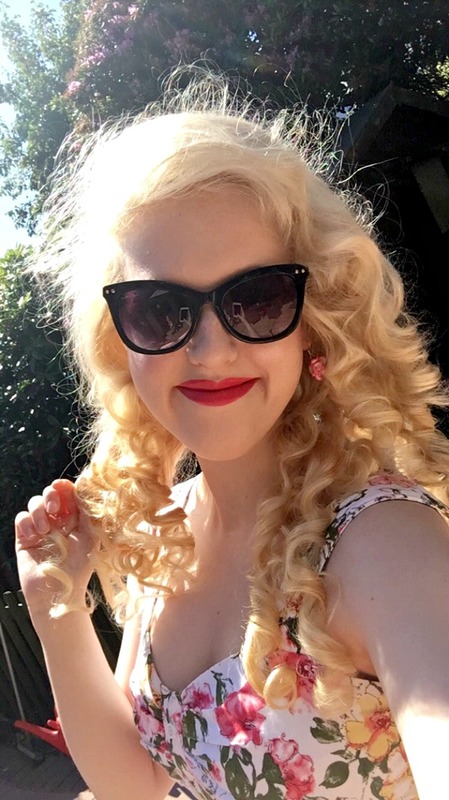 Although there is a huge amount of love for Marilyn, there are a lot of misconceptions and upsetting myths and lies that people have spread about her. You’ll probably notice that if a star dies young and tragically, millions of ridiculous theories with zero credit or substance start pouring out each year. Whilst making notoriety for themselves and lots of money, they neglect the one person that they’re making a profit from and not once do they think about the damage they are causing. 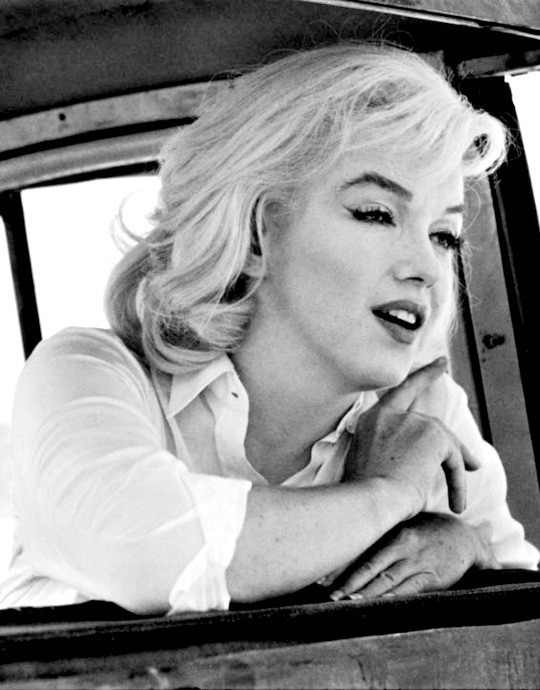 – Marilyn to photographer friend and author George Barris in the summer of 1962. Of course, everyone is entitled to have their own opinion and feelings about someone, however, at least learn the actual truth and stop reading perpetual myths and lies as fact. I know it’s hard to believe but I do realize that Marilyn wasn’t actually perfect, but hating someone based on judgement and conspiracy is just plain ignorant and petty. At the end of the day I just remind myself it’s their loss, they’re the ones missing out on one very special lady. I hope whatever you do today that you take a moment to think about this beautiful human being and hold a special thought for her. Marilyn may have not achieved her dream of having her own family, but she did achieve everlasting love and devotion from her millions of fans all around the world. She is instantly recognizable and ultimately immortal due to her iconic screen presence which is truly like no other. When I think of Marilyn, a feeling of warmness and hope comes over me, to me this incredible lady was one of the strongest people who has ever lived. She suffered abuse, loneliness, isolation and through all of this worked extremely hard to achieve her dreams. Marilyn never stopped believing and always aimed to perfect her talents and improve herself, even when so many never saw her more than an image. It’s incredible to see how far she came in just thirty six years with such odds stacked against her. I wonder if she ever thought someone was looking down on her, perhaps a Guardian Angel? I bet she never thought that so many, including myself, would one day see her as theirs. 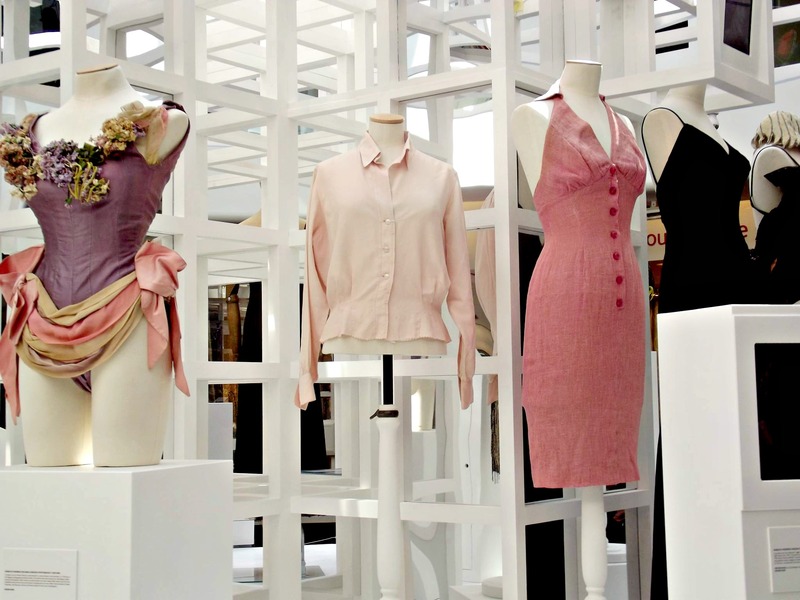 50 Years Of Valley Of The Dolls. 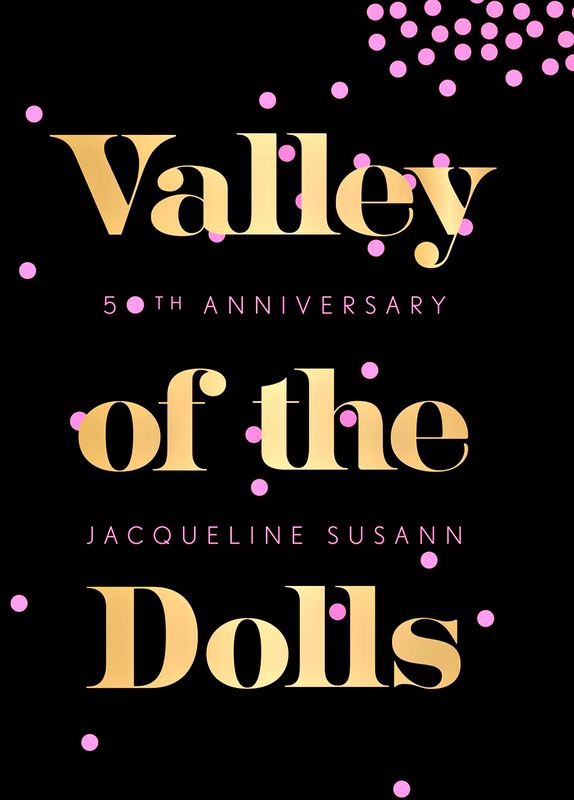 It’s hard to believe that fifty years ago the iconic Valley of the Dolls by Jacqueline Susann was published. It became a huge success, becoming the most popular selling fiction of 1966 and has since sold over thirty million copies, not bad right? The novel follows three girls; Anne, Neely and Jennifer, who follow their aspirations of becoming stars. They all meet and befriend each other as we see their lives unfold through success and failure over the next twenty years. Although a work of fiction, there have been numerous links to the characters in the novel and real life stars and a lot of the content is said to be based on the authors experience as a struggling actress. Within a year of it’s release Twentieth Century Fox bought the film rights and one of the most iconic movies of the decade was released. Although panned by most critics as extremely over the top, the movie was a huge commercial success and has since gained a cult following. The one star of the film that received little negative criticism was Sharon Tate, who played Jennifer North, arguably the most sympathetic character of the novel and was nominated for a Golden Globe for Best Newcomer. Admittedly, as a huge fan of Sharon, this is the original reason I wanted to watch the film, however, after seeing it numerous times it is without doubt a 1960s classic and a must see. Not only is the glamour and clothes beautiful, but it contrasts with the darker side of materialism and fame and ultimately makes you think, is it all worth it? To celebrate fifty years of Valley of the Dolls the book, which has sadly been out of print for some time, has been re-released and is available on amazon to buy for just £6.99! I’m actually ashamed to say that although I’ve seen the film numerous times, I’ve yet to read the book! However, this is not because I didn’t want to, as I love reading, it’s just quite hard to buy for a good price as it was pretty rare. I’ve heard that the ending to the film and the novel are very different, so I look forward to comparing them and seeing which I prefer! The film is also being released on Blu-Ray this September which I am very excited about. I think the number one reason that the novel and film are still so relevant fifty years later is because everything that Jacqueline wrote about half a century ago is still happening now! Not only is the fashion and style still being replicated and endures but the pitfalls of fame and drugs are constantly being talked about in the media. Although it is often viewed as frivolous and something to indulge in and not take seriously, it covers an extremely serious subject of addiction. It’s actually quite sad when you think not much has changed half a century on, but at least there is more awareness. Since the book was published in 1966, it has been adapted numerous times for television and film, songs have been written, styles have been copied and the title is forever etched inside our minds. 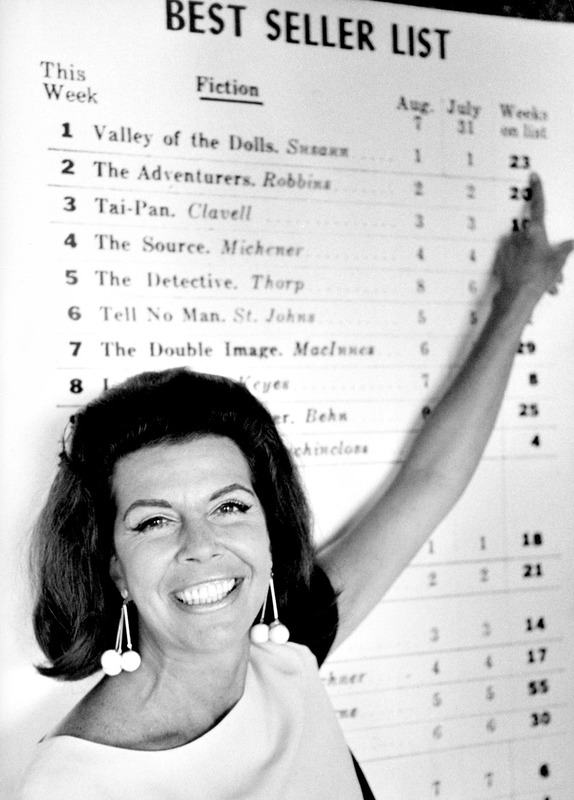 – Valley of the Dolls by Jacqueline Susann. 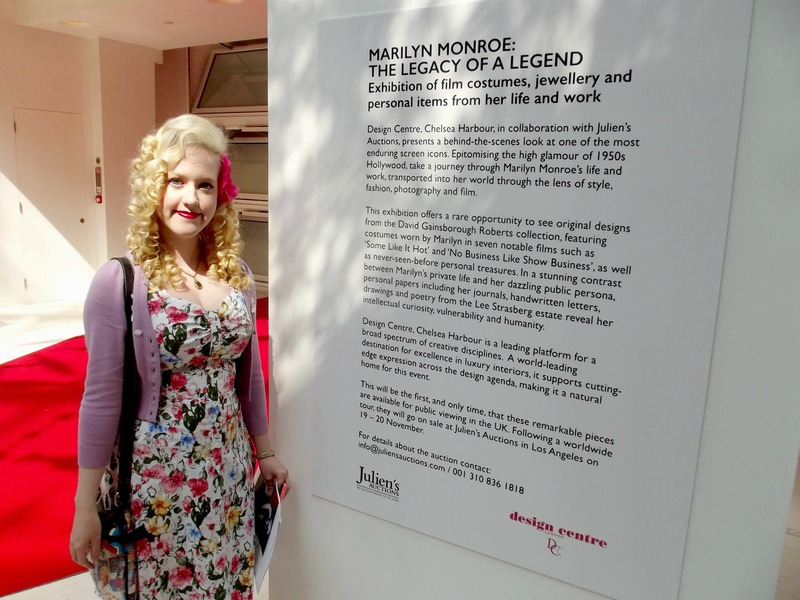 I have just returned home from London after spending a wonderful three nights there to see the temporary Marilyn Exhibition held at the Chelsea Design Centre. 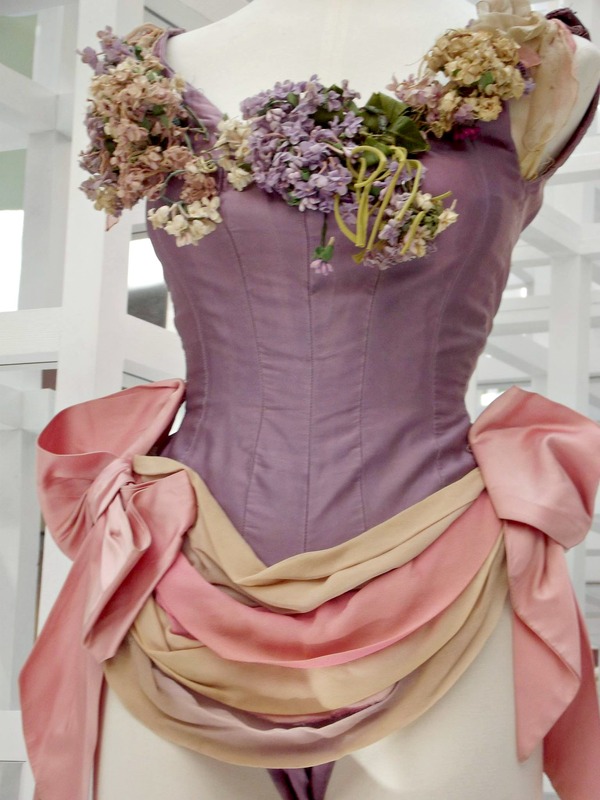 Marilyn Collector David Gainsborough Roberts has announced he will be selling his large collection of costumes and personal items at Julien’s in November. 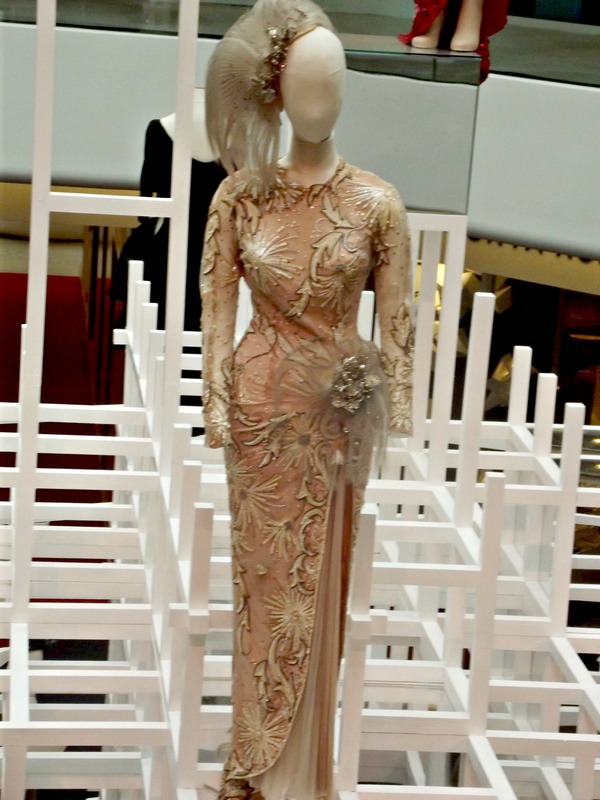 Before then, they will be displayed all over the world with London being the first stop until 20th June. 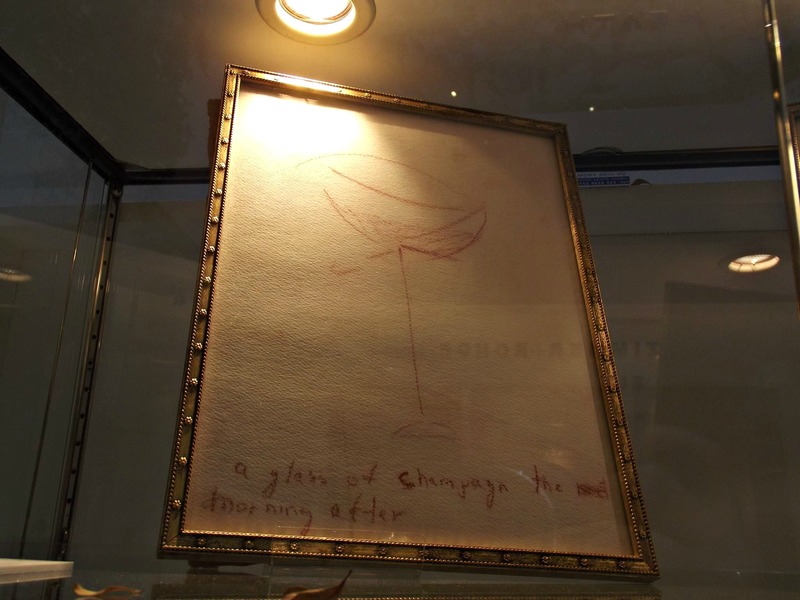 Also being sold are personal items of owned by The Estate of Lee Strasberg, who Marilyn left 75% of her belongings to when she passed in 1962. 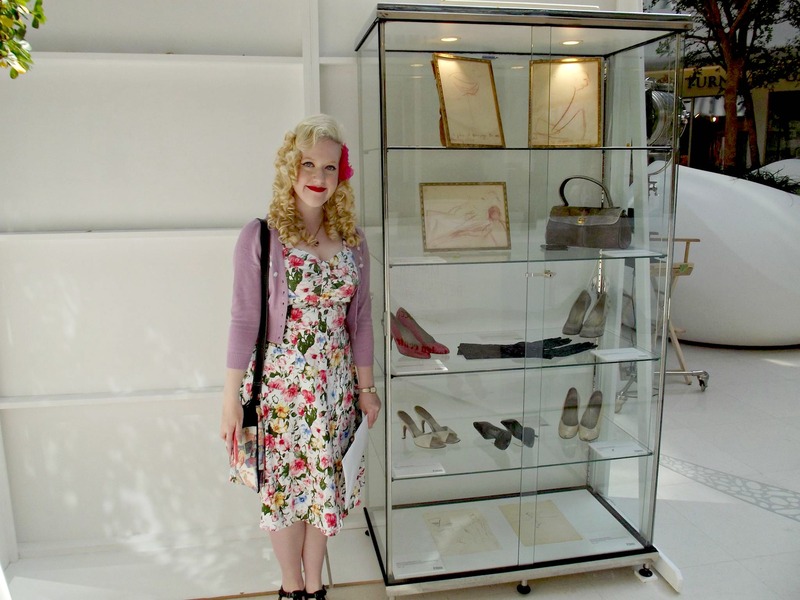 I’m very lucky to be able to say I’ve seen quite a lot of Marilyn’s items since I discovered her in October 2010. 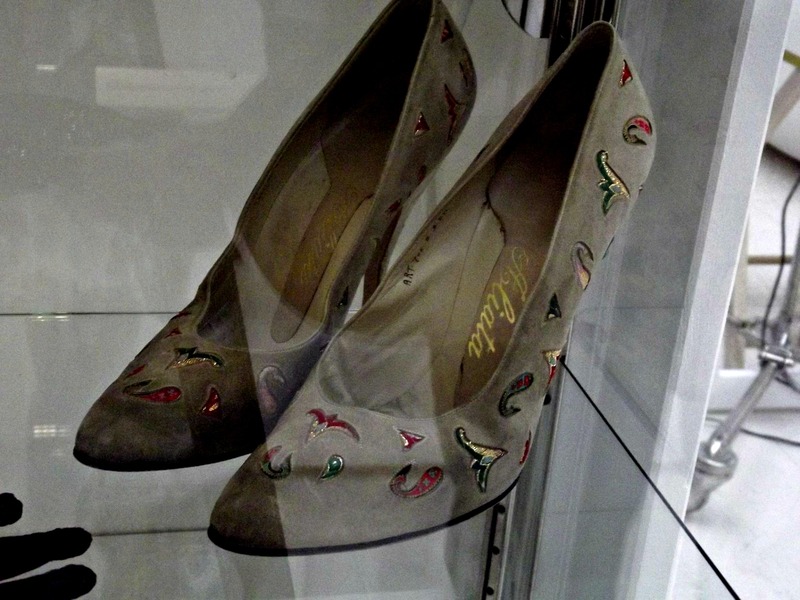 I previously saw a fair amount of David’s Marilyn Collection in March 2012 and as soon as I heard about him selling all of his items in November 2016 I knew I had to see them one more time, as well as Lee Strasberg’s which are also being sold. 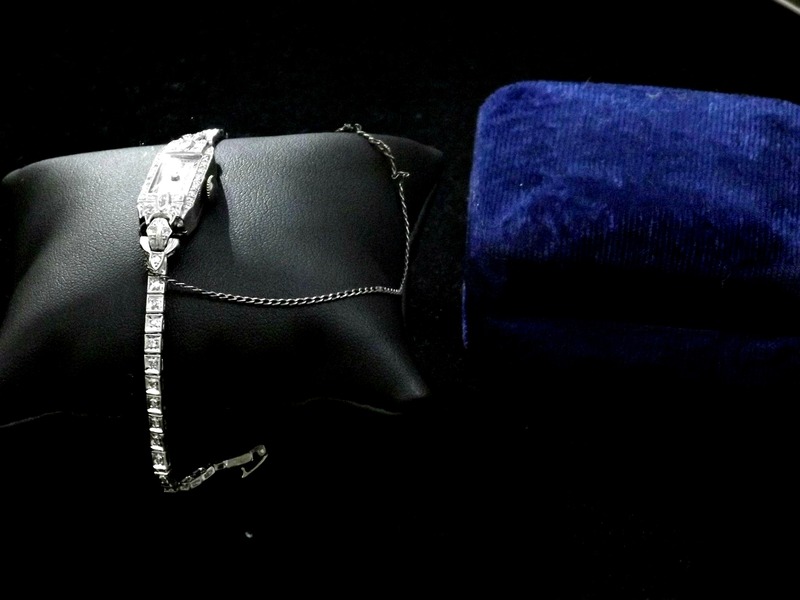 Marilyn fans are very fortunate that a lot of private collectors such as, Scott Fortner and Ted Stampfer kindly continue to share their Marilyn owned items with us. 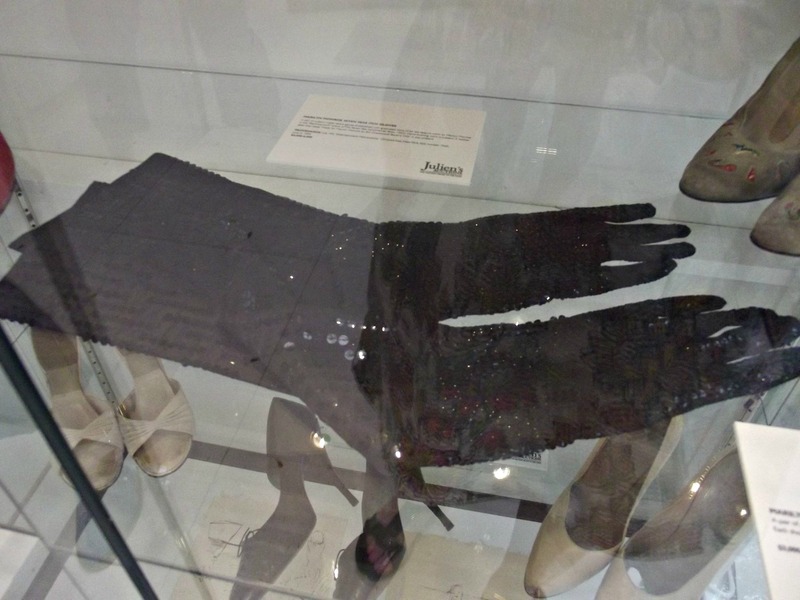 However, so many of her items get sold and tragically are never seen again which is incredibly upsetting as I always like to think if Marilyn belonged to anyone, it was to the public who loved her so much. 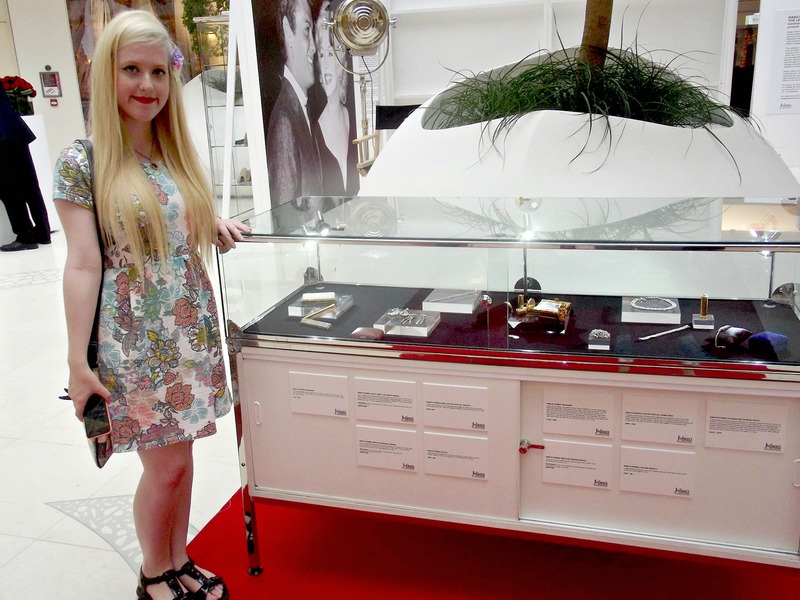 It was so lovely to see how beautifully displayed Marilyn’s items were at the Design Centre in Chelsea, as soon as myself and my mum arrived the staff asked if I was here for the Exhibition, I guess I don’t hide my excitement very well! 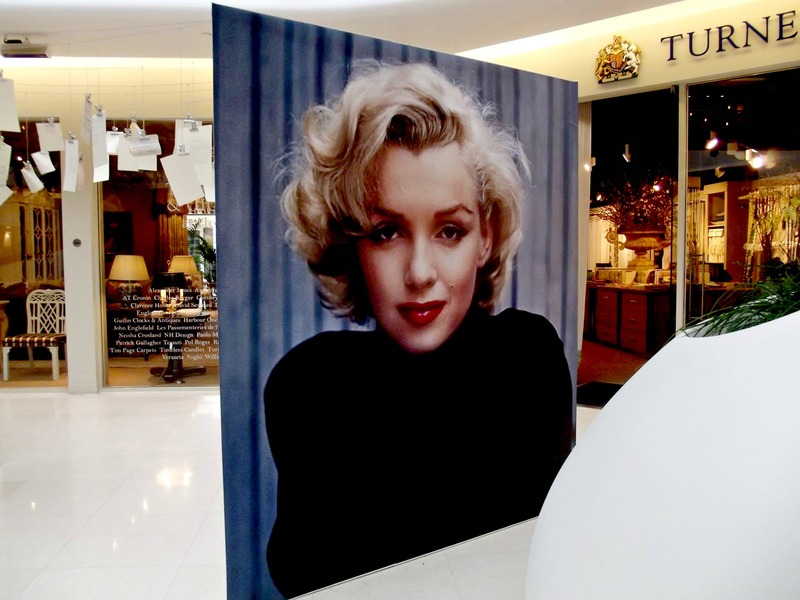 As soon as you enter the building you are surrounded by beautiful portraits of Marilyn that are displayed from ceiling to floor. It gets even better when you walk through the doors and sense what’s to be seen in only a matter of seconds! 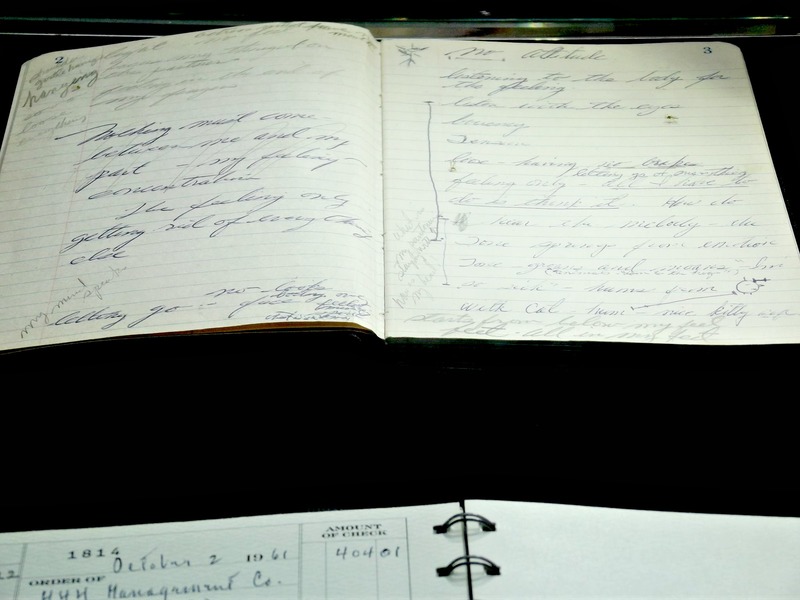 The first collection that you witness is Lee Strasberg’s Marilyn items, so everything from make up, jewelry, letters, shoes and sketches! 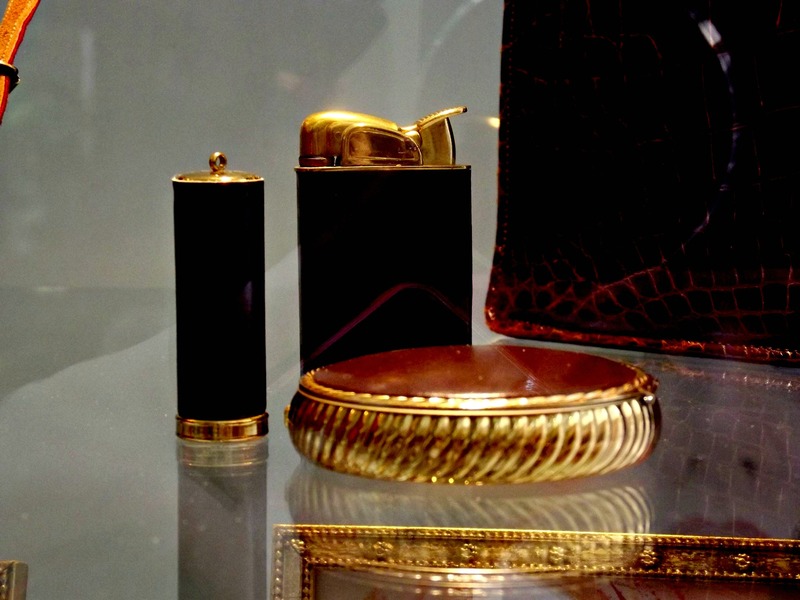 I had not seen any of these personal belongings before and was truly amazed at what was just a few inches in front of me. Of course I am slightly biased, but everything really was truly stunning and ever so special. 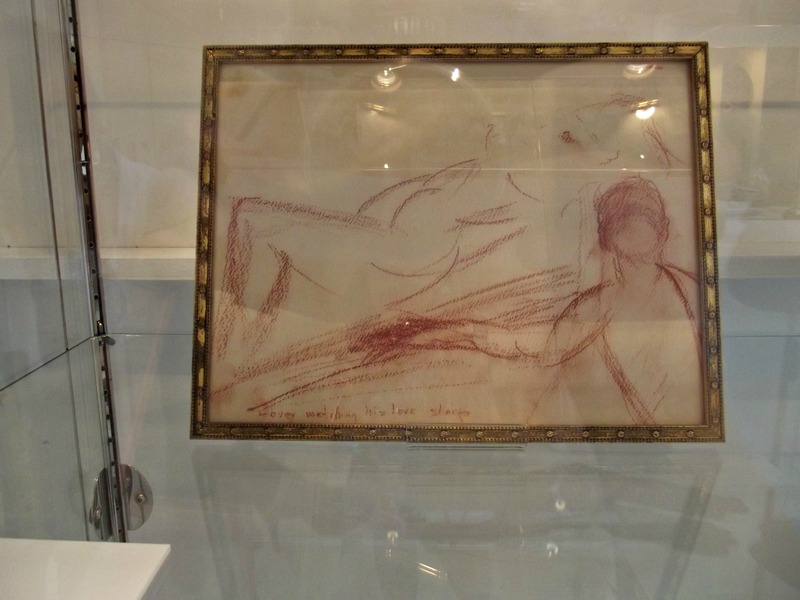 I think one of my favourite items would have to be Marilyn’s sketches, in particular one called, “Lover watching his lover sleep.” I instantly thought of Marilyn sleeping whilst Arthur gazed at his beautiful wife. 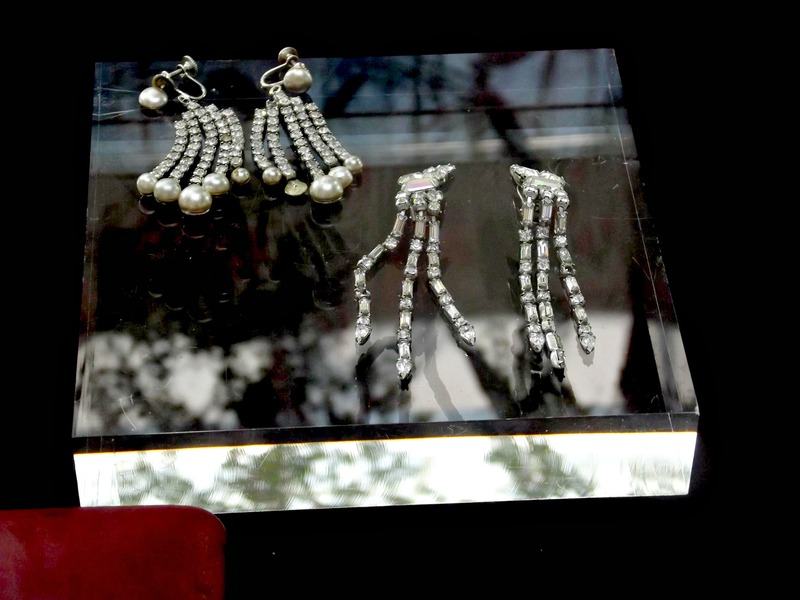 The collection of jewelry was effortlessly glamourous. 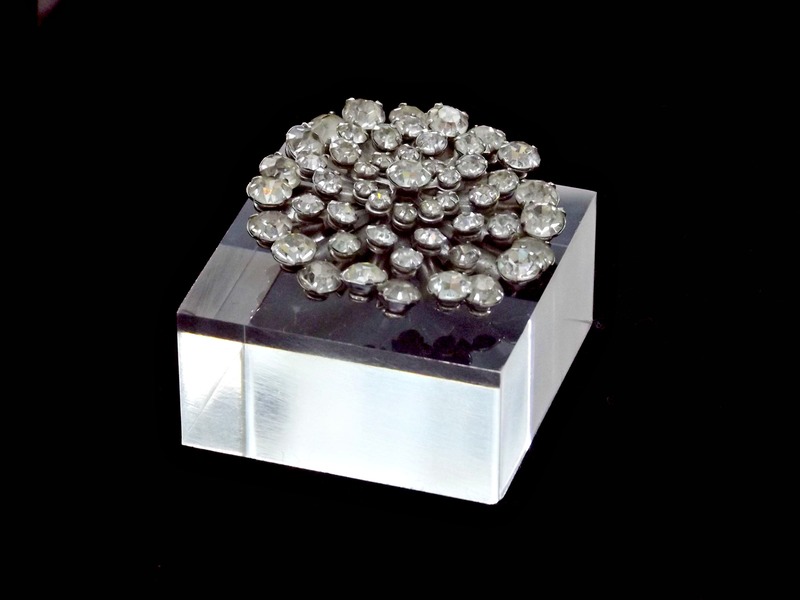 Most Marilyn fans will know that Marilyn did not think Diamond’s were a girls best friend and was much more interested in books than the perfect ring. 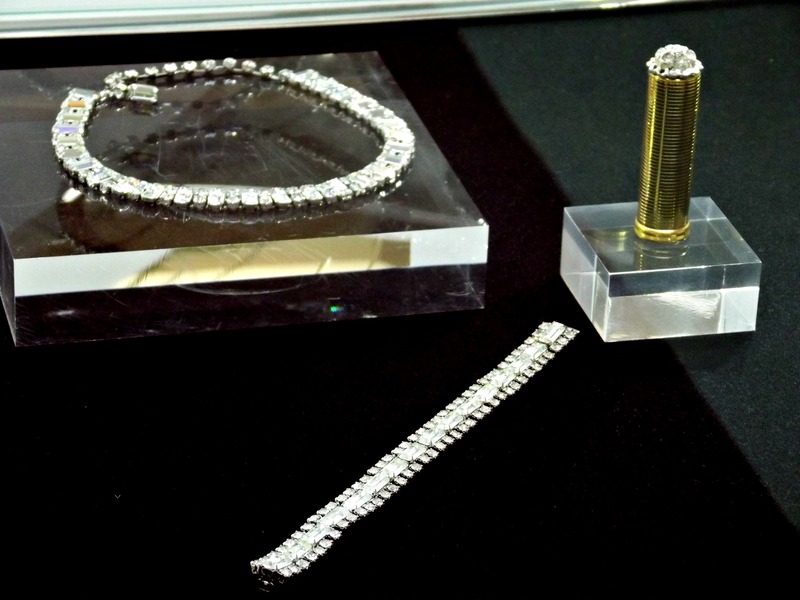 Therefore, because of this I think the items that were on display were extra special, as any items Marilyn owned must have had some special personal attachment or value. I absolutely adored the Revlon Lipstick, I think if I could own anything from that part of the collection this would be it. Of course, red lipstick is forever linked to Marilyn’s image, but I just loved the vintage display of it, so effortlessly glamourous. I actually tweeted Revlon telling them that they should re-release this shade to coincide with the auction and they liked my tweet so, I shall keep my fingers crossed! 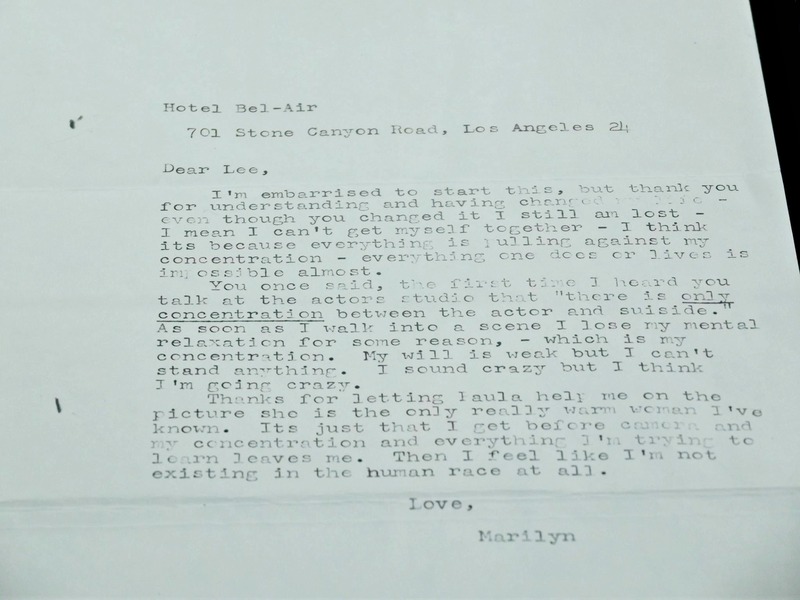 For me, what I found most special in Lee Strasberg’s owned items were all of Marilyn’s personal letters and stationary. 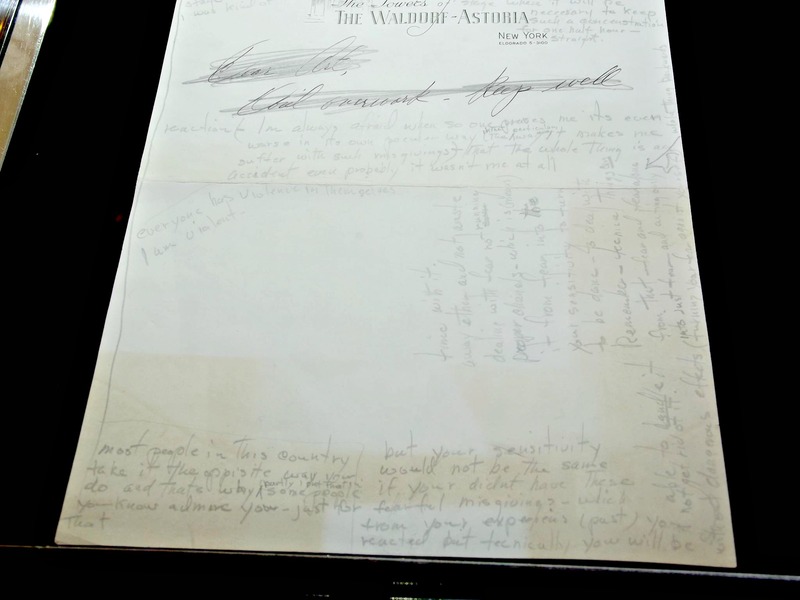 I recognized a lot of the writings as it is featured in the amazing book Fragments – a must for any Marilyn fan! 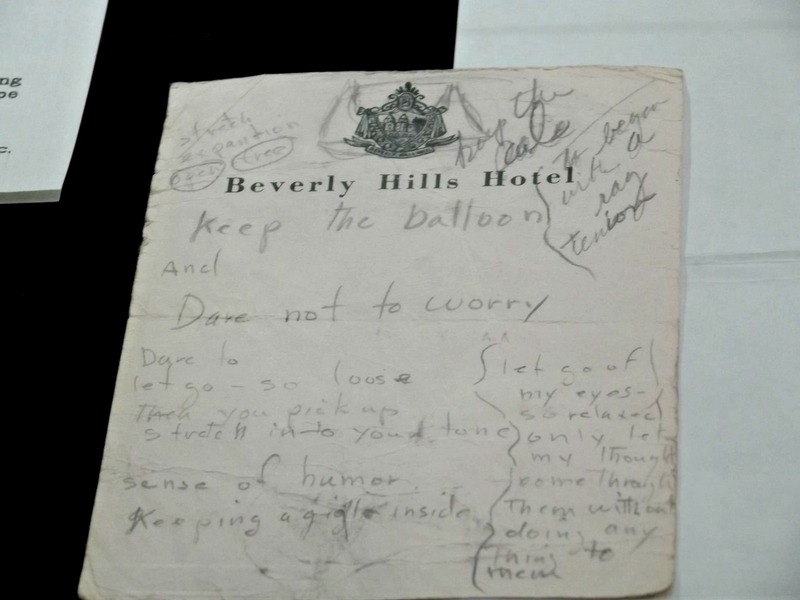 Of course a lot of it was very sad to read as Marilyn suffered so much with her anxieties, but what warmed my heart were the beautiful inspiring sayings she would write to herself, “Dare not to worry” being a favourite. 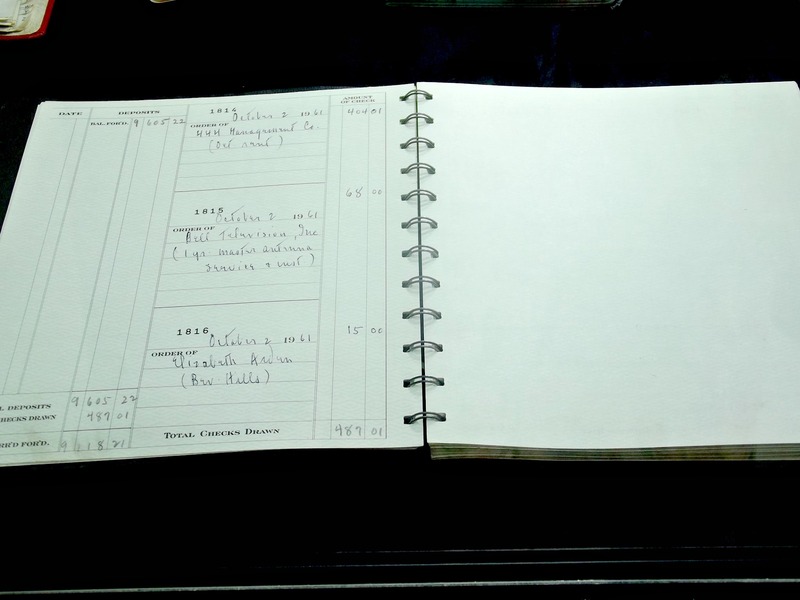 Part of me feels reading the items is an invasion of Marilyn’s privacy and to an extent it is as I’m sure if Marilyn was still alive we probably wouldn’t be reading them. However, reading these items shows a lot of the true Marilyn which is sadly so often hidden by conspiracies and inaccuracies. These writings so a talented artist who forever wanted to learn and improve and a beautiful, vulnerable soul who ultimately just wanted to be happy. I’m sure after reading these a lot of people would have more respect and admiration for Marilyn and I’m sure that would mean a lot to the wonderful lady herself. 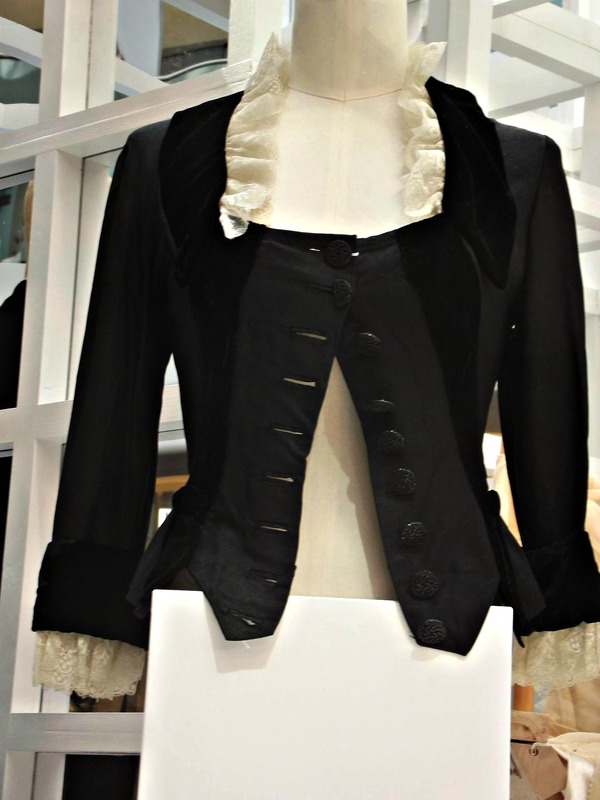 After experiencing this amazing collection I then walked through to the final part of the exhibit; Marilyn’s film costumes and clothes owned by David Gainsborough Roberts. 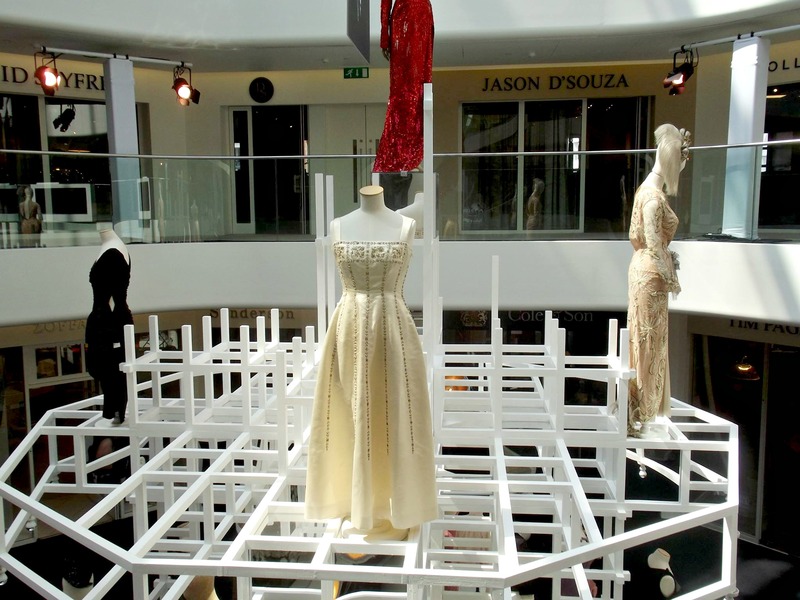 The display lay out was absolutely stunning, all clothes where shown on a circular display with two levels, and four huge posters of Marilyn wearing the clothes hung at the top of the ceiling. 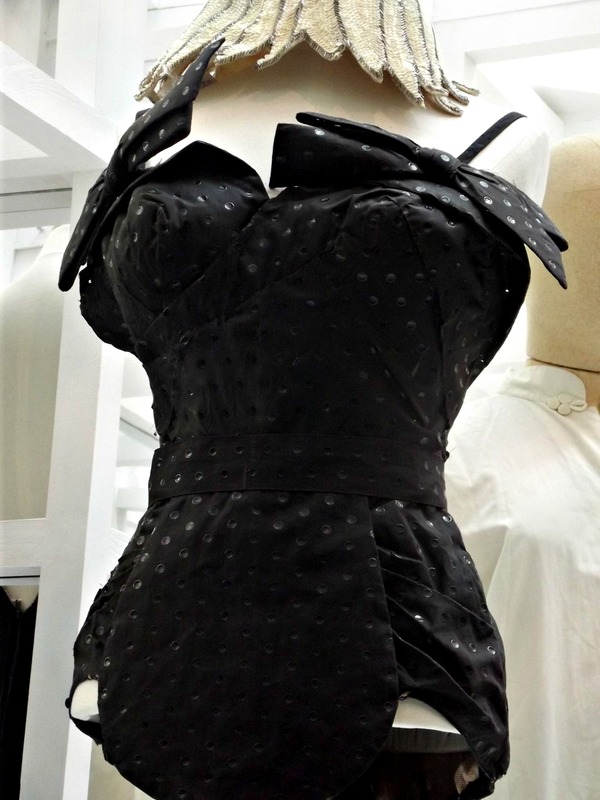 Some of the costumes even had blu-ray footage of Marilyn wearing the clothes which was a wonderful addition. 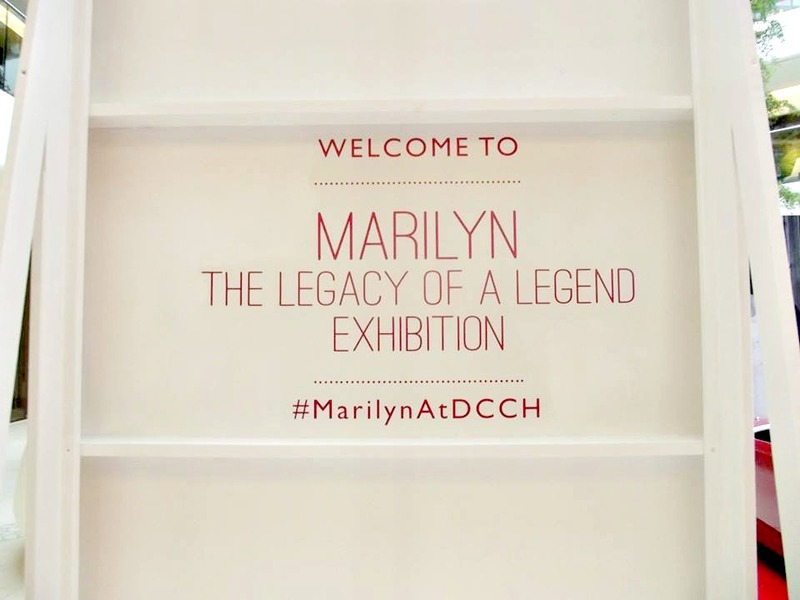 It was fascinating to see the age range of people visiting the exhibition, it just further emphasizes the impact Marilyn has on everyone, she truly is loved by people of all ages. 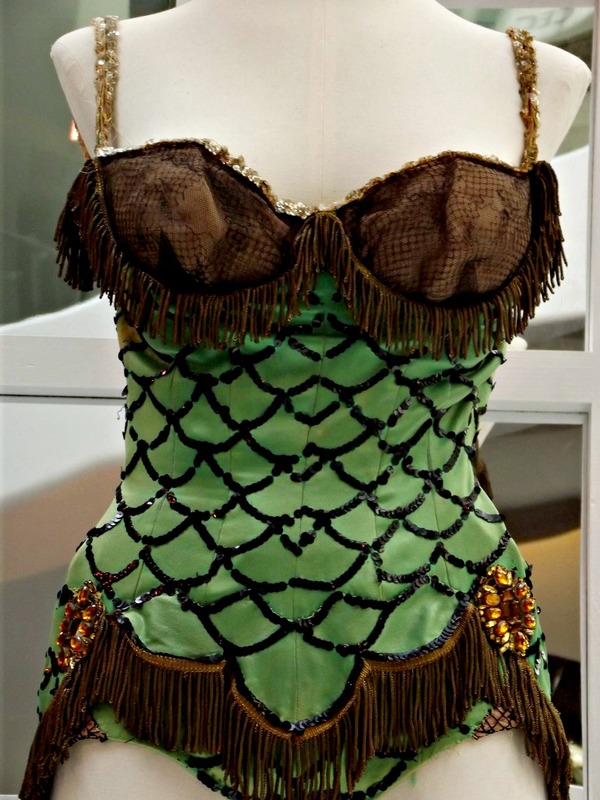 I think if I could choose one item from David’s collection to own it would have to be the Green Leotard Marilyn wears in Bus Stop (1956) to sing, “That Old Black Magic” I just adore it. 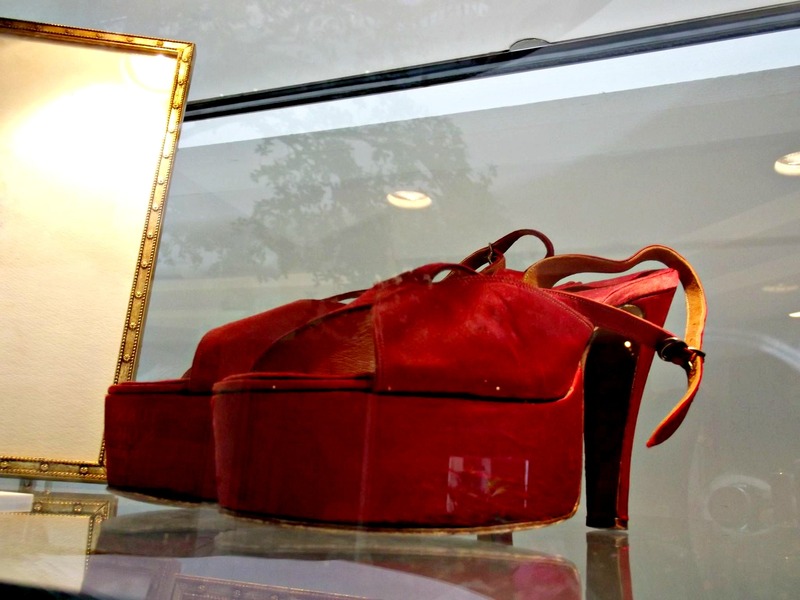 Everyone who viewed the items kept saying how tiny Marilyn was, I still find it fascinating that people are shocked by this when her measurements were 35-22-35. 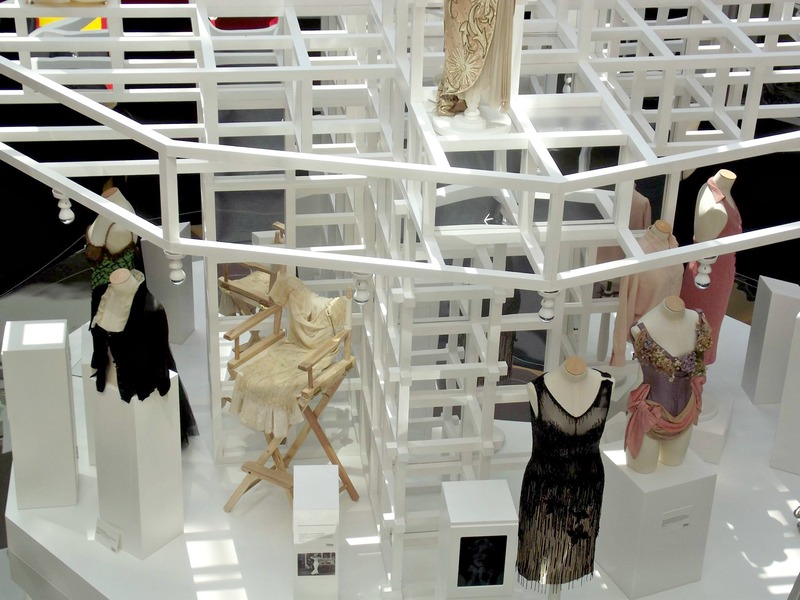 The exhibit was truly beautiful and a must see for any Marilyn fan or lover of Old Hollywood. 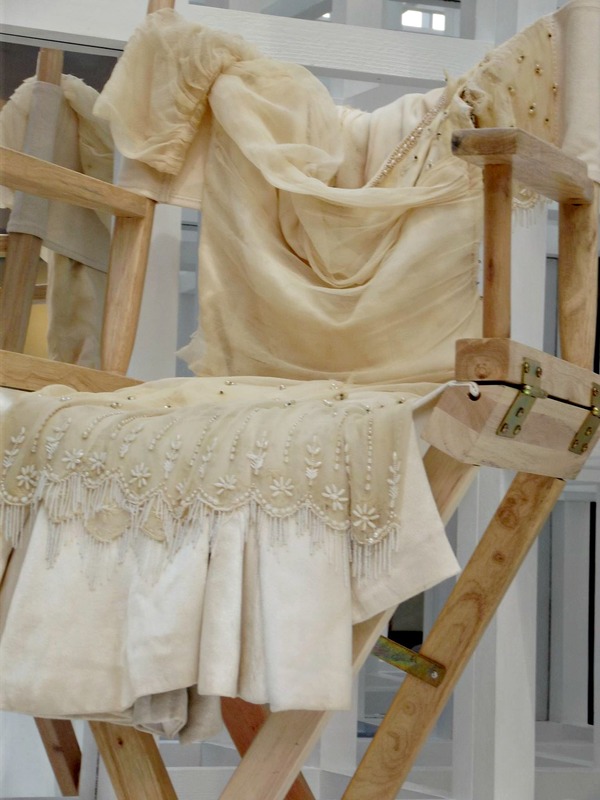 The only thing that was sad to see was The Prince and The Showgirl dress was now displayed on a directors chair instead of a mannequin compared to the last time I saw it. I guess it’s become extremely fragile now, if only sixty years ago people realized how important these costumes would be! 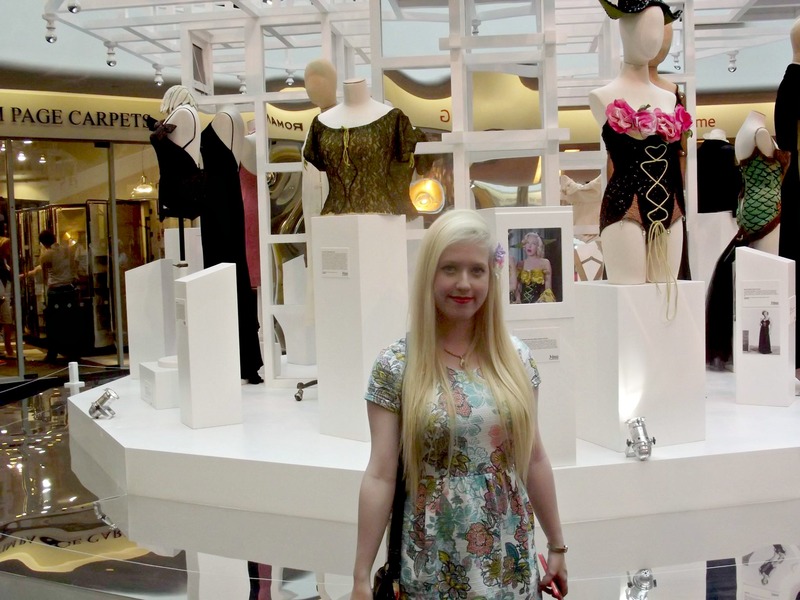 I also wished that all of the clothes had photos of Marilyn wearing them, I have seen her in all but three of the items so it shouldn’t have been to hard to find. 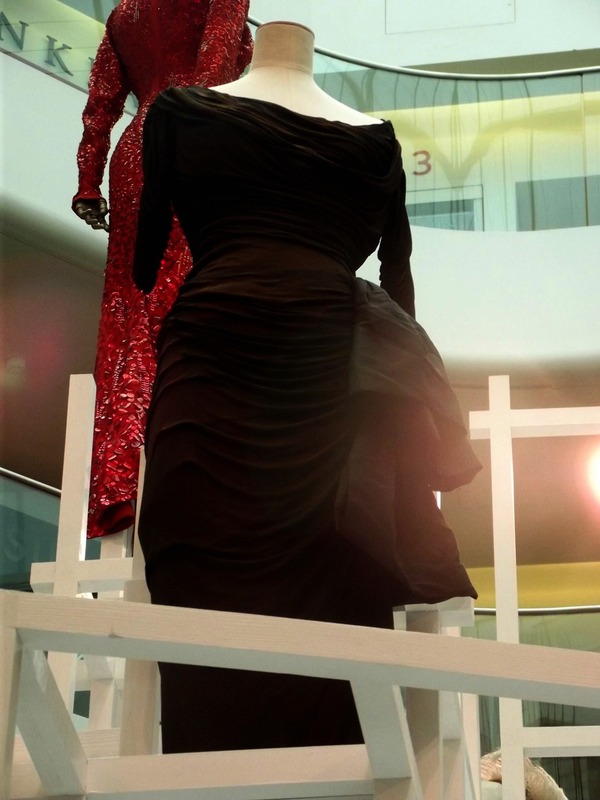 One of my favourites, the costume Marilyn wears for, “There’s No Business Like Show Business” when she sings “After You Get What You Want, You Don’t Want it” was displayed on the upper level. 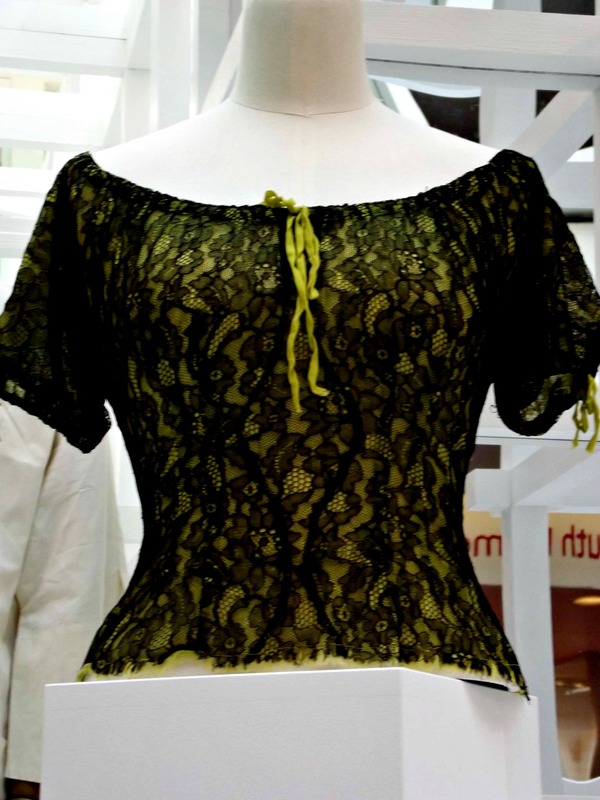 I found this to be a shame as it would have been lovely to be able to have seen the dress with clips from the film of her wearing it like some of the other costumes. 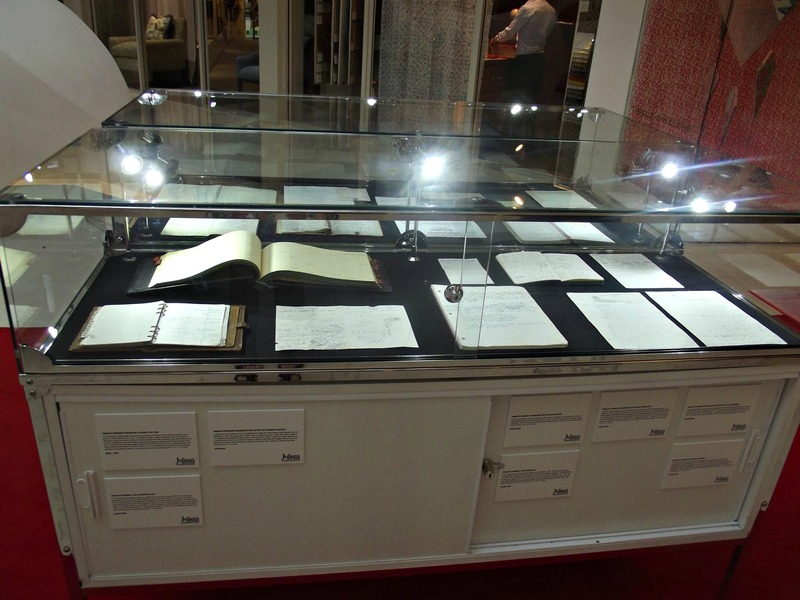 I was fortunate to be able to visit the exhibition twice during my stay in London and when leaving for the final time I felt pretty sad that the majority of the items I will probably never be able to see again. However, I realize how fortunate I am to have had this opportunity and the memories will stay in my heart forever. 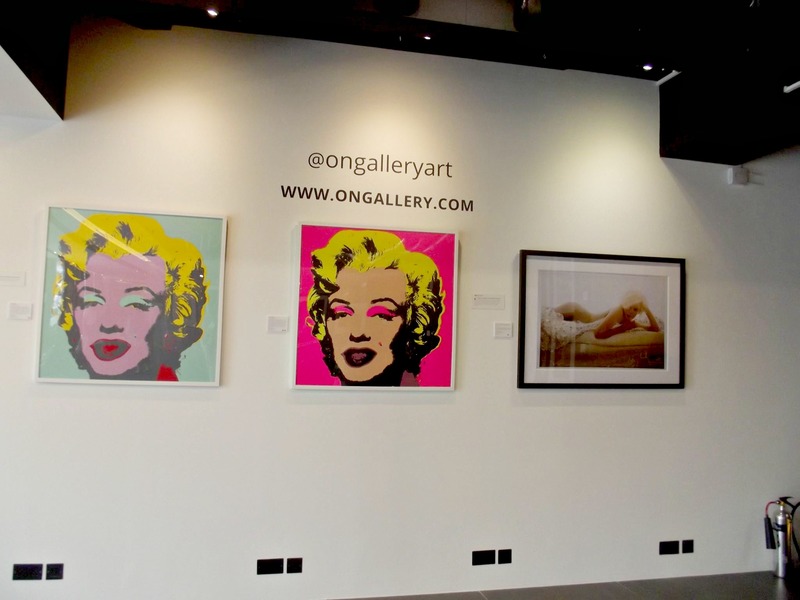 I also managed to visit the ONGallery which is currently displaying the Happy Birthday Miss Monroe exhibit until 30th June. 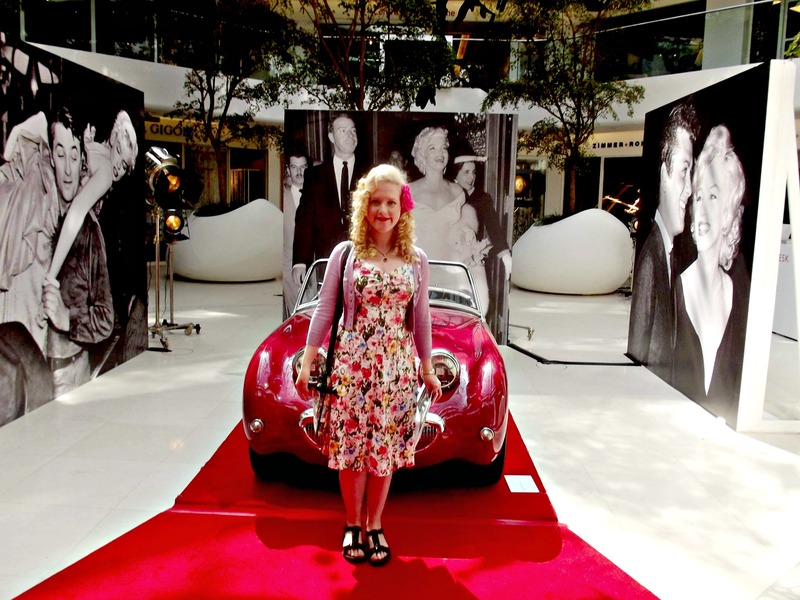 As soon as I walked a lovely staff member named Keith said I was looking very, “Marilynesque” which made my whole day! He realized I was a huge Marilyn fan and he was wonderful to talk to, loved photography and you could tell he appreciated Marilyn as an artist which was very refreshing. 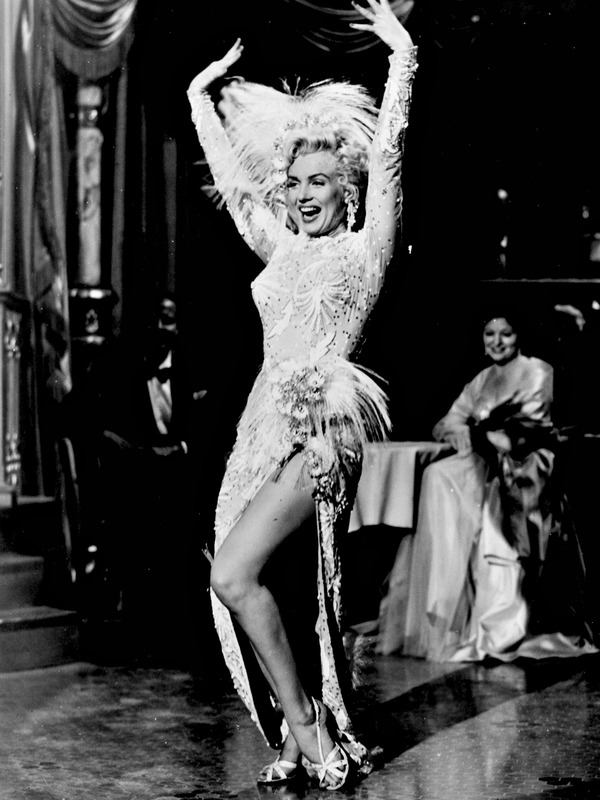 It was so wonderful to see photographs from all of Marilyn’s career, beginning in 1946 and ending in 1962. While I was there I noticed two older men who had been fans since Marilyn was alive and they were very sweet. I was looking through a portfolio of vintage photos and noticed one of them was taking pictures of me! I looked up and he asked me if I was a Marilyn lookalike and I told him that was very sweet but no I wasn’t. He then said that I was absolutely gorgeous and he used to be a portrait photographer so wanted to take my picture. I almost teared up, I’ve rarely had such sweet things said to me face to face. I then heard them asking about a picture that I was looking at from 1952 and I helped identify the event for them, I don’t know why but they reminded me of my Grandad and it really was a lovely moment. I continued to talk a lot with Keith, especially about the Frank Worth photos of Marilyn from 1953 and 1954 which are pretty rare. I told him how I had sent off for the free Marilyn print they offered in the Daily Express for Marilyn’s 90th Birthday and I mentioned an image Worth had taken of Marilyn and Sammy Davis Jr. which was pretty rare. Keith then told me that the image I was talking about was actually offered previously and he would give me a print, I couldn’t believe it! 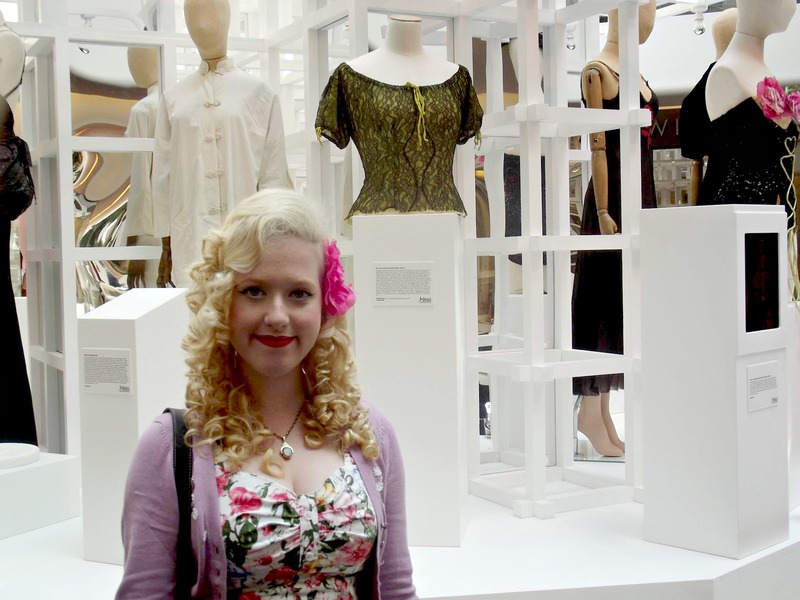 I had such a wonderful time in London and truly recommend both exhibits to all Marilyn fans, actually, I recommend them to everyone! Admissions are free for both events and they are extremely special and simply a must see. It’s hard to believe that today my favourite person, Marilyn Monroe, would be turning 90 years old, it even sounds absurd to say as she is forever etched in our minds as eternally young and beautiful. However, I wish she was here now to see how loved she is, even more so than the fifty fours years ago when she tragically left us. For the past few years I have always made sure to write or blog about Marilyn on her Birthday and Death Anniversary, so if you’ve followed me for the last four years you’ll probably be pretty aware of that. Therefore, I’m not here to say anything new really, I’m just here to speak from my heart because as silly as it made sound to some people, that’s truly where Marilyn will always have a special place. “Respect is one of life’s greatest treasures. I mean, what does it all add up to if you don’t have that? If there is only one thing in my life that I am proud of, it’s that I’ve never been a kept woman.” – Spoken to Photographer George Barris in July 1962. Marilyn came into my life unexpectedly just before my 17th birthday in October 2010, when I picked up a Vanity Fair Issue with her on the front cover as their cover girl. 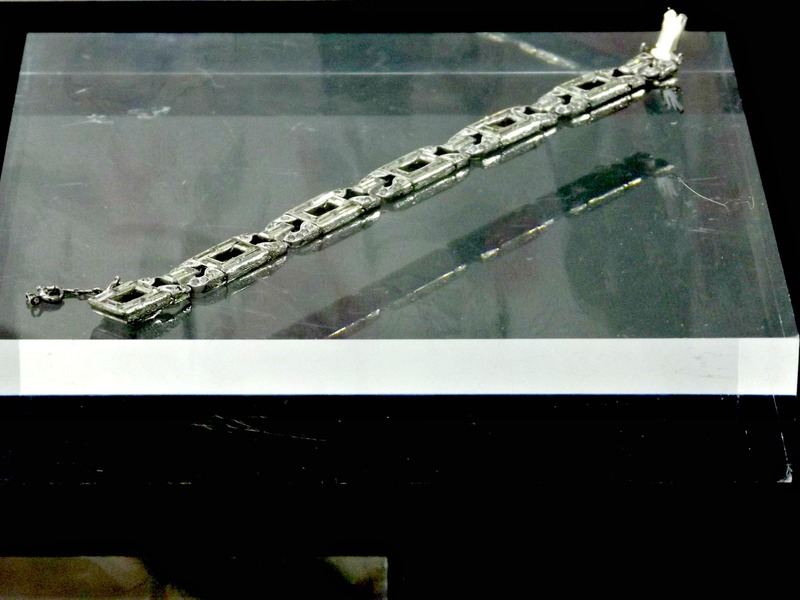 As mentioned before, I’ve told the story numerous times of how I instantly felt connected to her and started my research and I’ve been collecting ever since. I think I’ve always felt attached to the underdog, which ironically, many people probably don’t see Marilyn as. After all, she was viewed as beautiful and loved by all – America’s Sweetheart. 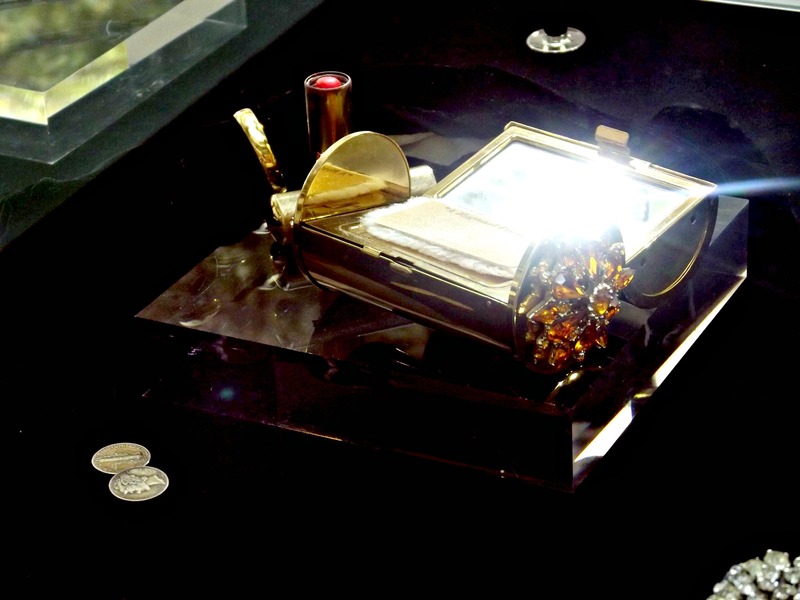 However, when you actually take the time to learn about Marilyn, you realize she succeeded against extreme odds. 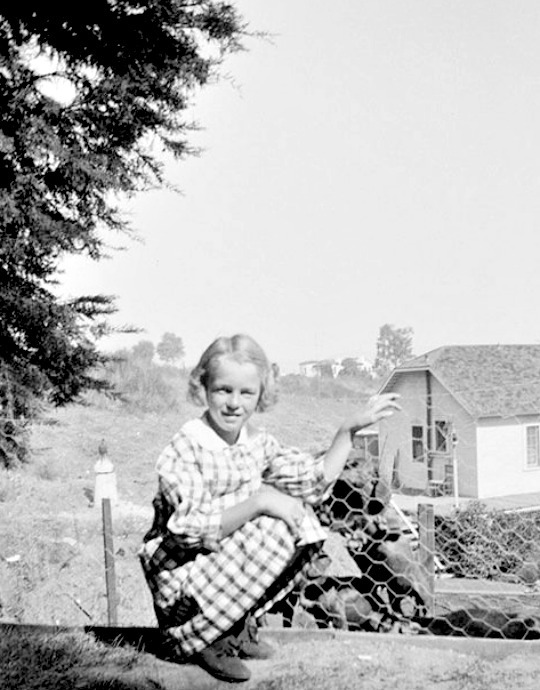 She came from a broken home, was an illegitimate child to a mother who suffered with paranoid schizophrenia and after the first seven years of her life with the Bolender family, Marilyn was shifted around to various different guardians and even an orphanage. She suffered physical and emotional abuse, anxiety, depression and insomnia but never let any of this stand in the way of achieving her dreams. – Spoken to Richard Meryman for Life Magazine in July 1962. 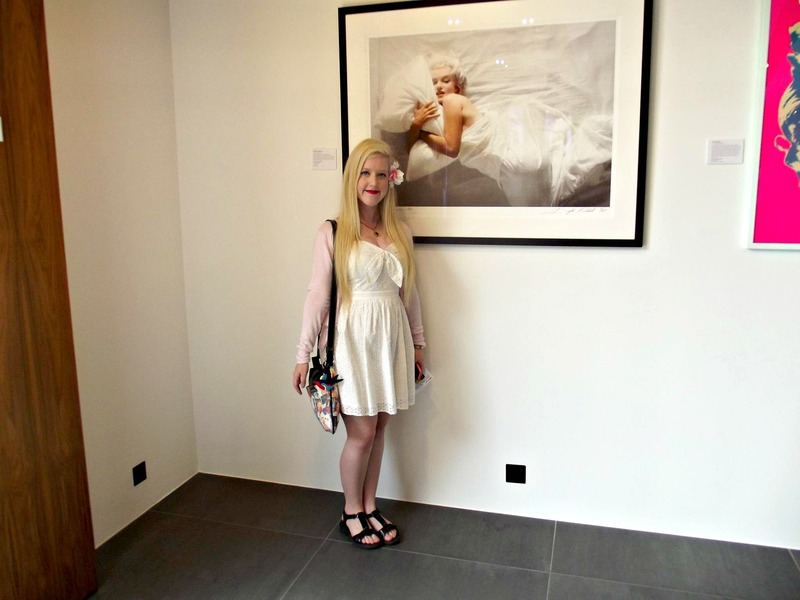 I also owe Marilyn a lot of thank yous as since discovering her in October 2010 and setting up my blog, alwaysmarilynmonroe I have met so many incredible people and experienced so many wonderful memories. Not only did I find an inspiration for each day, I found a Guardian Angel, someone who would always be there in spirit and never judge or upset me. Someone who could cheer me up by just watching one of their films or seeing a photo and someone who went through so much but never gave up on herself even in her toughest times. Sadly so many look at Marilyn as a victim, due to the endless conspiracies, (thanks Norman Mailer) and her young death which makes me really frustrated as in doing this they miss out on an incredible person. 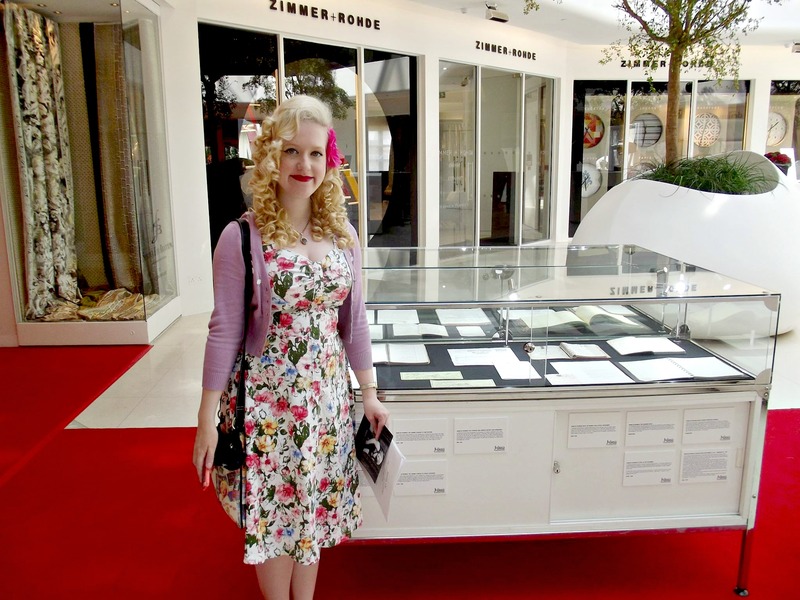 They view her as just a pretty face and a little dumb blonde when it reality this blonde was an avid reader, with a library of over 400 books ranging from Russian Literature to Psychology. They’ll call her a drug addict without having any compassion or understanding for her debilitating anxiety, depression and insomnia. They’ll hear about how hard she could be to work with or her lateness without knowing she suffered such extreme anxieties that she would often stay in her dressing room terrified to act a scene encase she messed up. Many even think she was playing herself on the screen and have little respect for her talent, thinking, “How can someone so beautiful be a good actress?” The irony being if they did some legitimate research they’d realize she was probably the greatest of them all as she’s fooled so many people for all of these years that she is the person they all perceive her as. Another year has gone by and Marilyn’s star keeps growing brighter and brighter, people are still fascinated and enthralled by this beautiful soul. 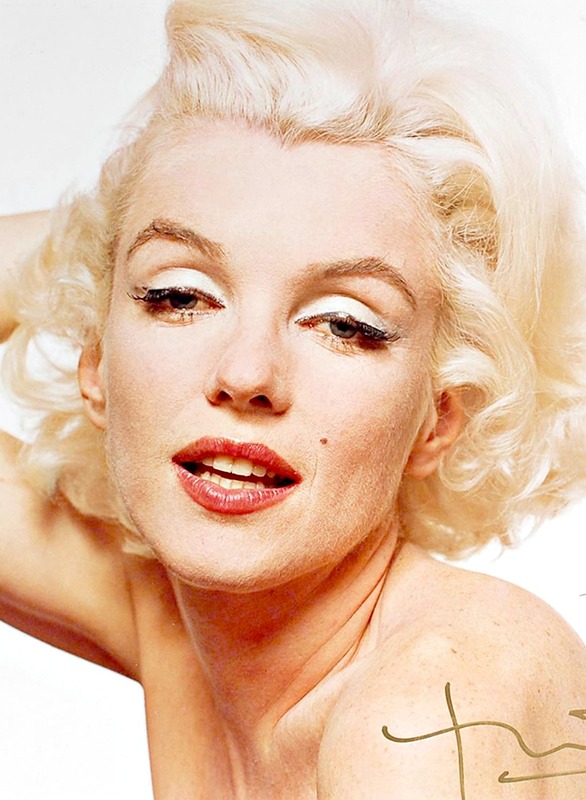 Did Marilyn have her faults? Of course she did, it’s hard to believe, I know, but she was a human being just like us. 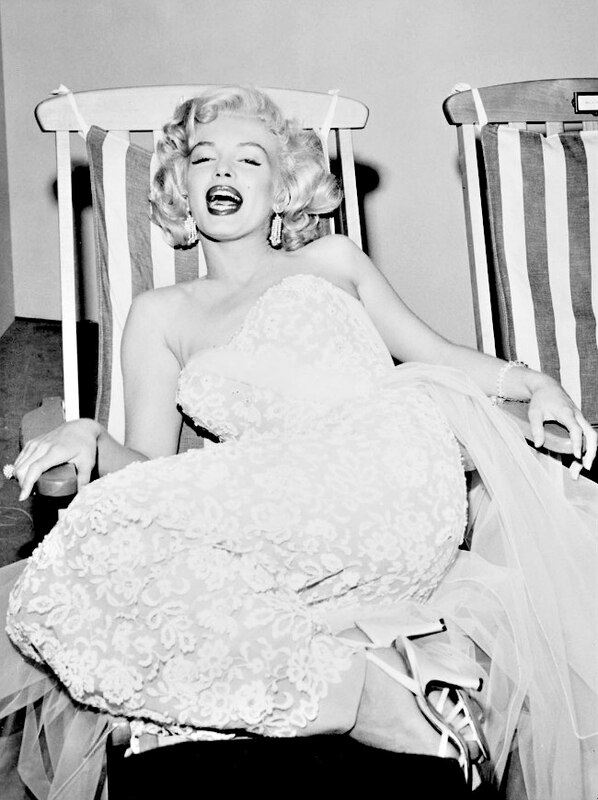 I love Marilyn for Marilyn and that will never change. I’d like to think that there are more genuine fans who love and respect Marilyn then conspiracy lovers who just follow their ignorance. If I could hope of anything to come from this article it’s respect for Marilyn and maybe a little more compassion and understanding. She was a woman ahead of her time, a talented artist, a caring and sensitive soul but mostly importantly, she was a beautiful person. “Fifty years on, we’re still watching her movies and talking about her. That’s not a dumb woman – trust me!” – Lauren Bacall to TCM in 2005.